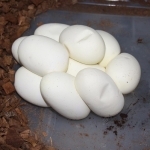 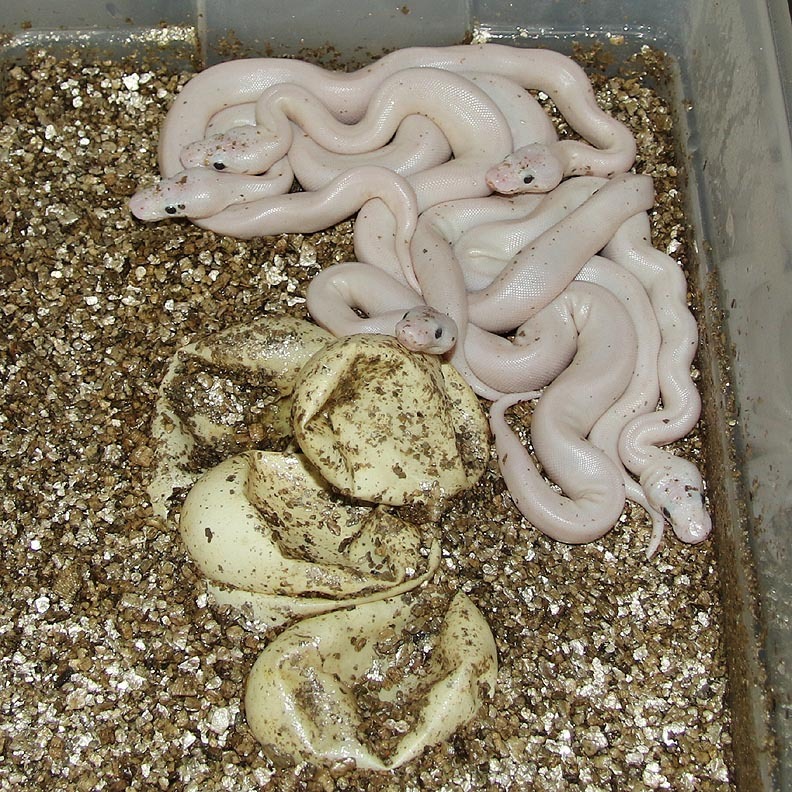 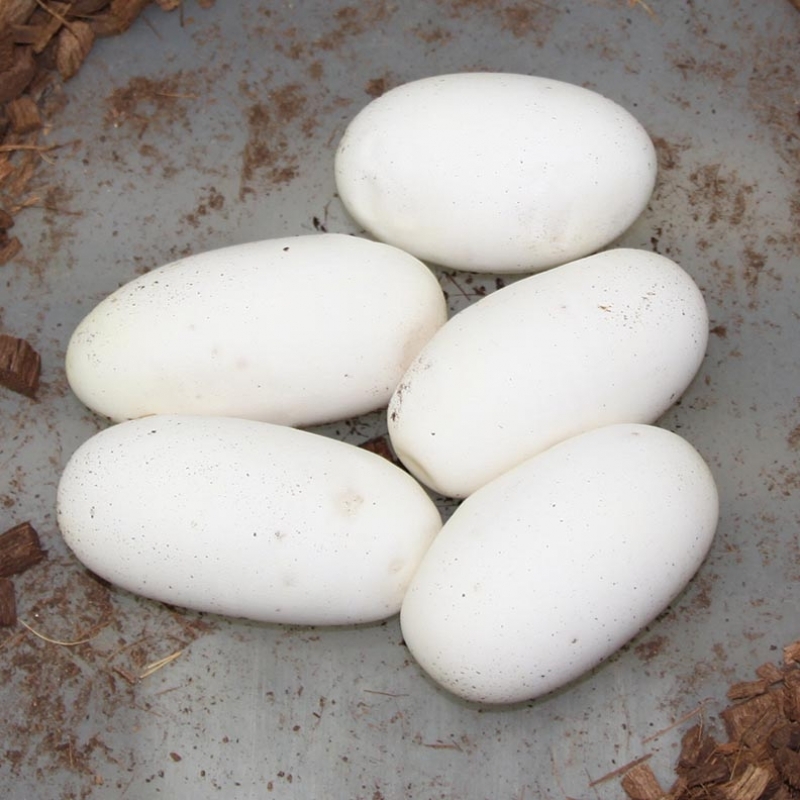 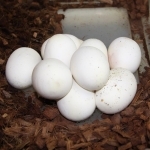 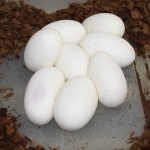 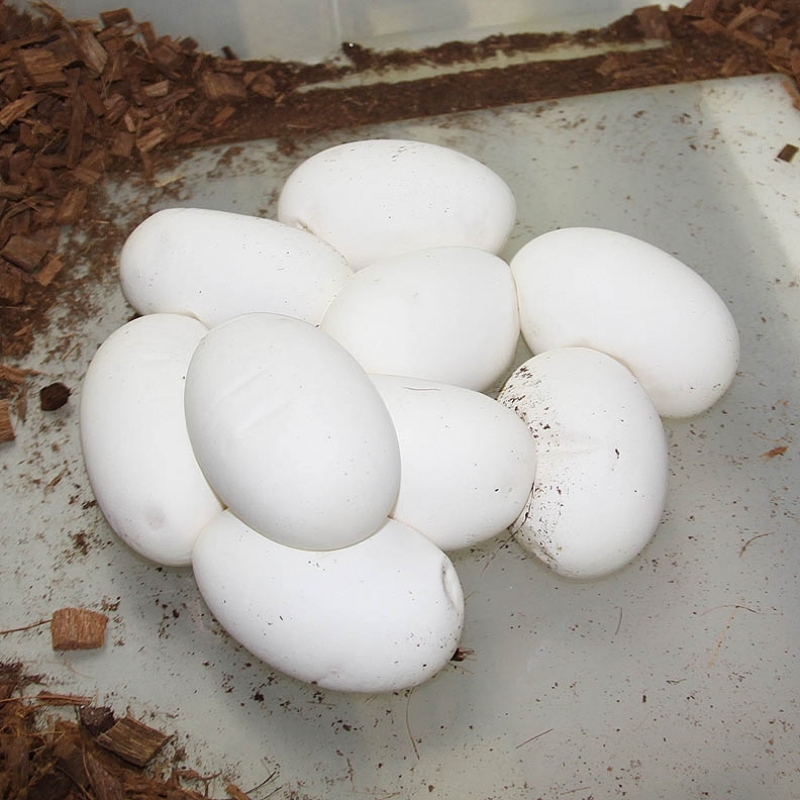 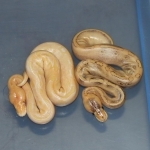 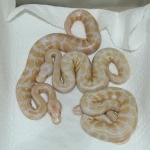 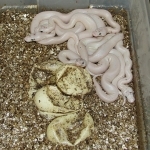 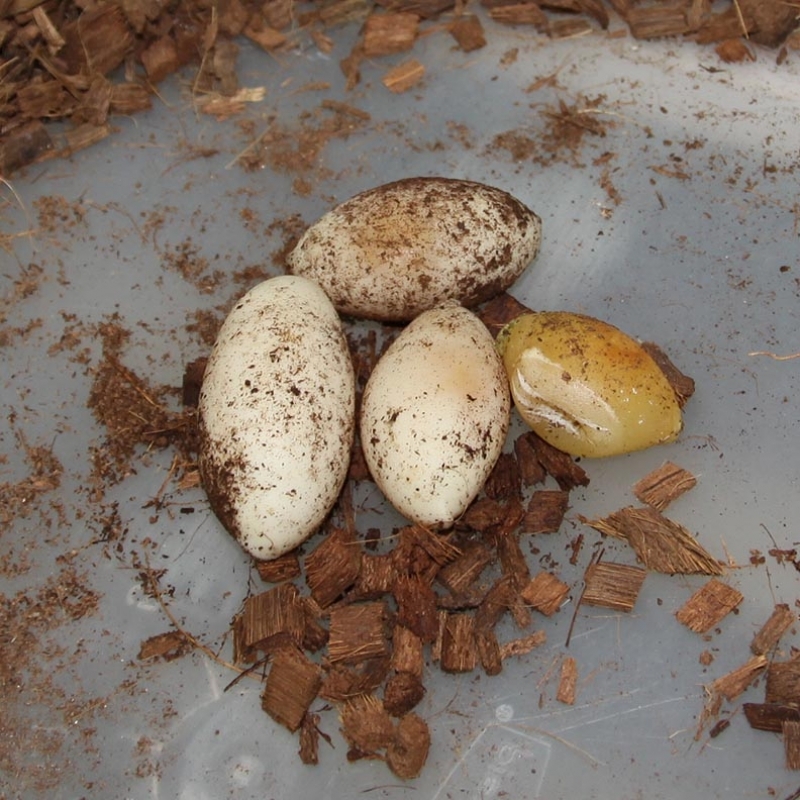 Description: Mahogany Het Albino 3/13 x Mahogany Het Albino 1/13. 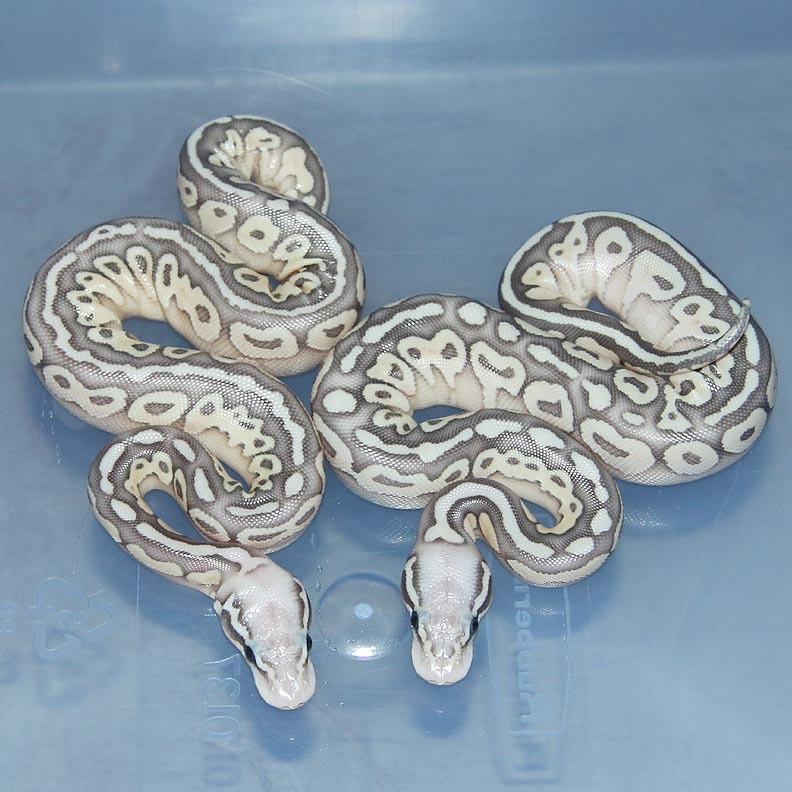 These guys were produced back in 2013 from my SUMA male. 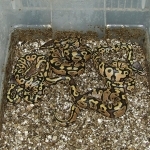 Description: Lesser Caramel 1/12 x Het RA Het Caramel 3/09. 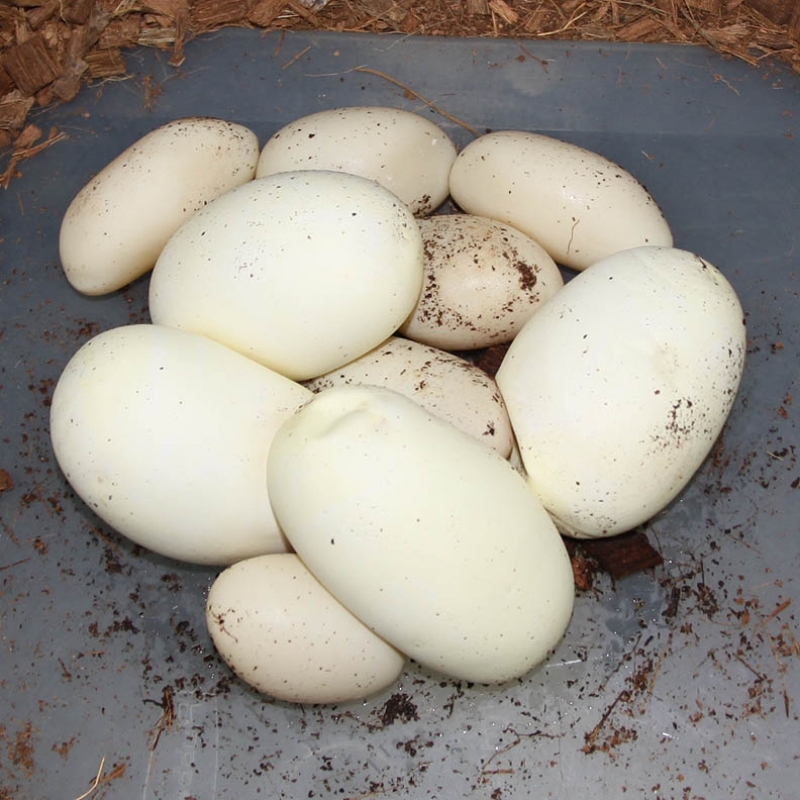 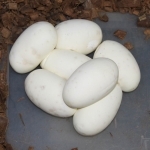 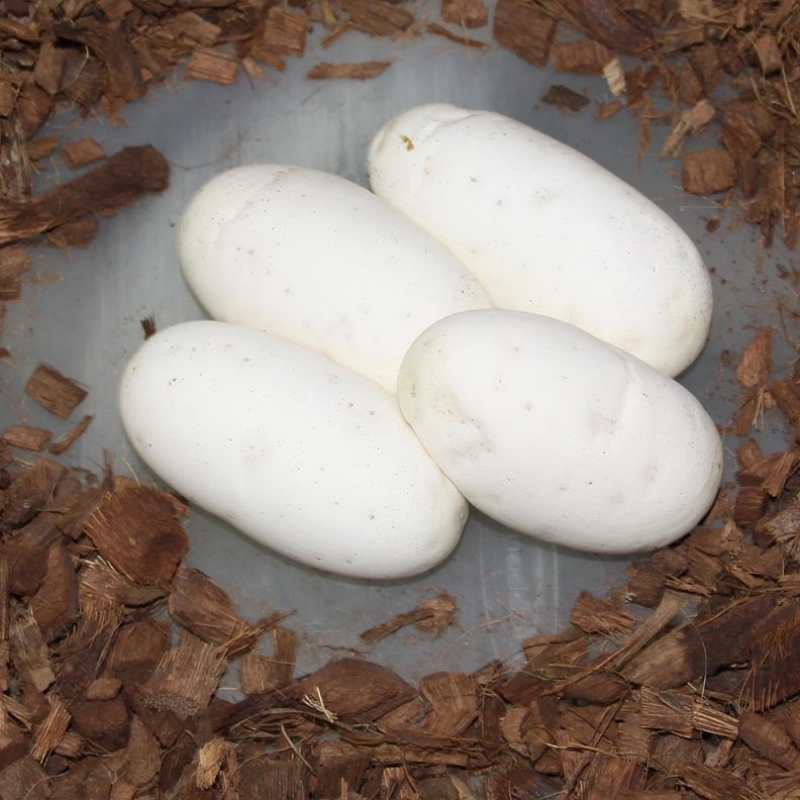 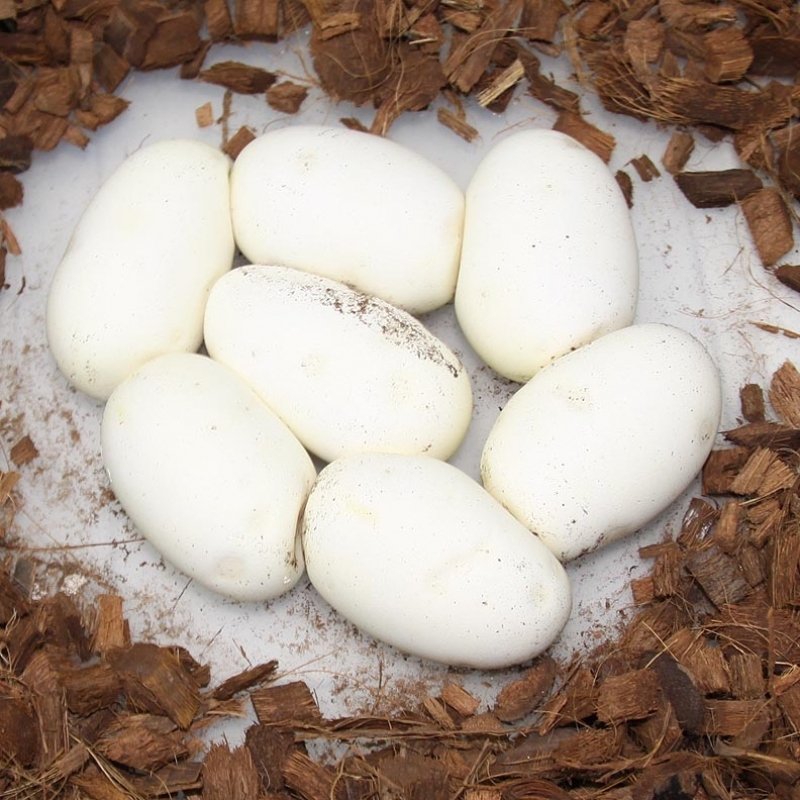 Description: Pastel Het RA DH OG/Pied 1/13 x DH OG/Pied 3/11. 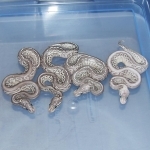 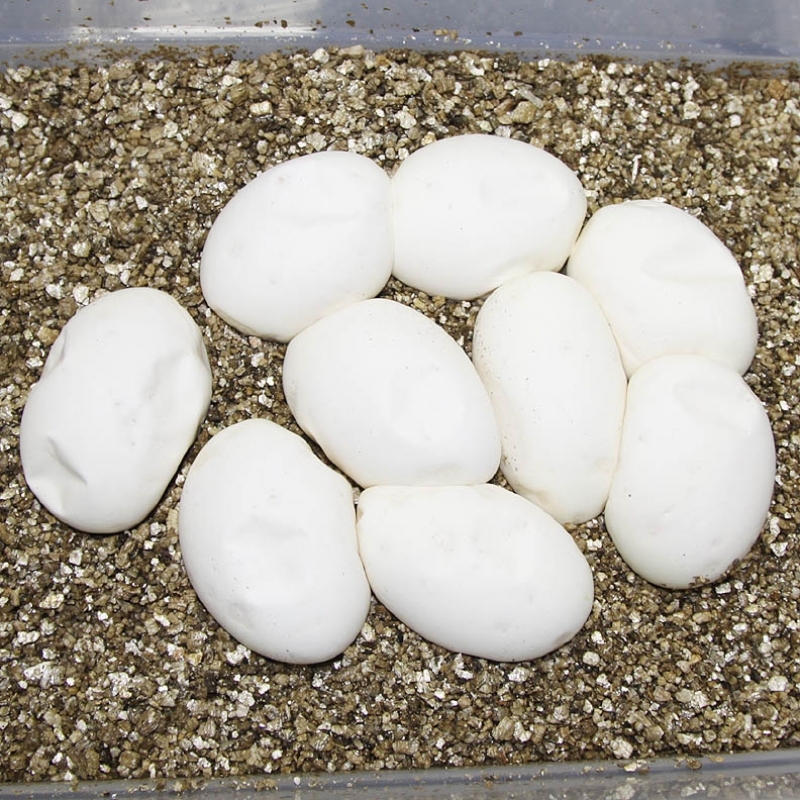 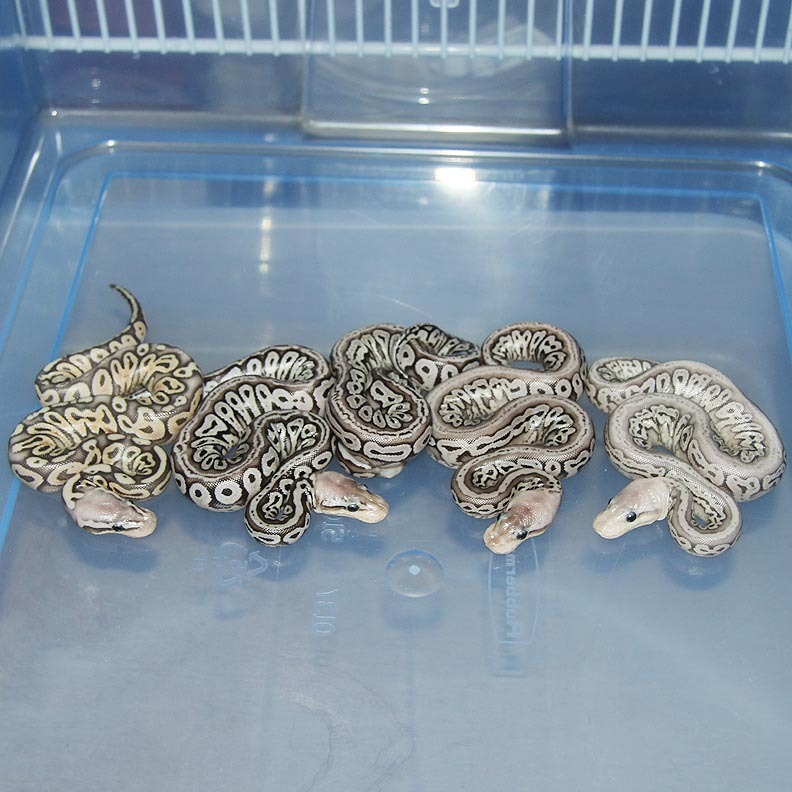 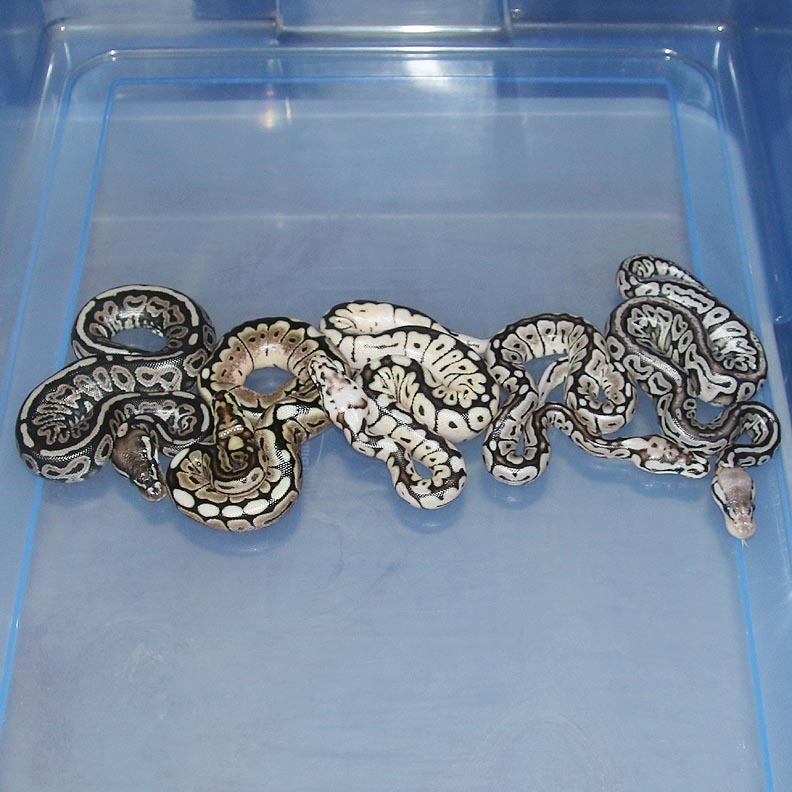 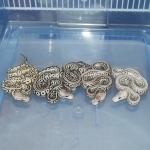 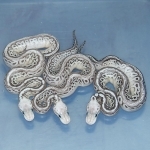 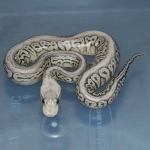 Description: Pastel Lesser DH Green Ghost/Genetic Stripe 2/11 x Super Pastel Lesser DH Green Ghost/Genetic Stripe 1/11. 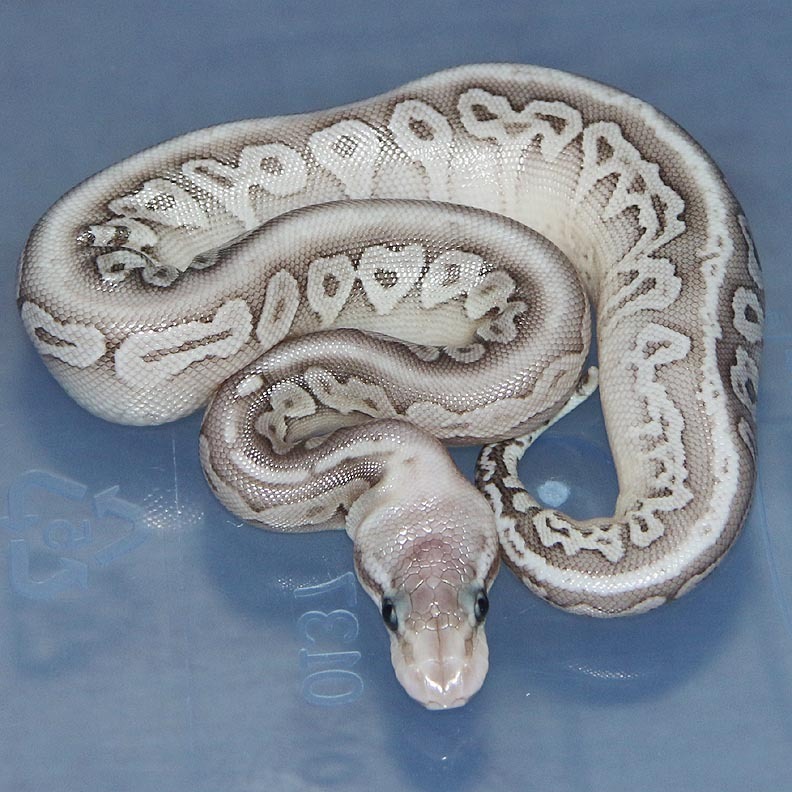 0.1 Pastel Lesser Pos DH GG/GS. 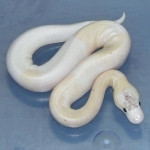 Description: Super Phantom 6/10 x Phantom 4/10. 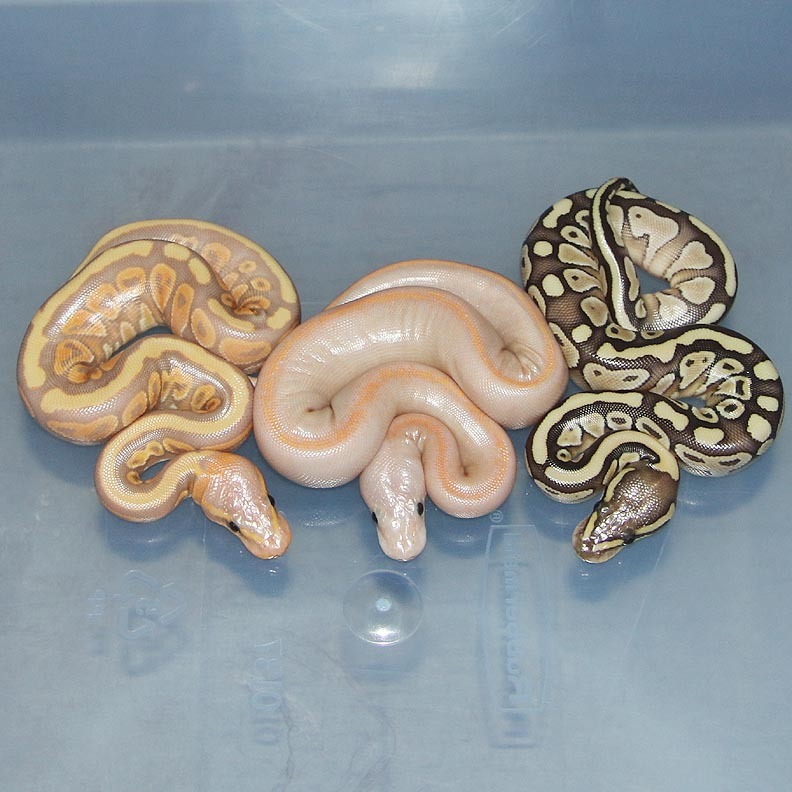 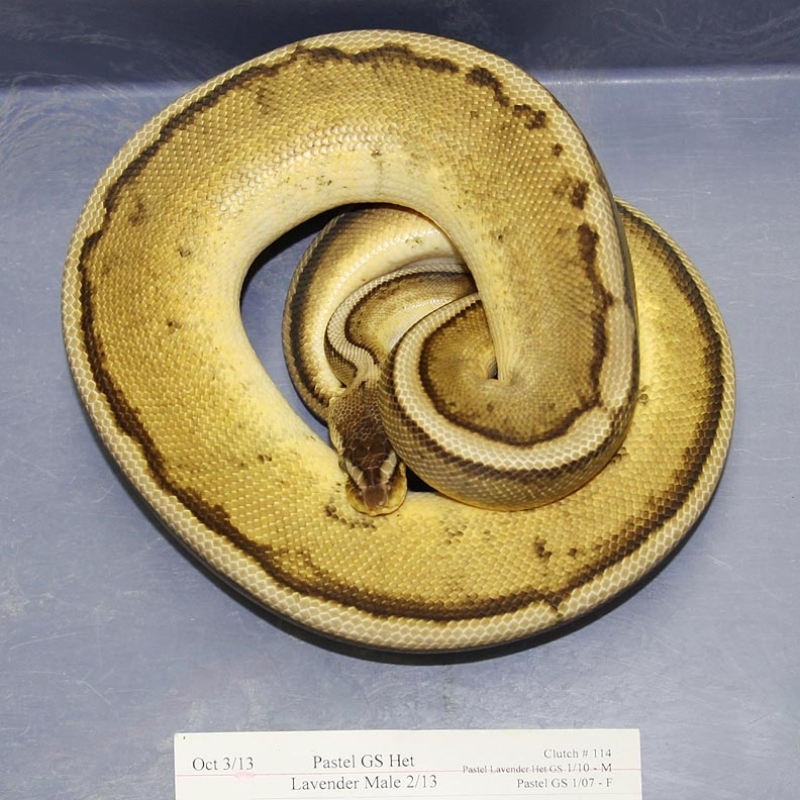 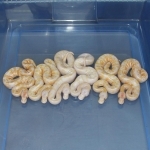 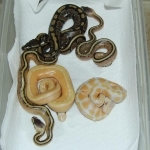 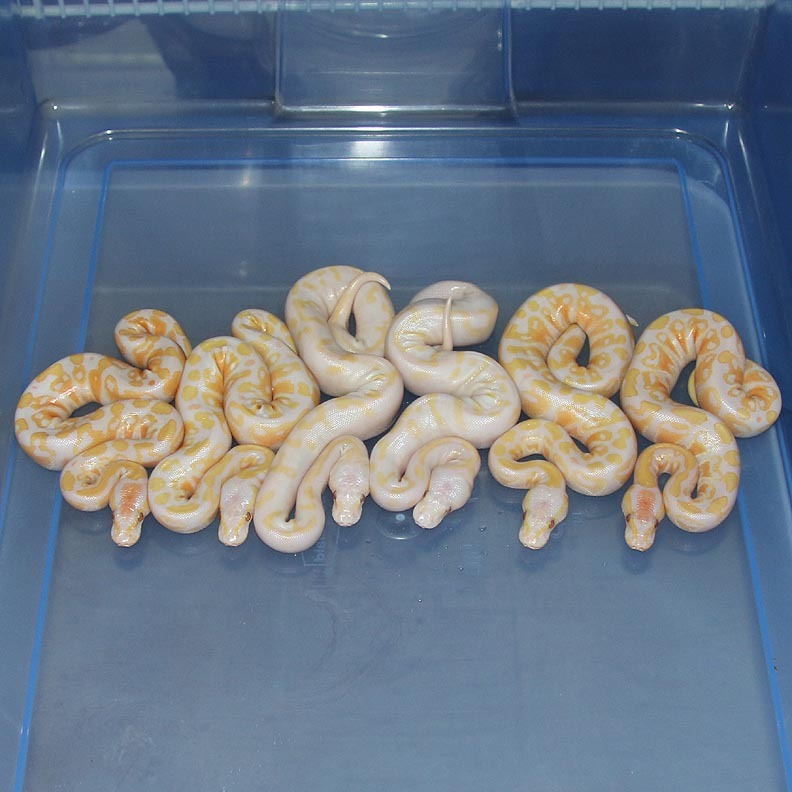 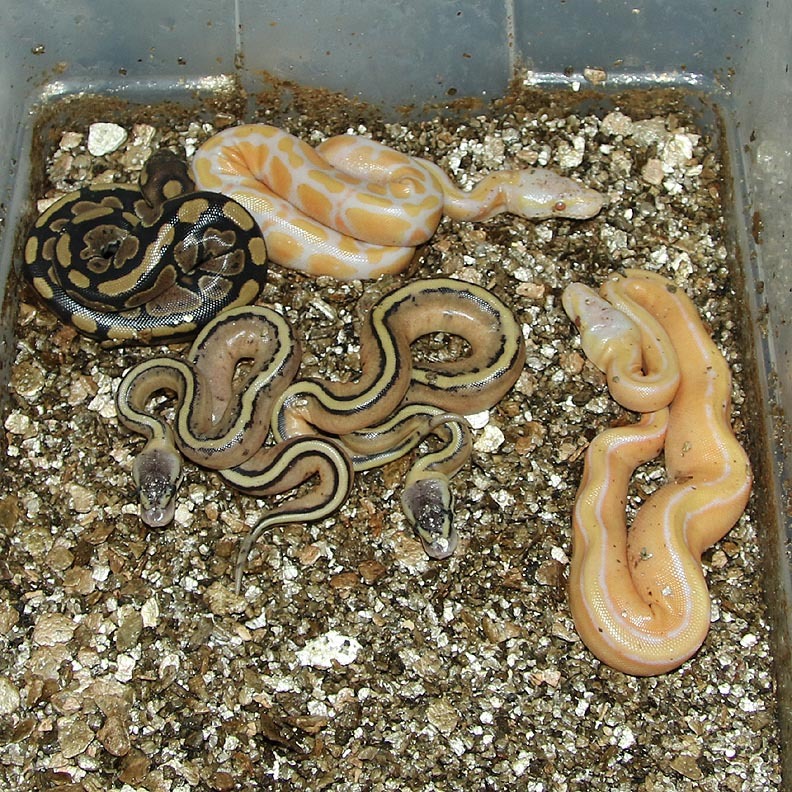 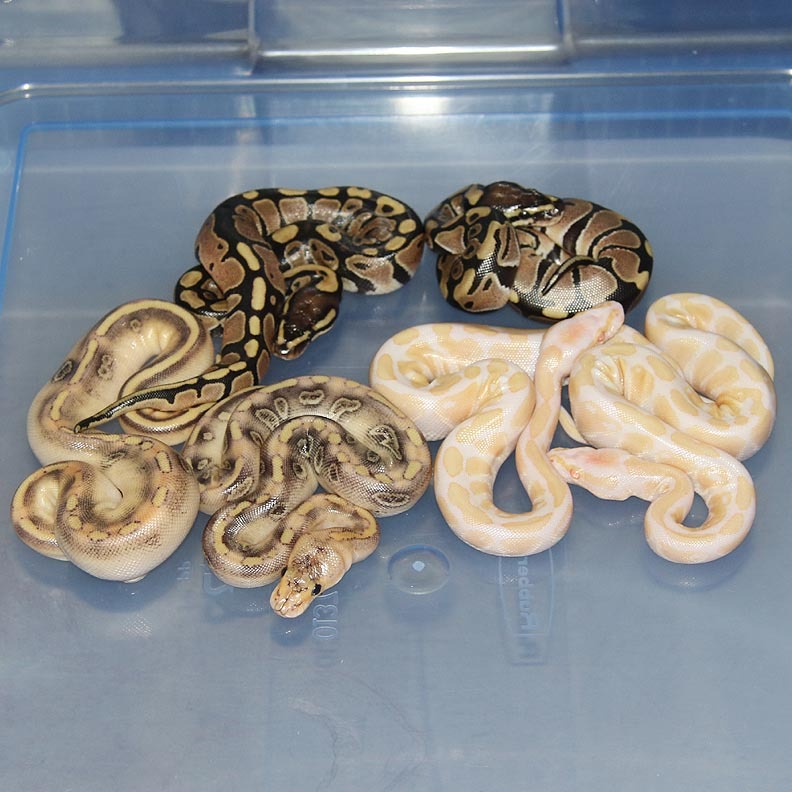 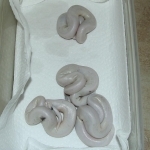 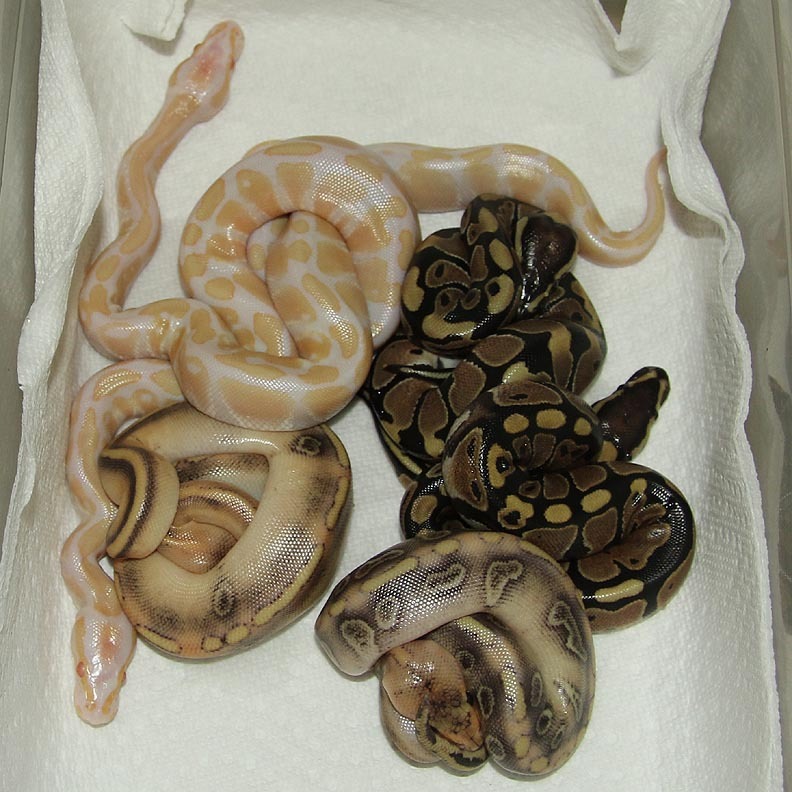 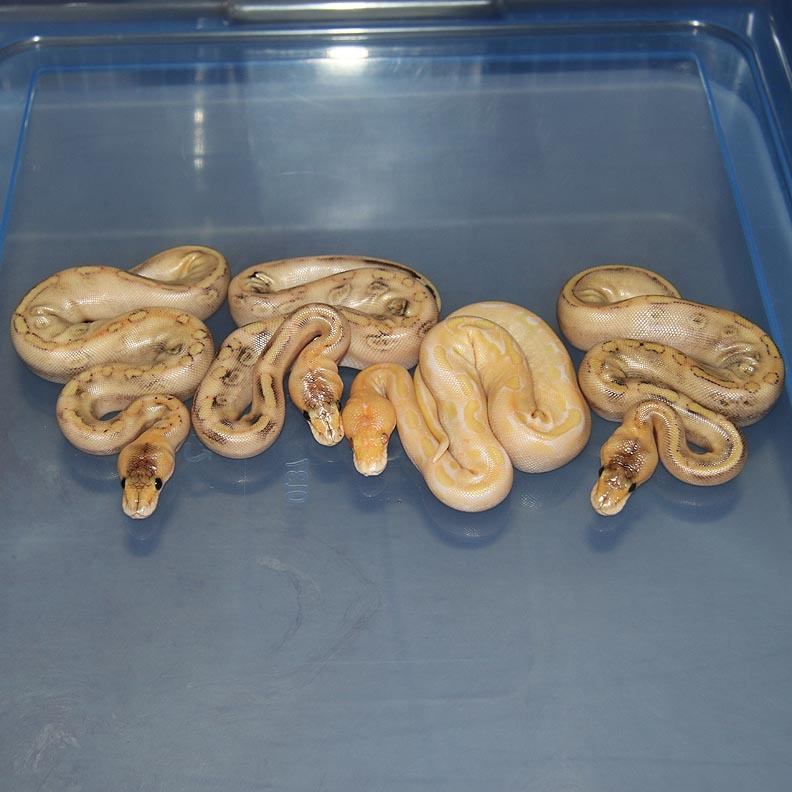 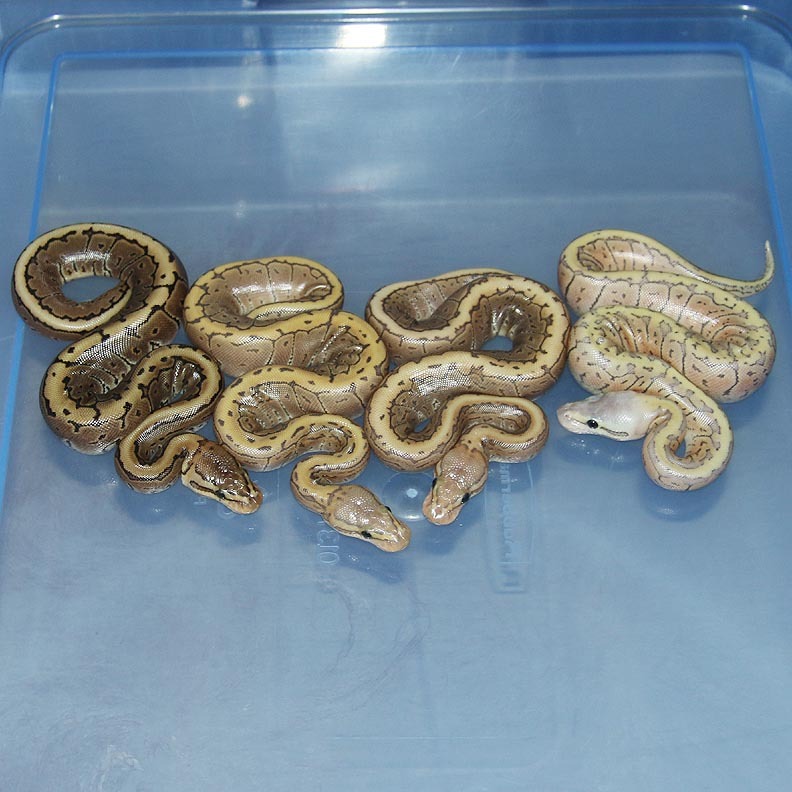 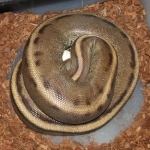 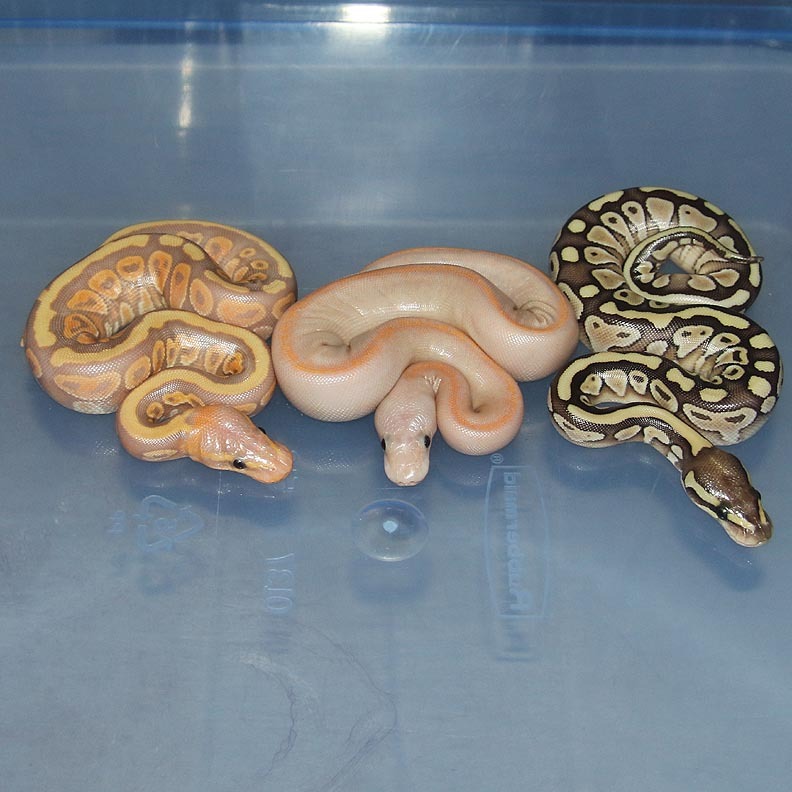 Description: Lesser Het Caramel 1/12 x Pastel Caramel Kinked 1/10. 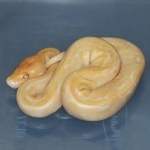 Description: Mutation X Red Axanthic 1/13 x Pastel Sugar 1/10 "Henry". 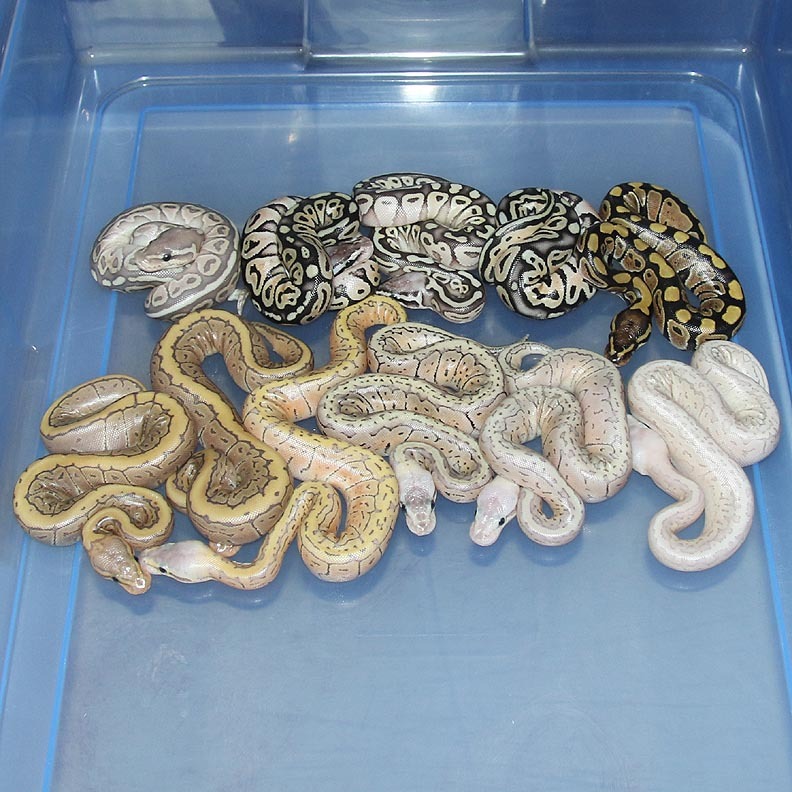 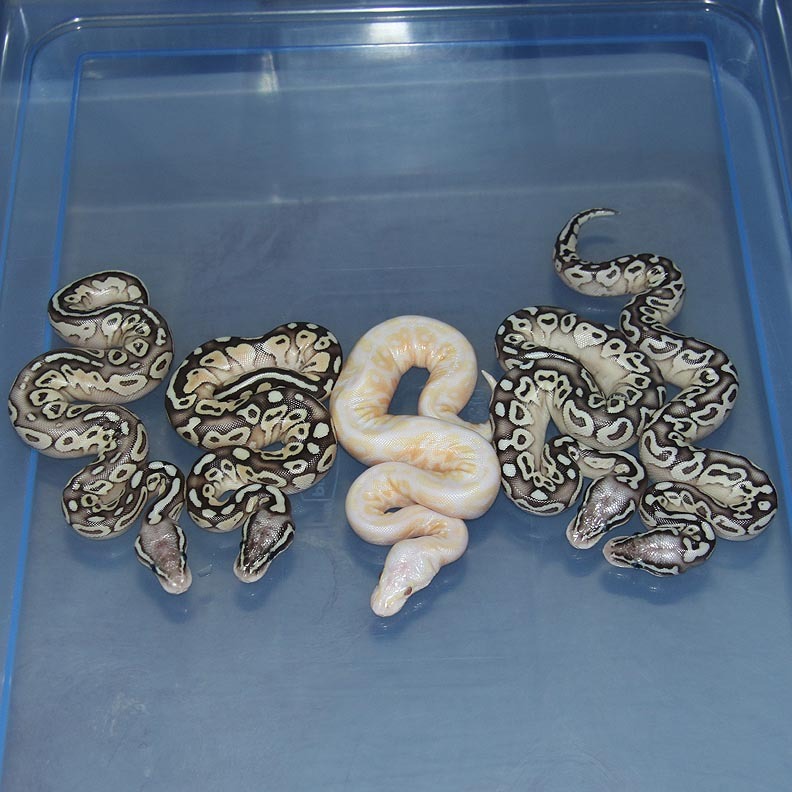 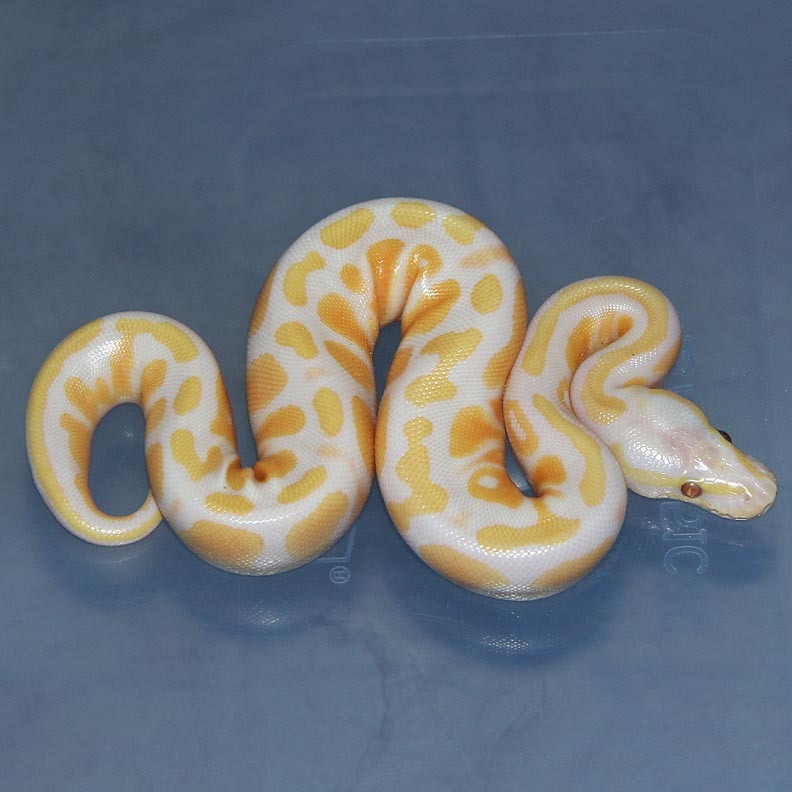 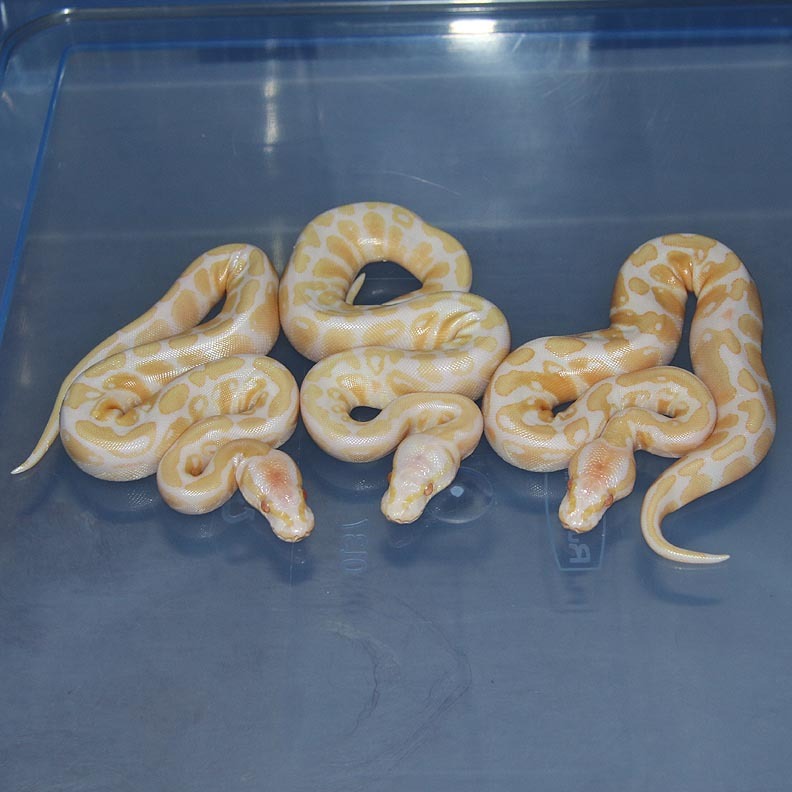 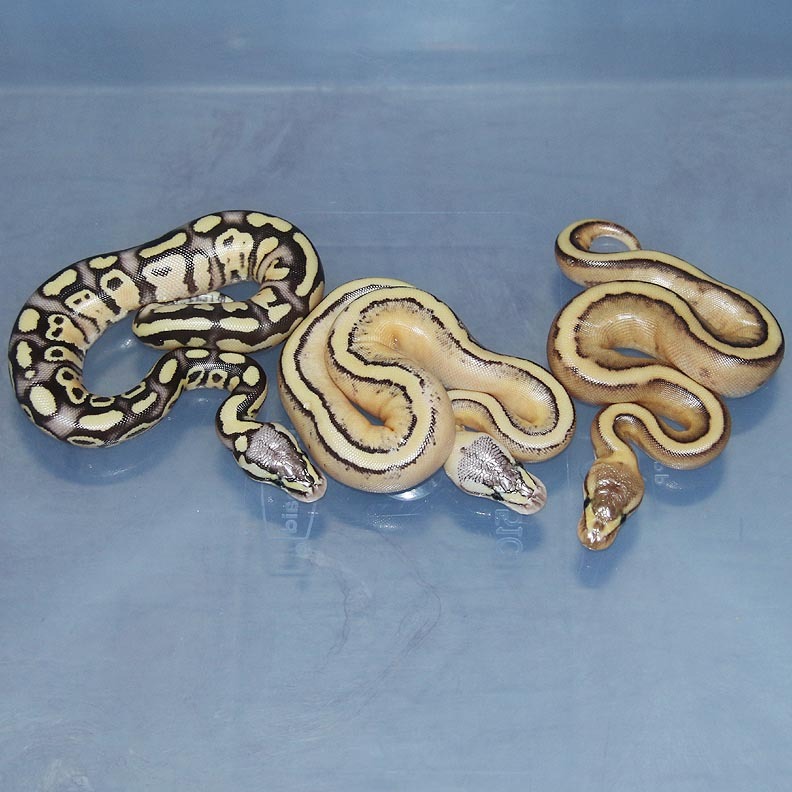 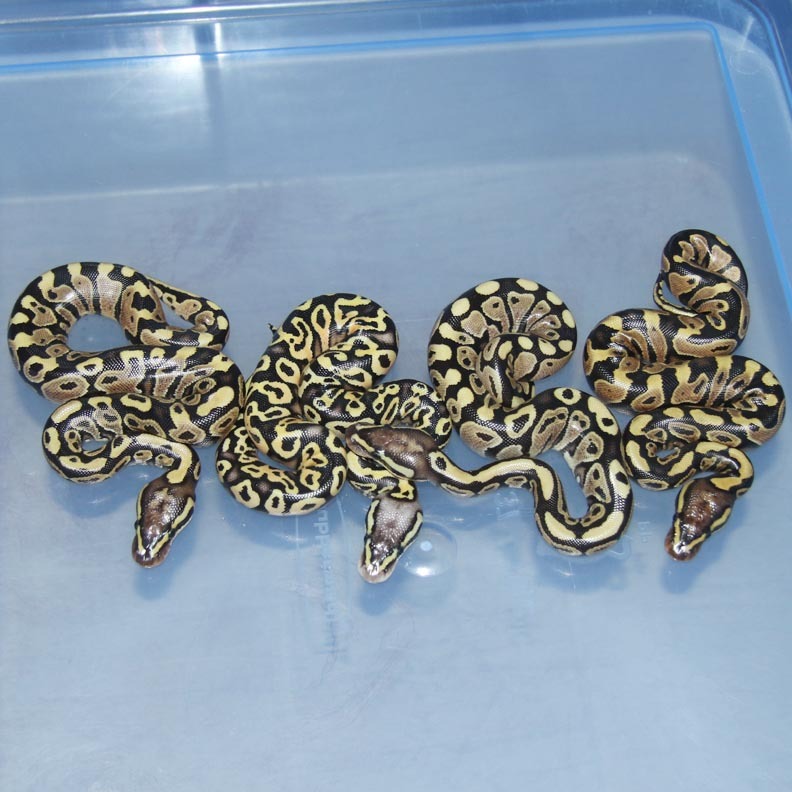 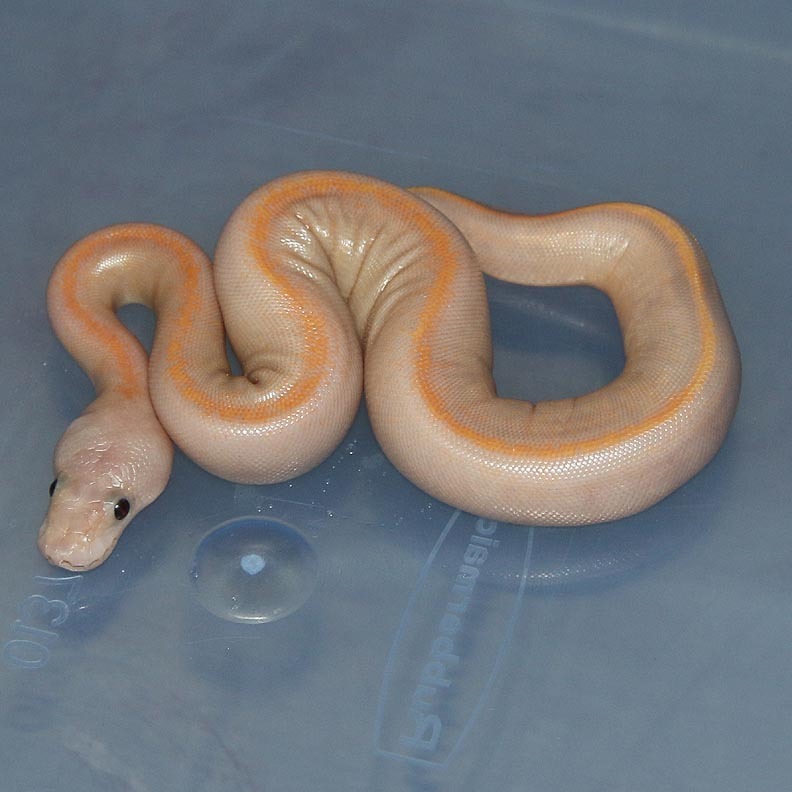 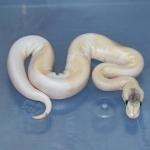 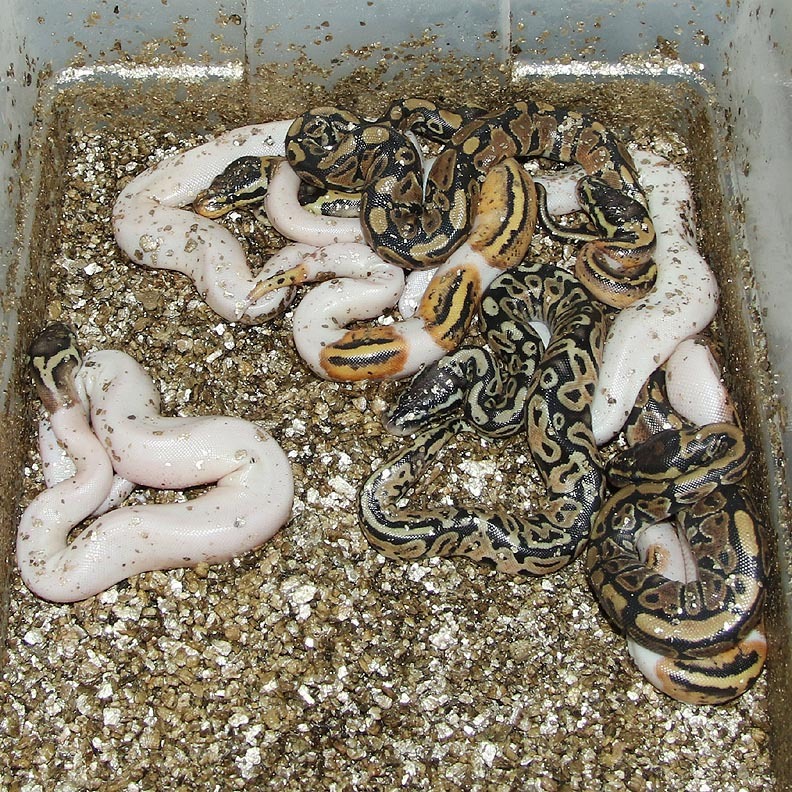 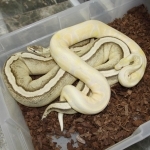 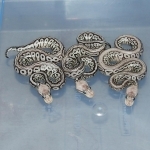 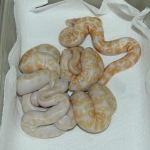 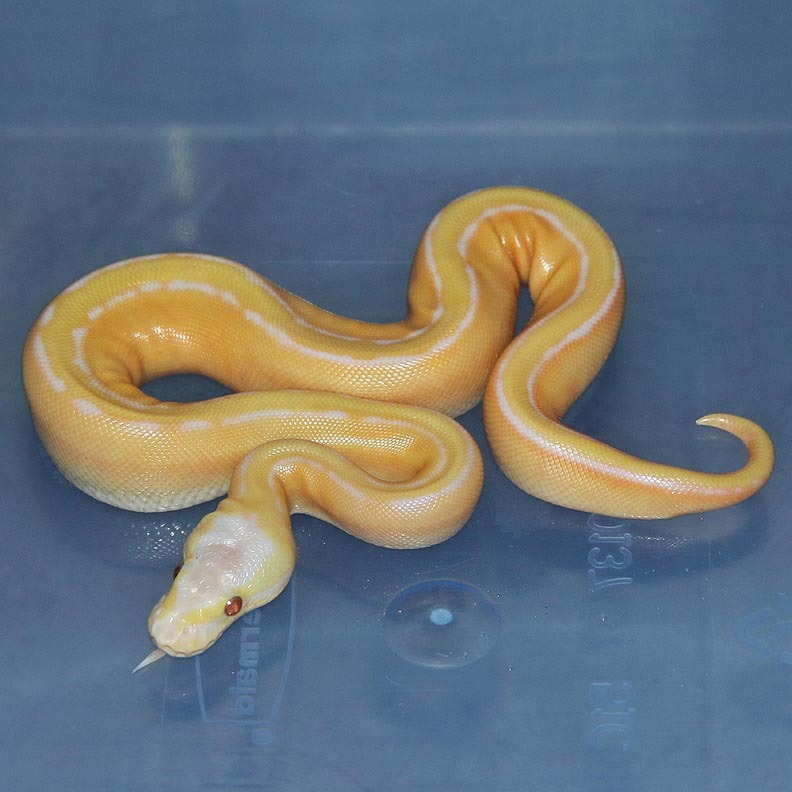 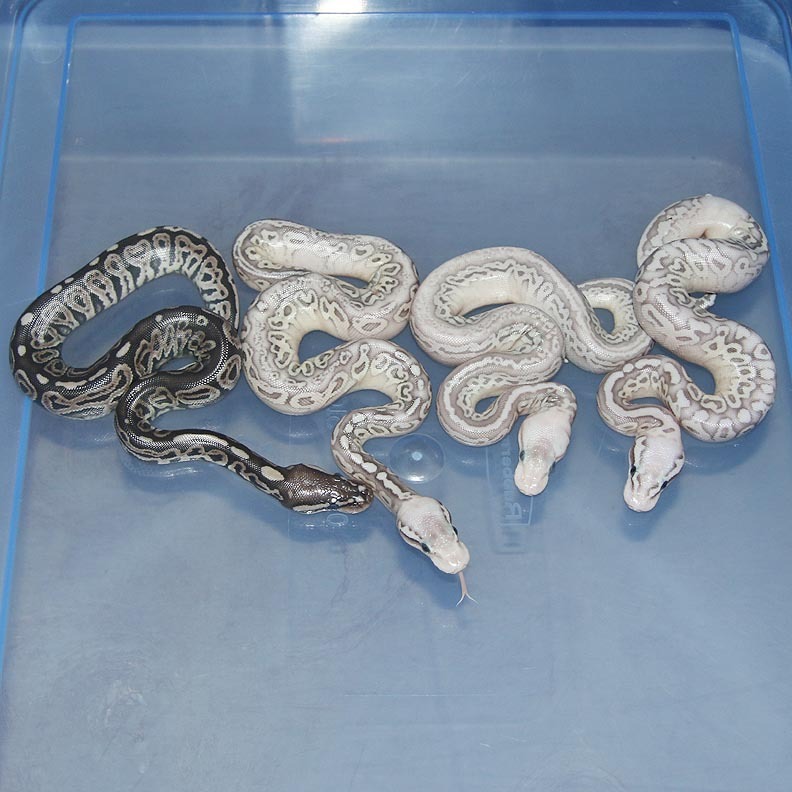 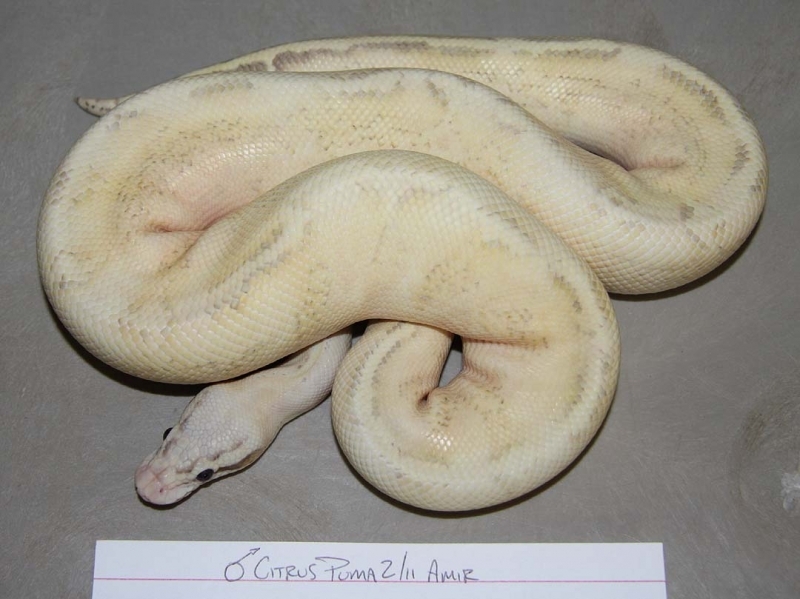 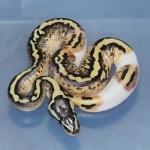 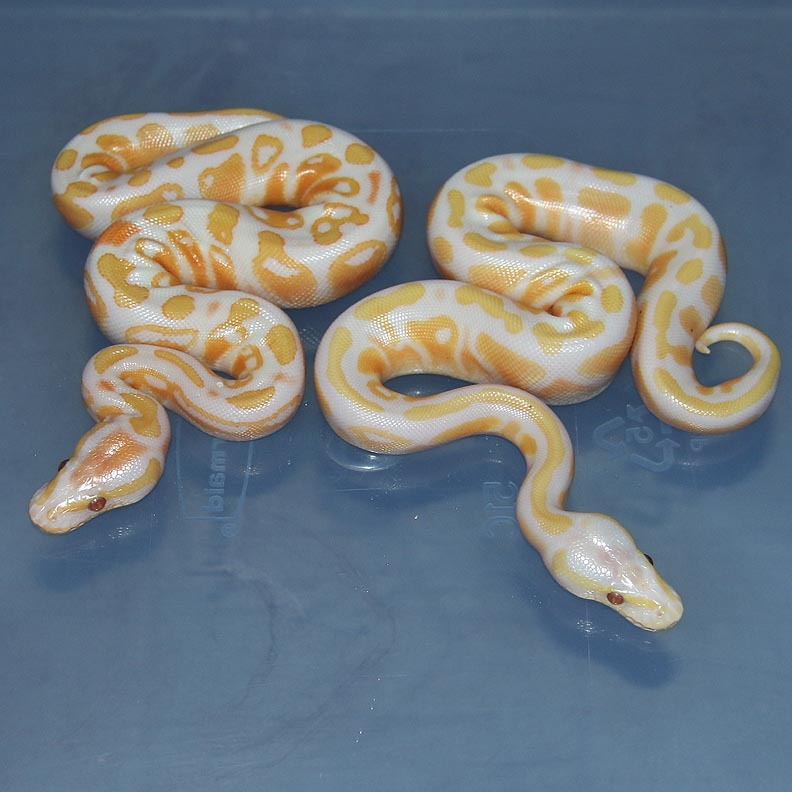 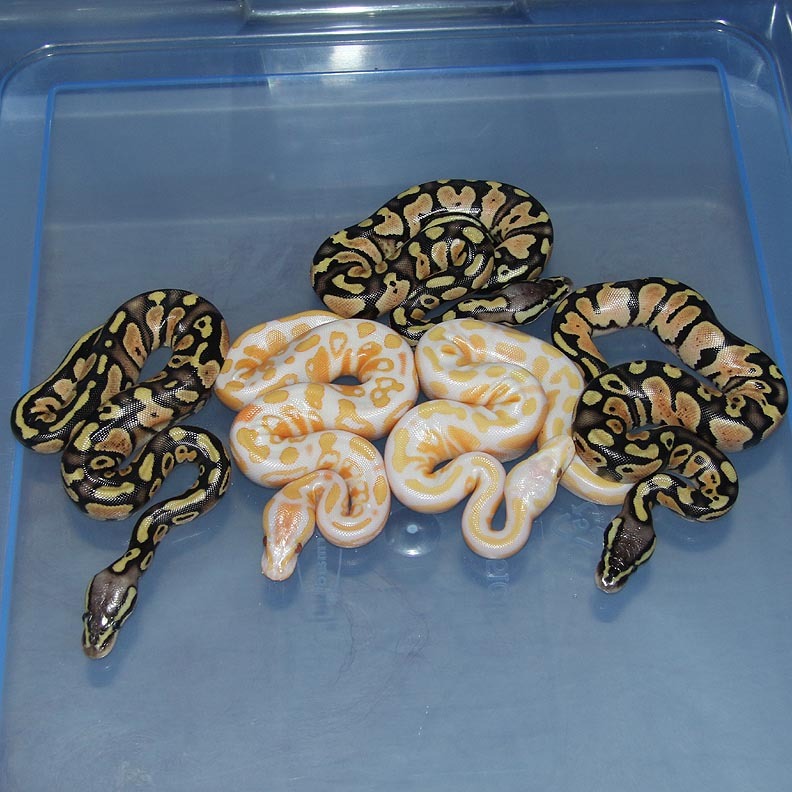 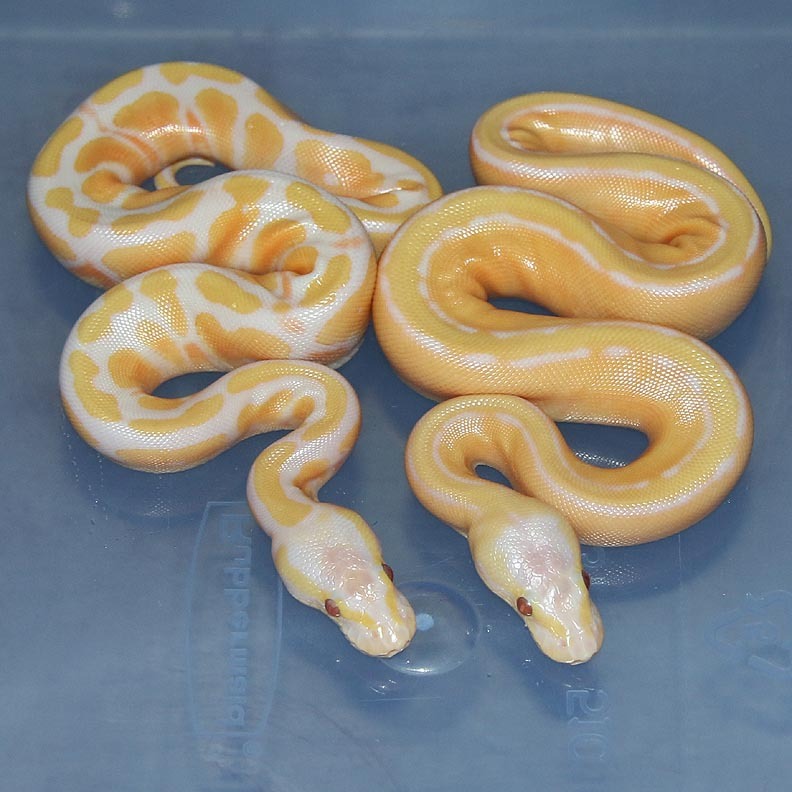 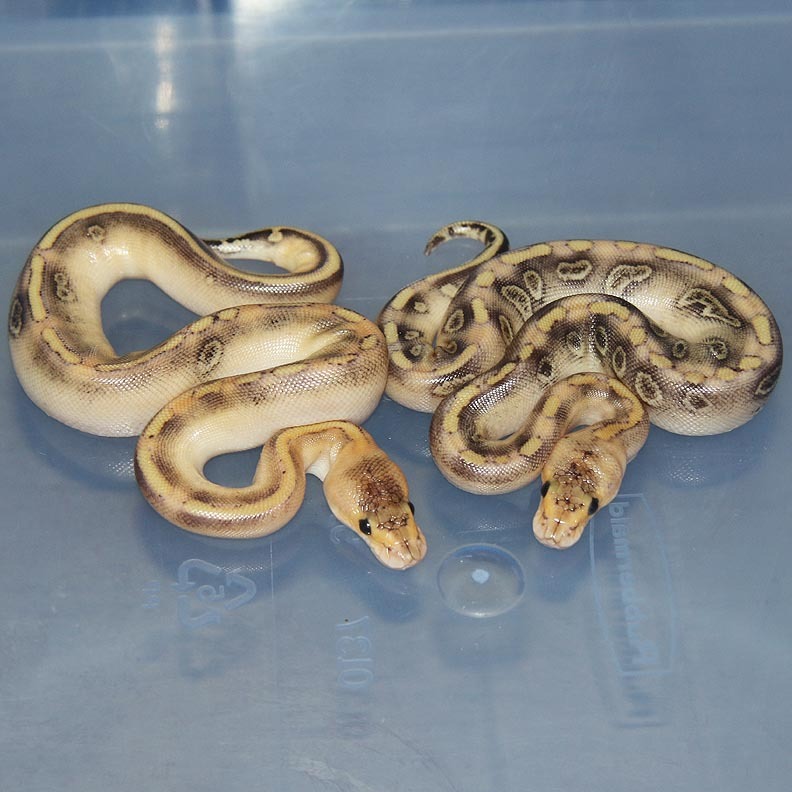 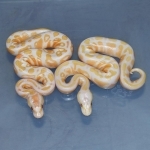 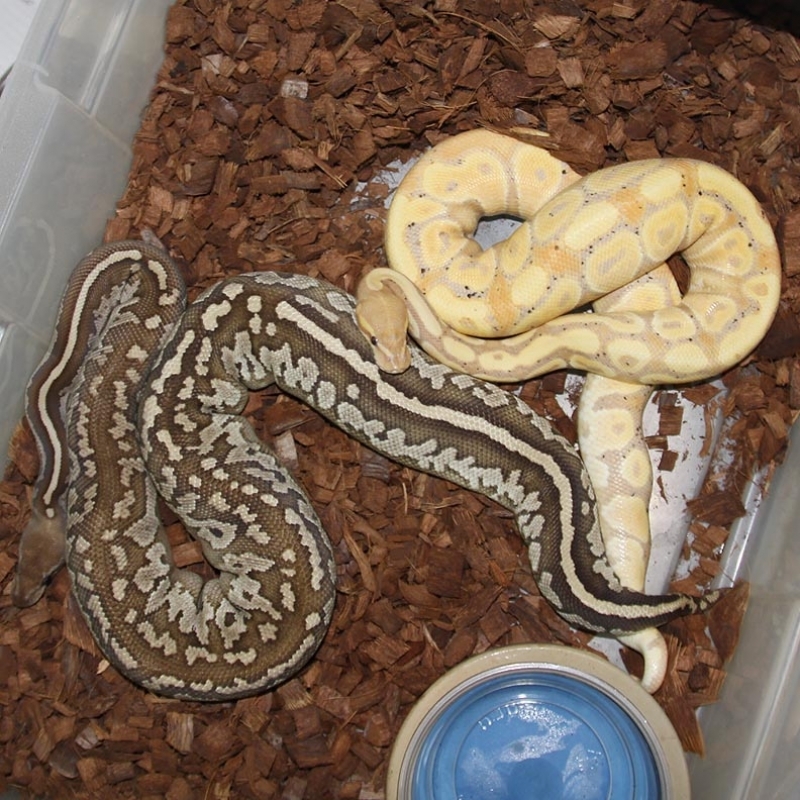 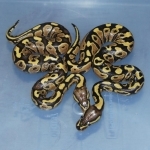 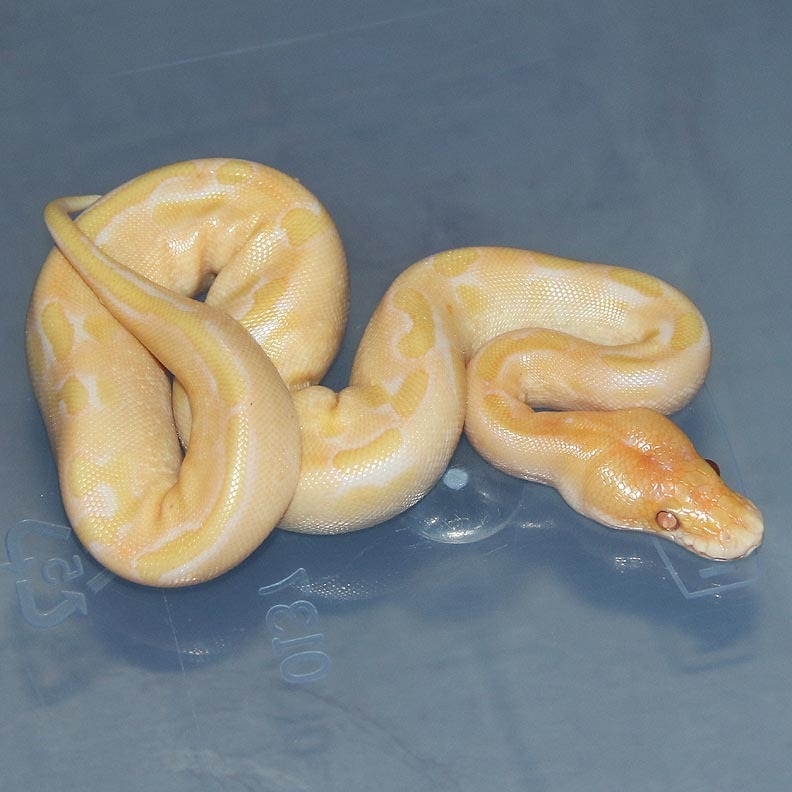 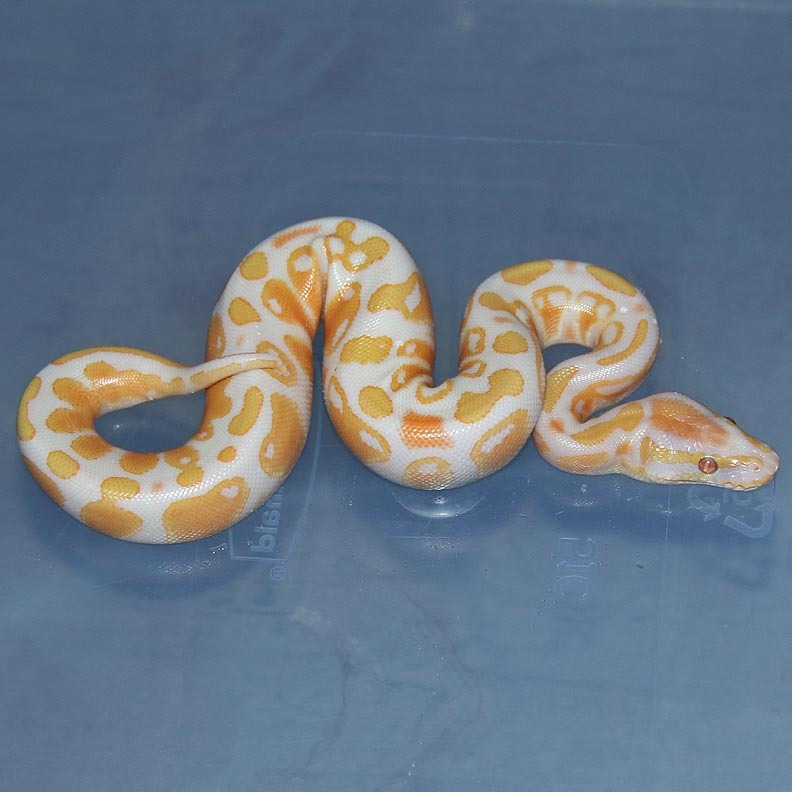 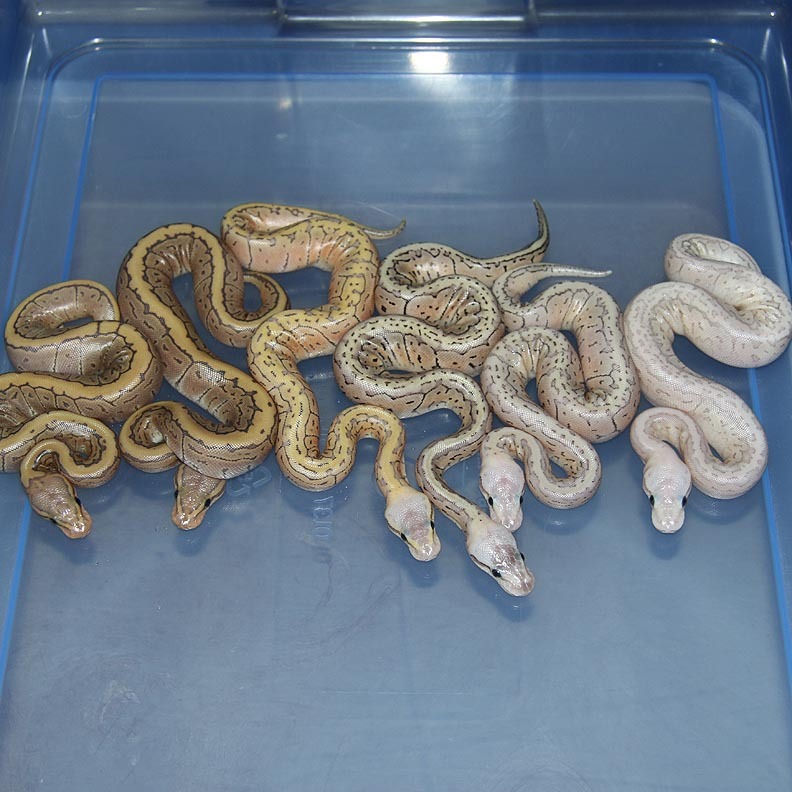 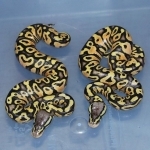 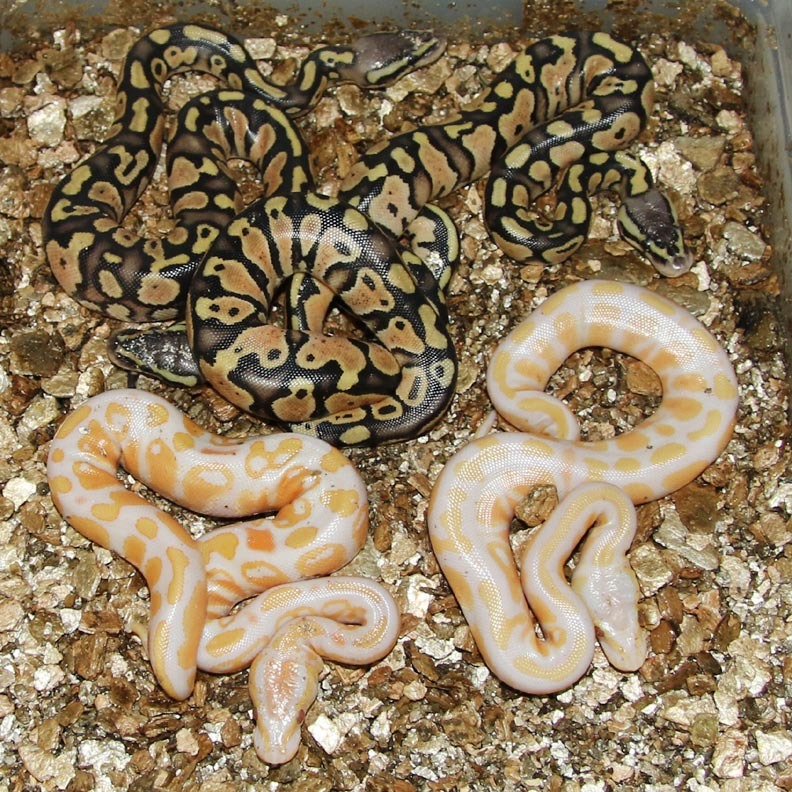 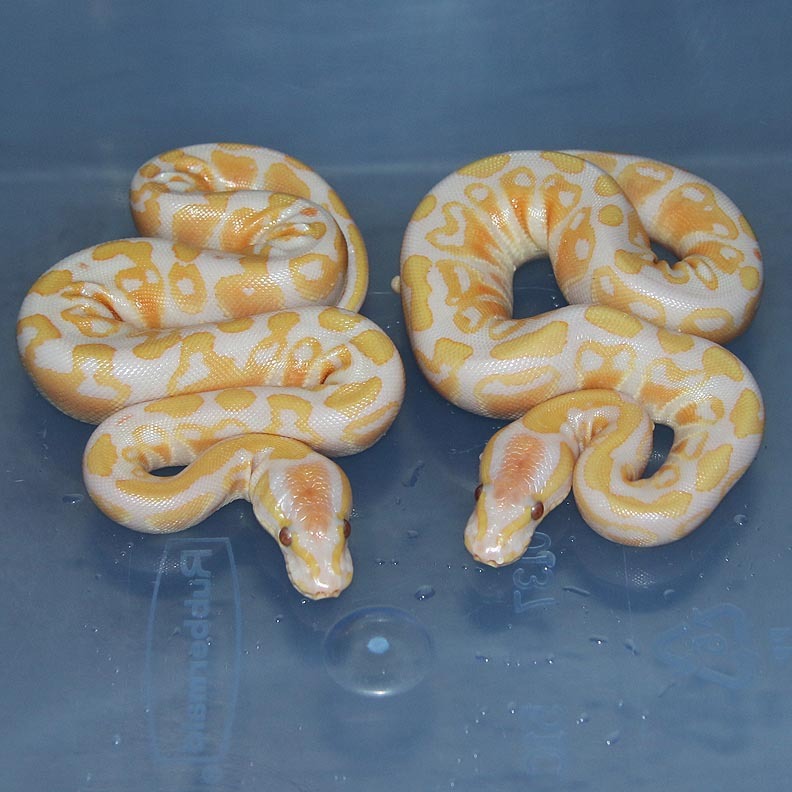 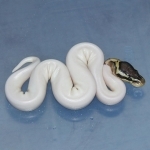 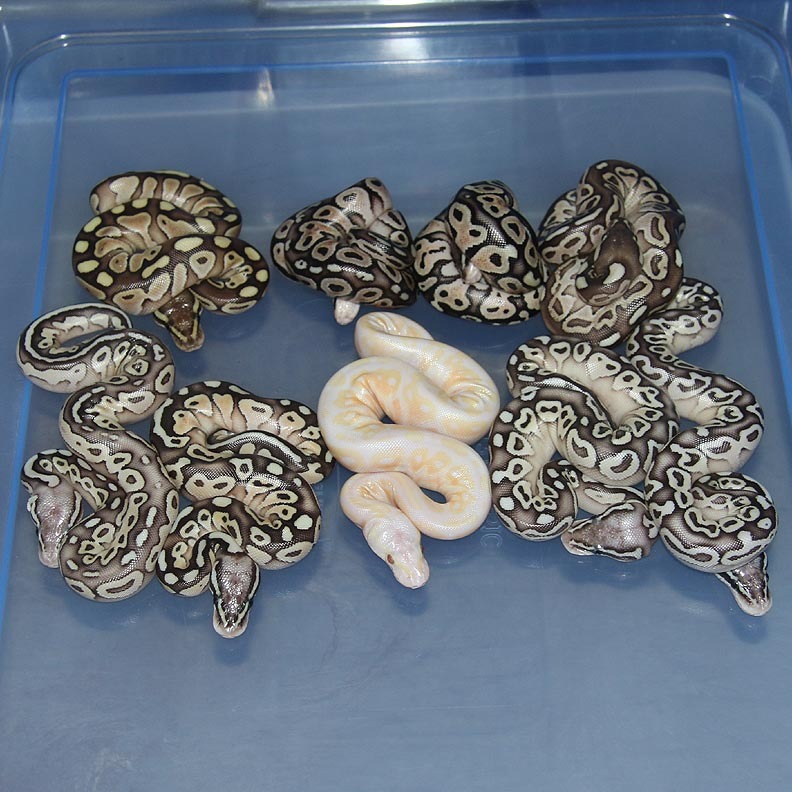 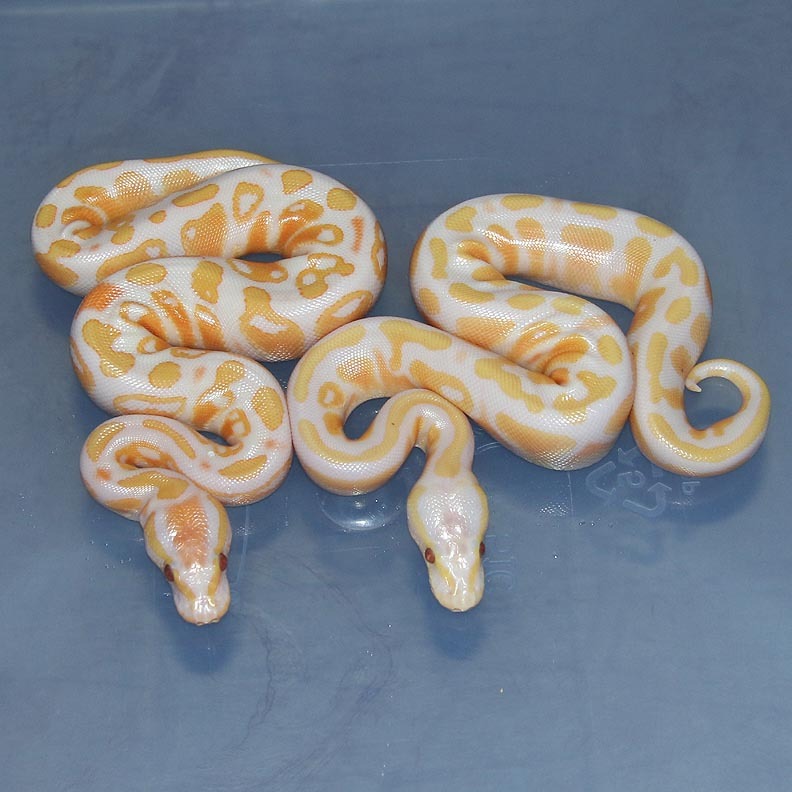 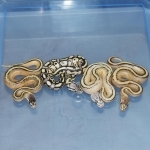 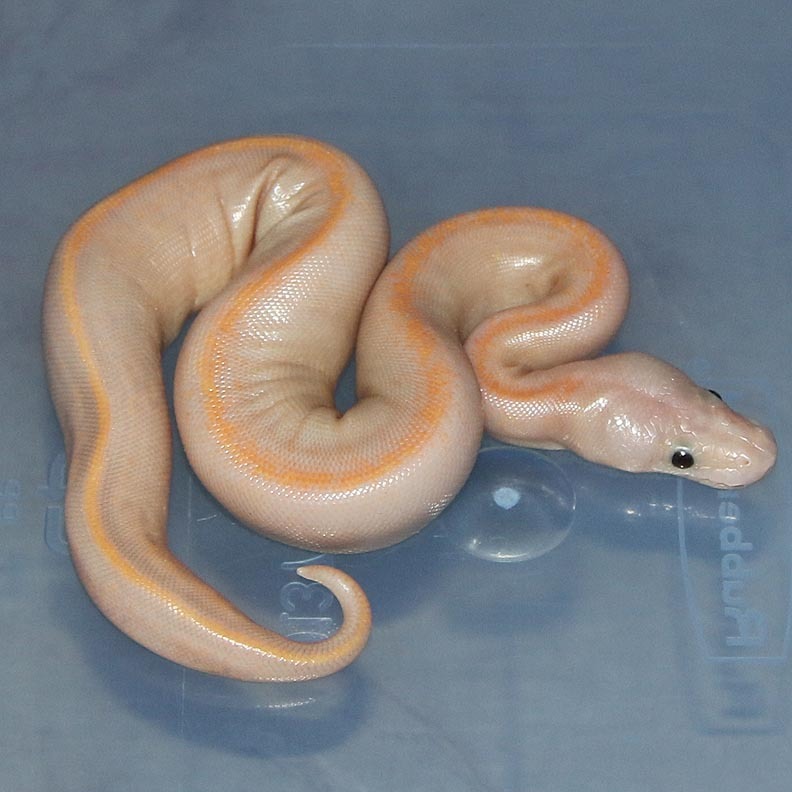 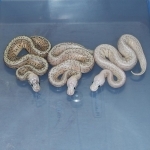 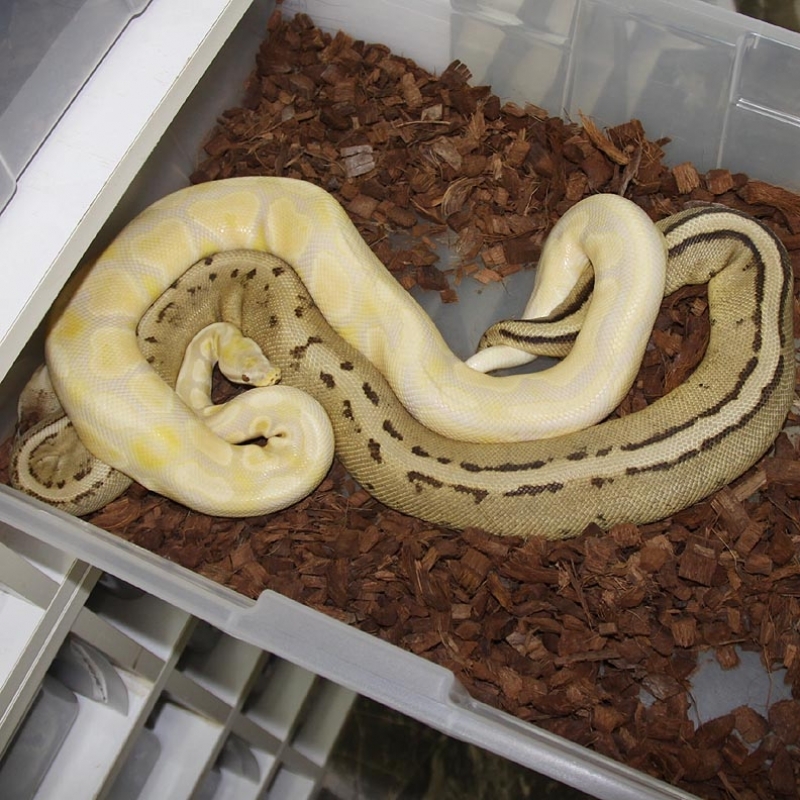 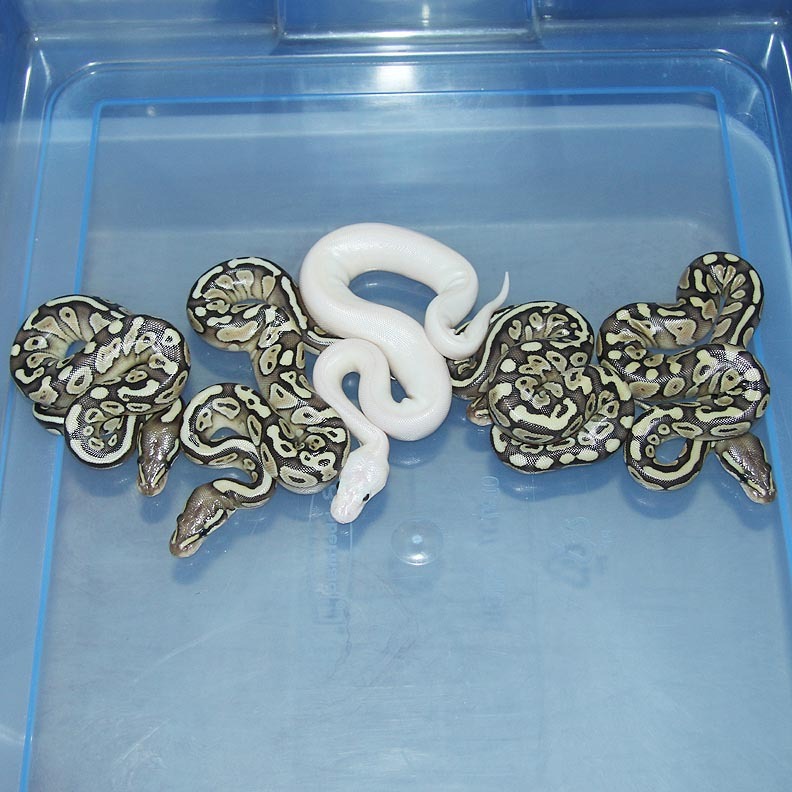 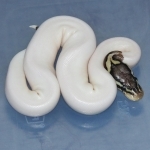 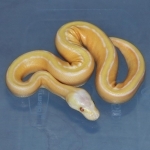 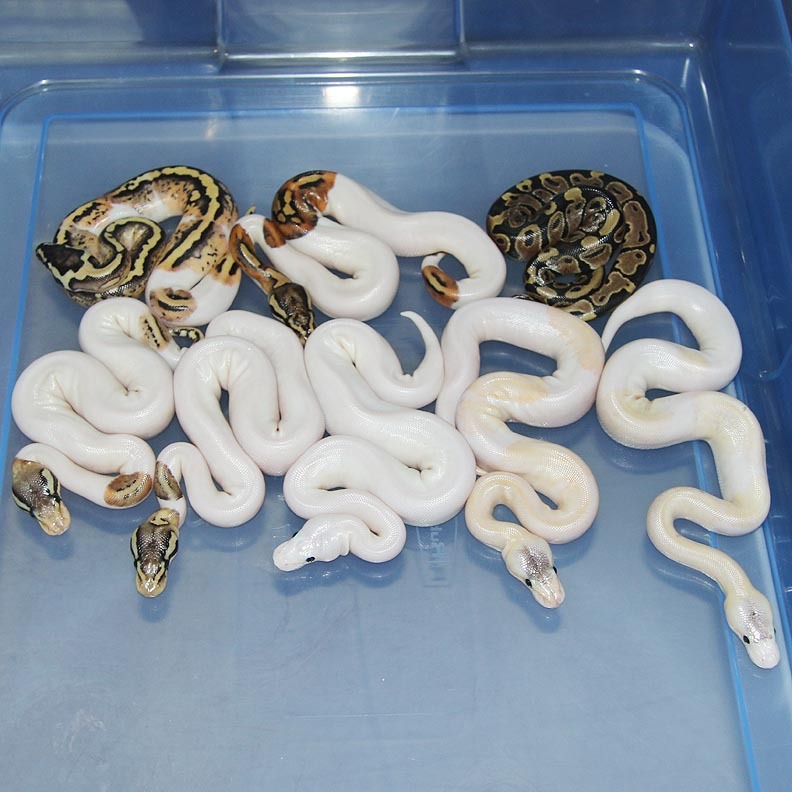 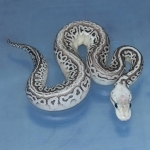 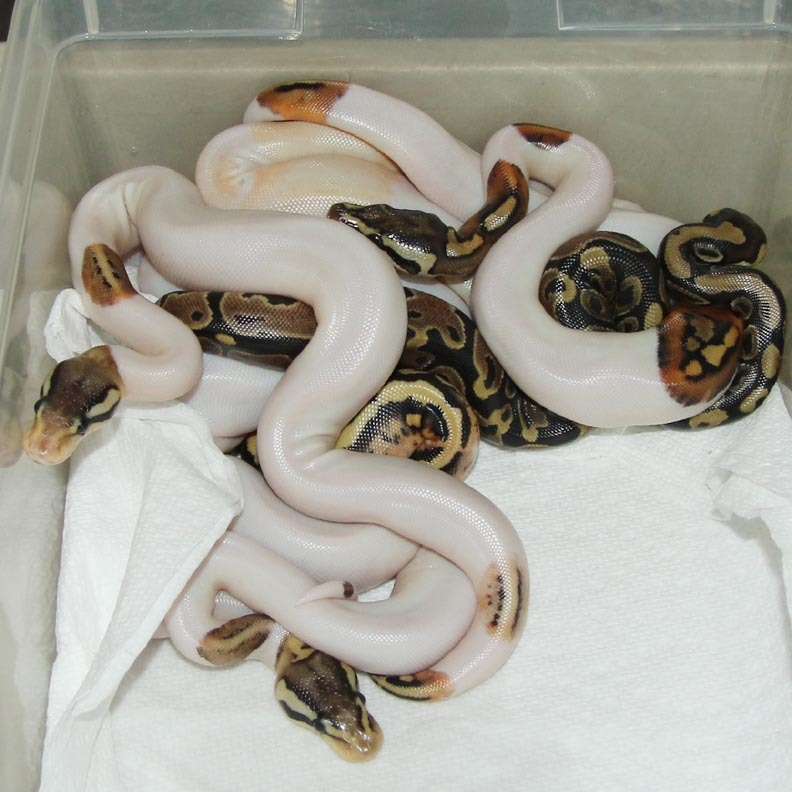 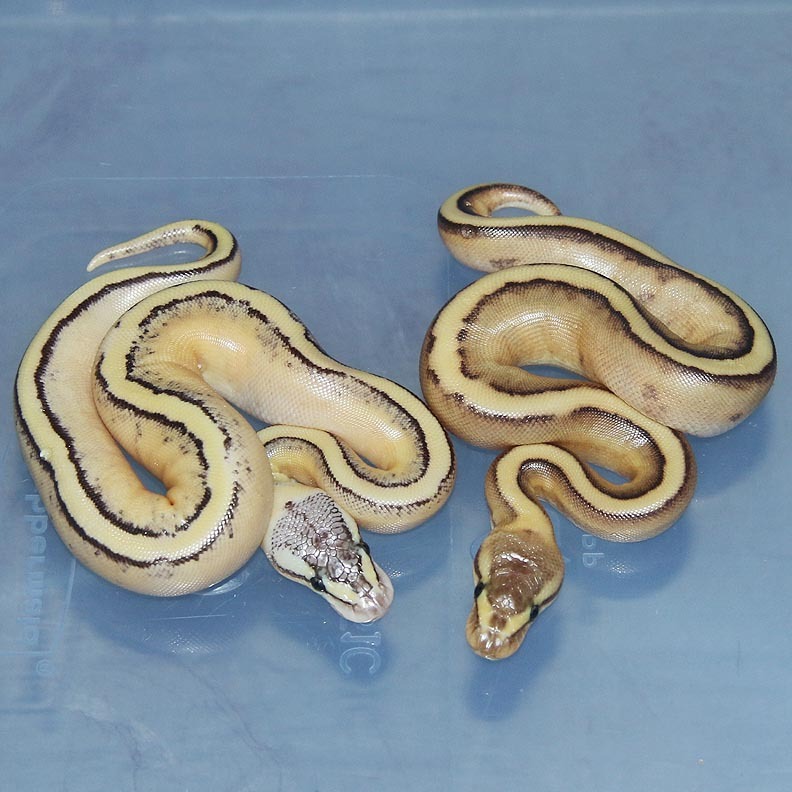 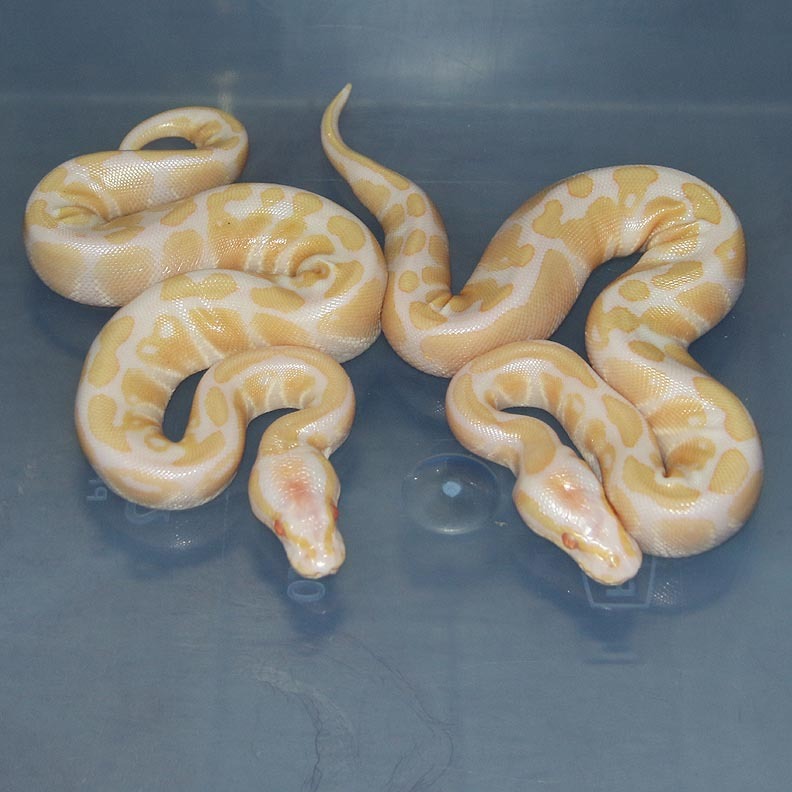 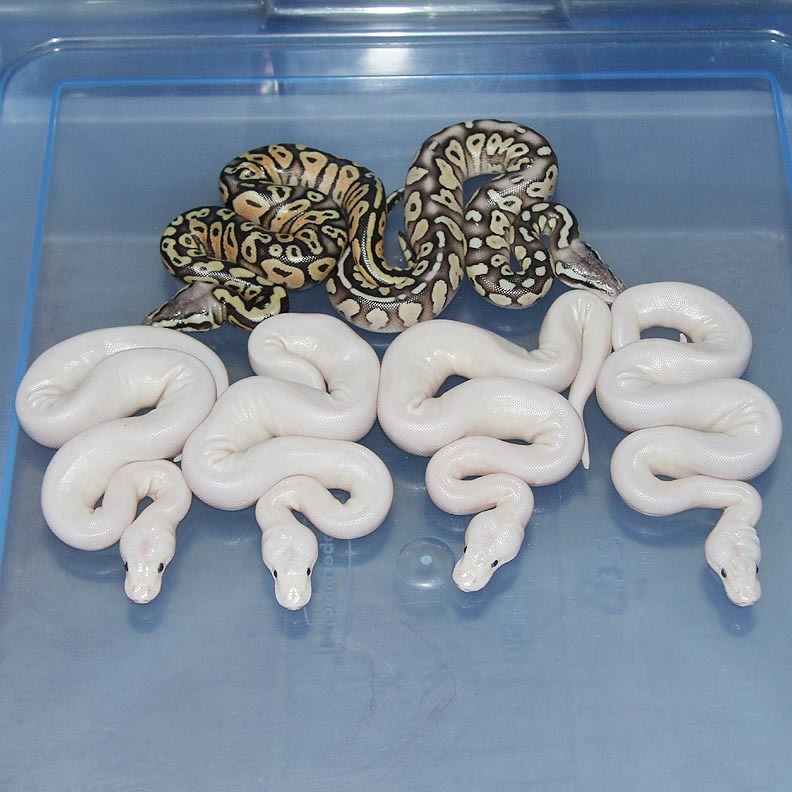 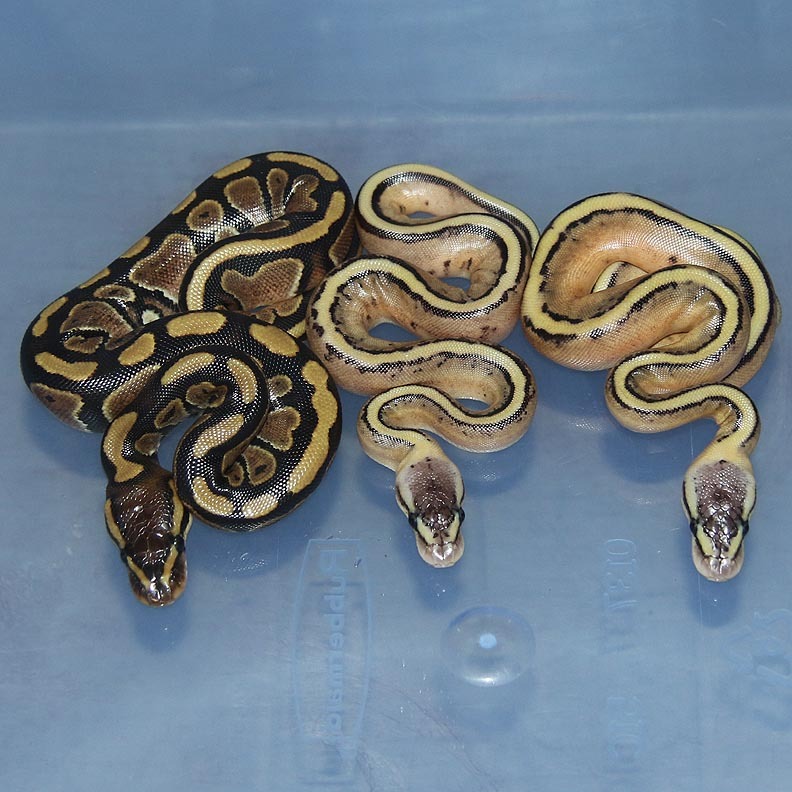 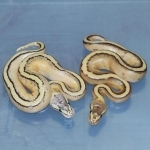 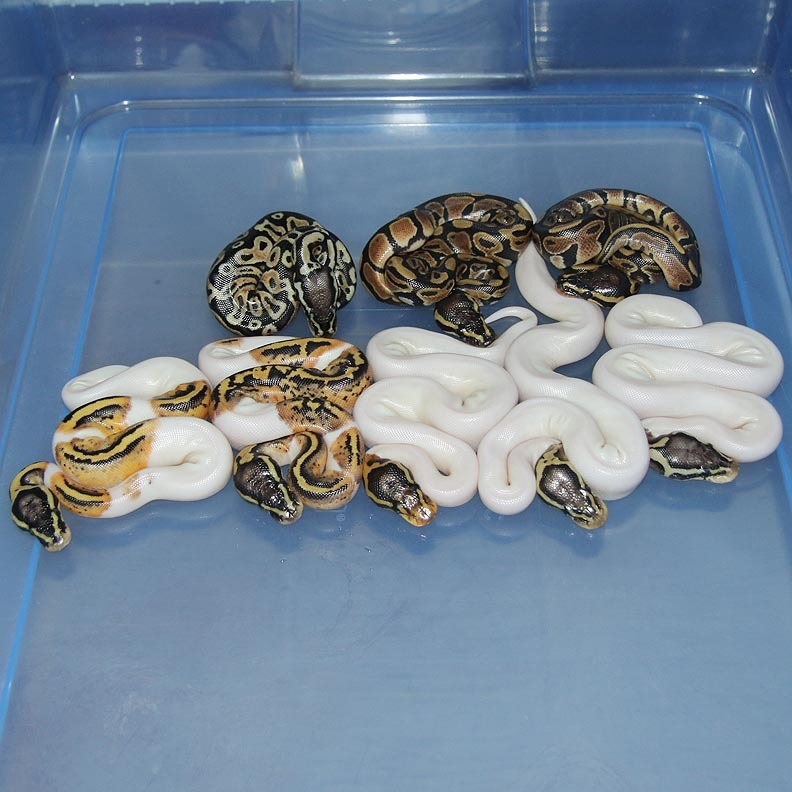 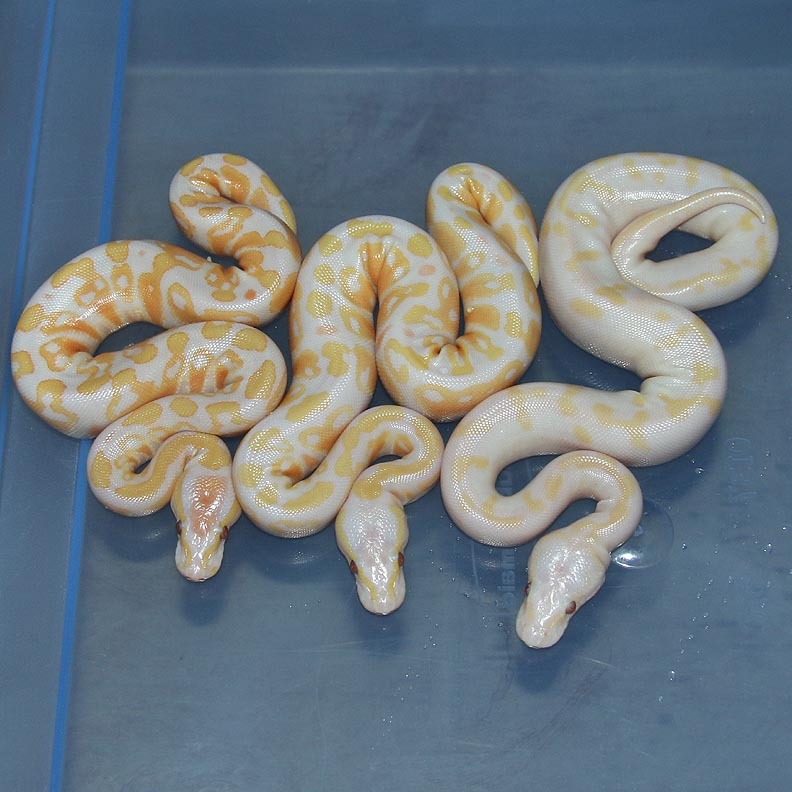 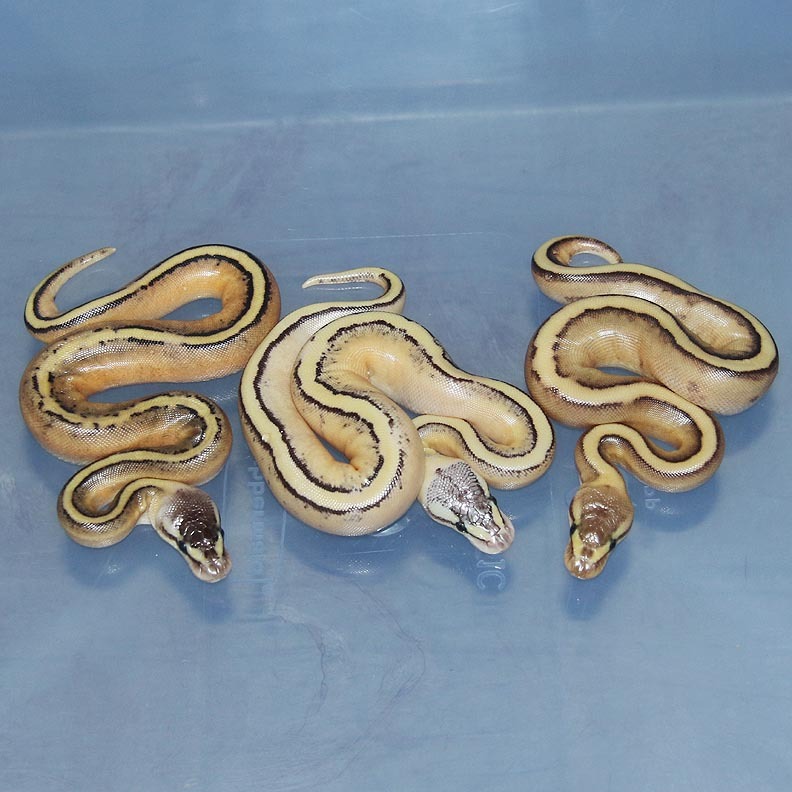 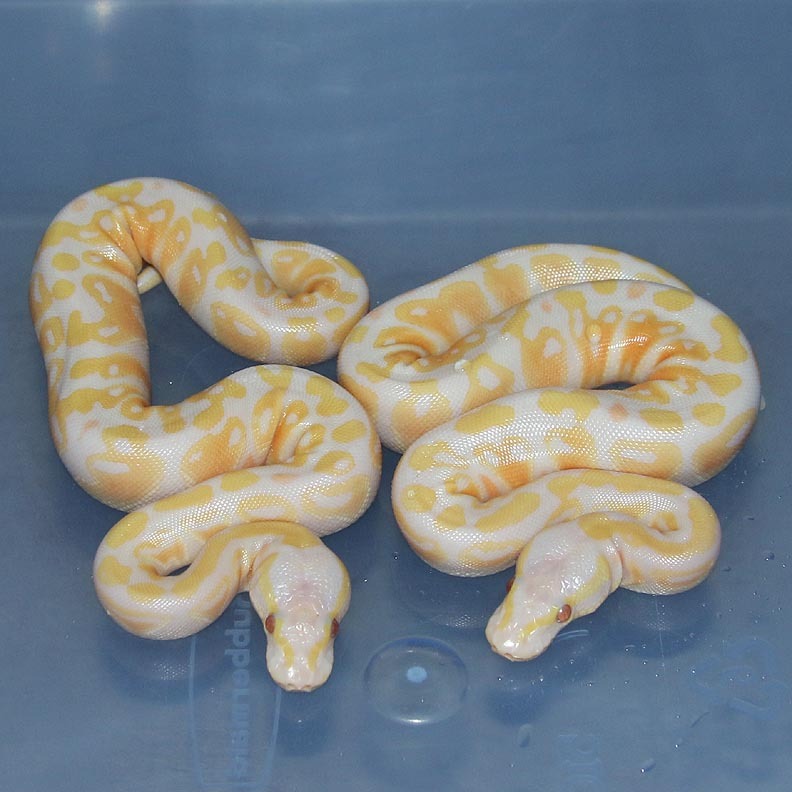 Description: Citrus Pastel Lesser Spark HRA 1/13 x Pinstripe Red Axanthic 2/12. 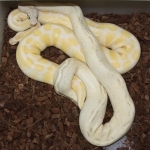 I never expected the Spark to affect the Red Axanthic so much! 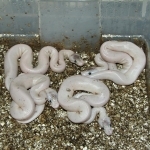 Description: Mutation X Pastel Lesser HOG 1/13 x Genetic Stripe PHOG 3/12. 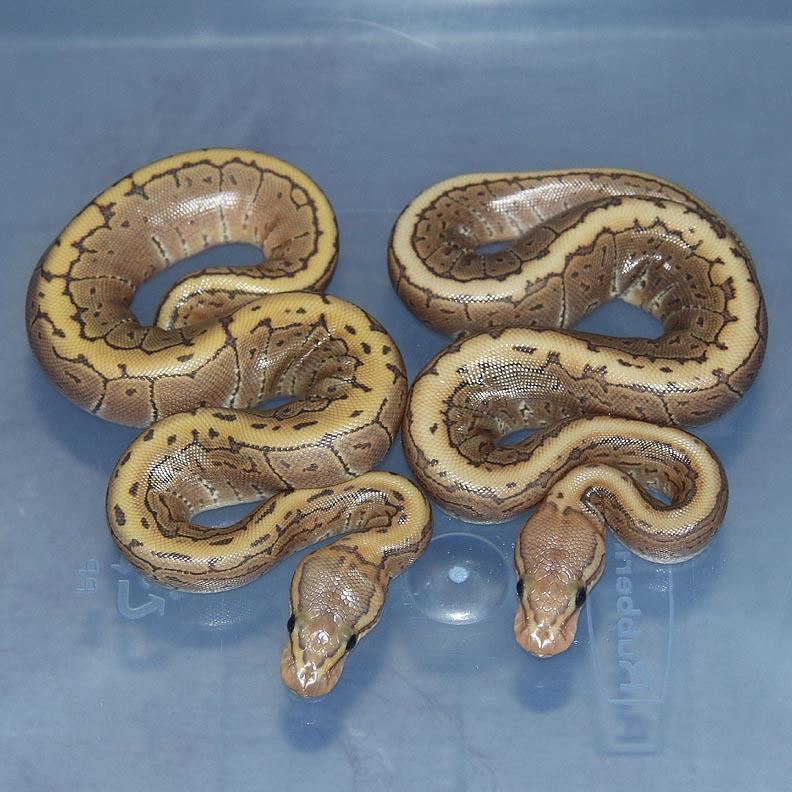 Description: Banana Mahogany 1/13 x Red Axanthic Genetic Stripe 1/12. 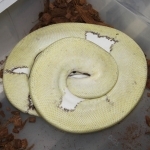 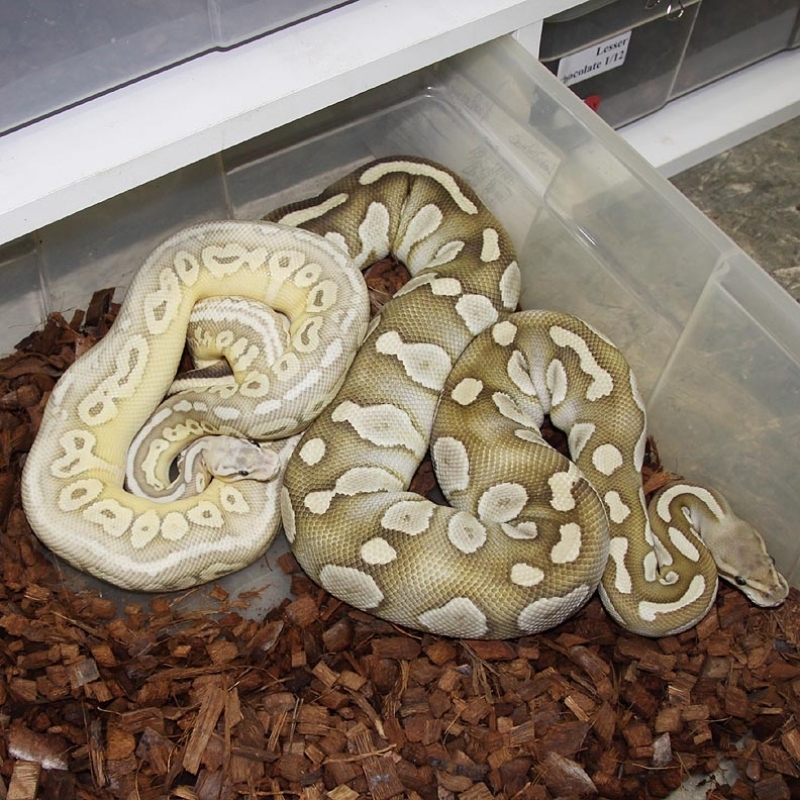 Description: Pastel Lesser YB Het Green Ghost 1/13 x Pastel Green Ghost Lesser 1/11. 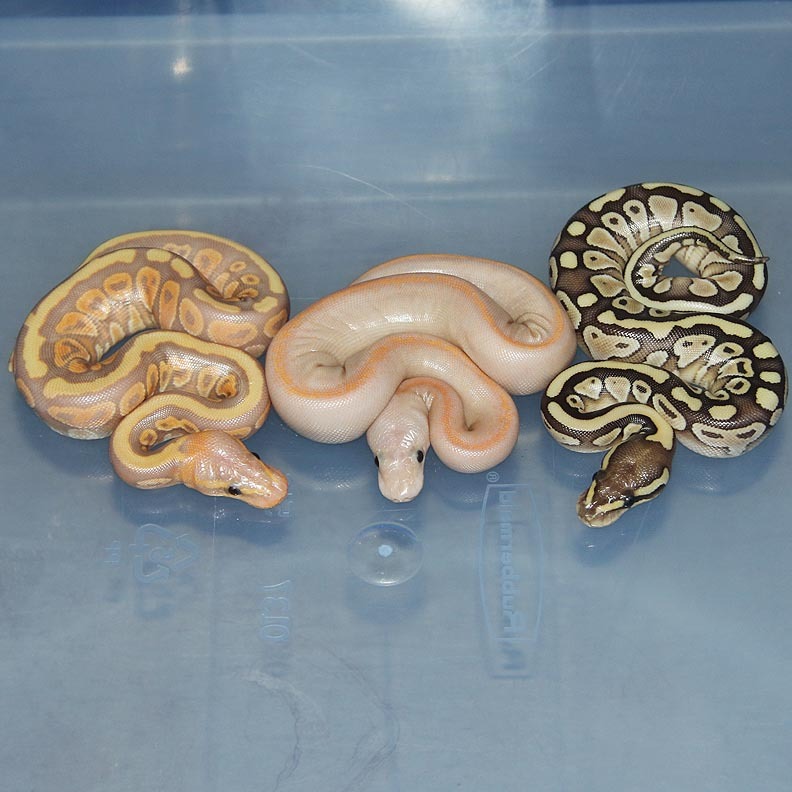 No breeding Pics. 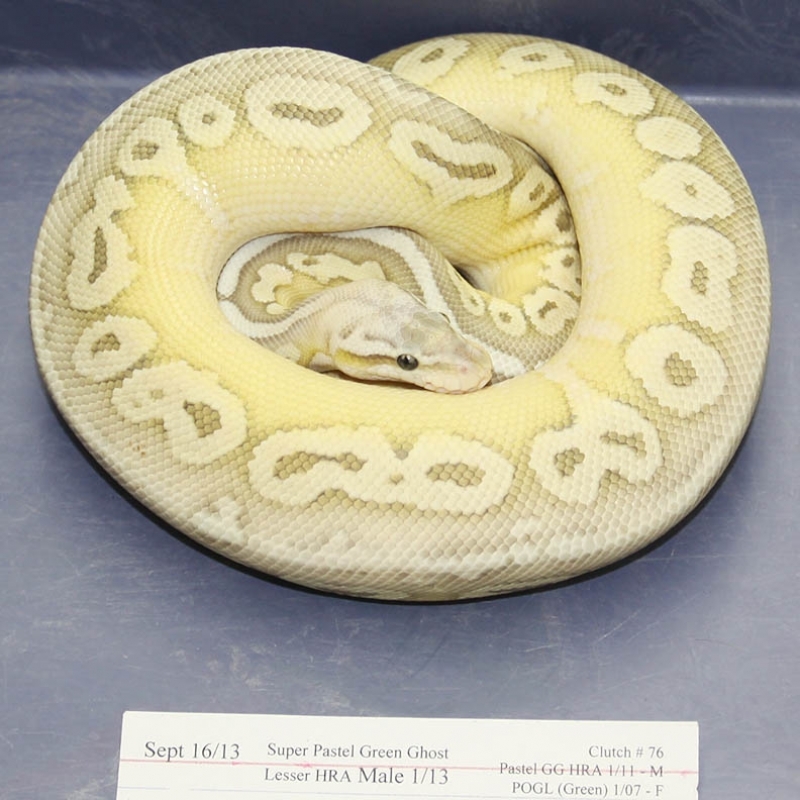 Only bred once on July 23 2015. 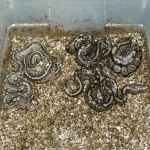 Description: Granite 1/12 x Granite 2/12. 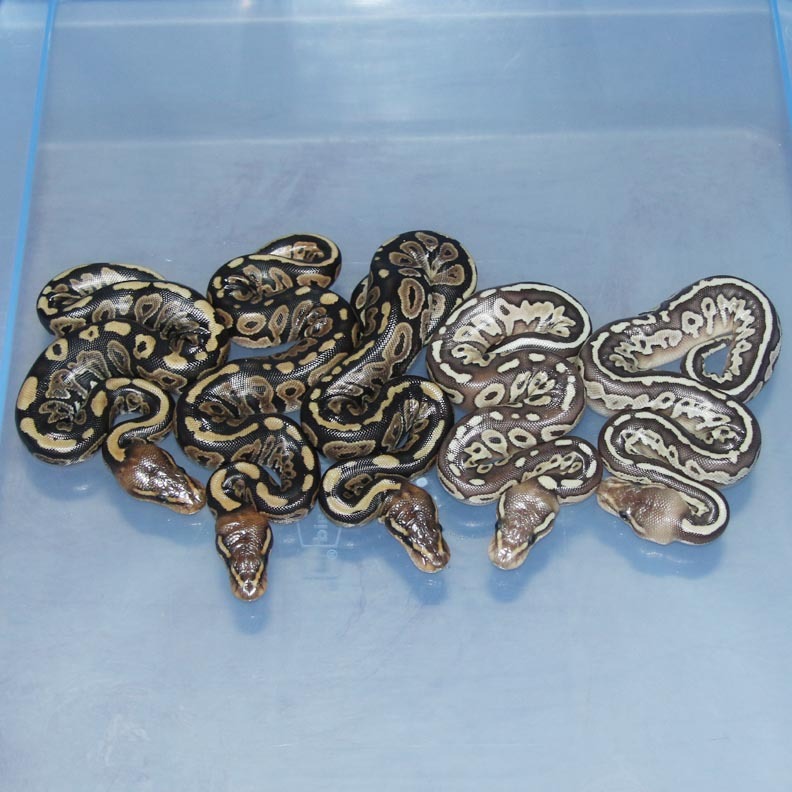 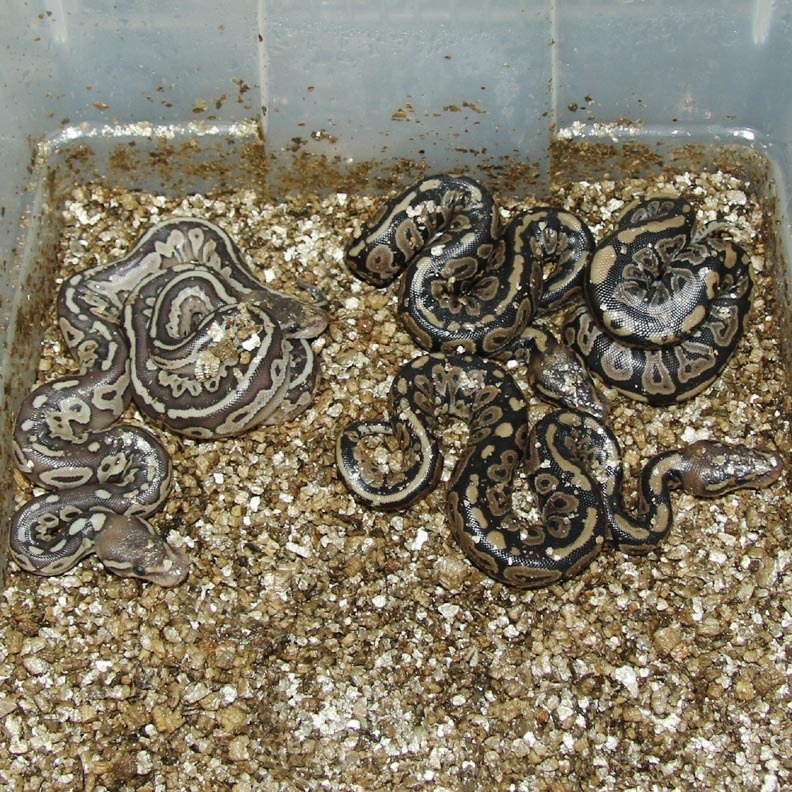 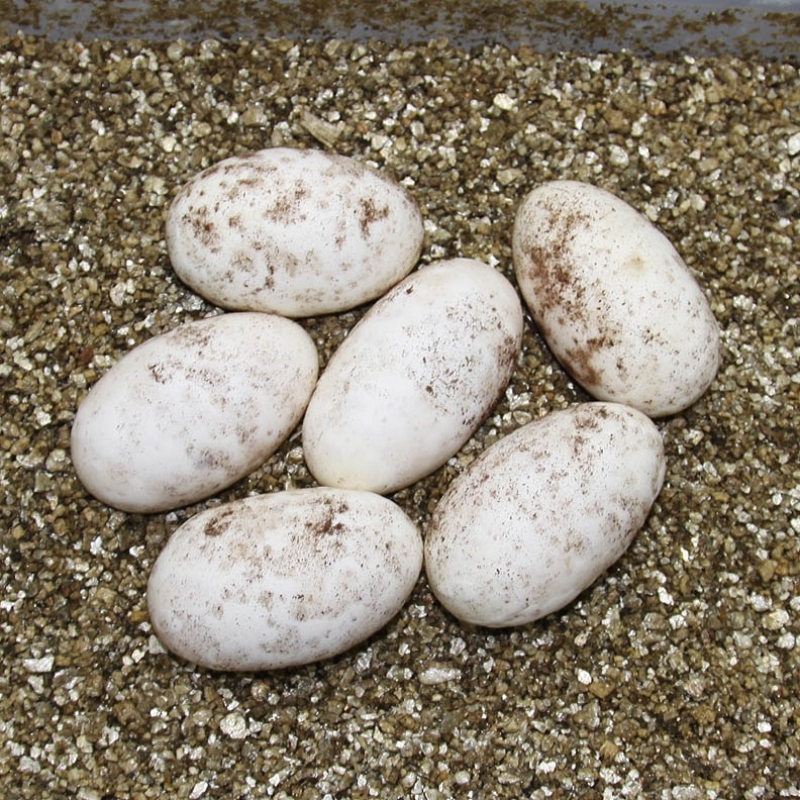 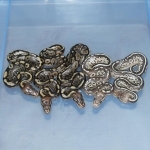 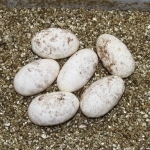 Description: Pastel Lesser Het RA Het Lavender PHGS 1/12 x Het Lavender 1/10 JW. 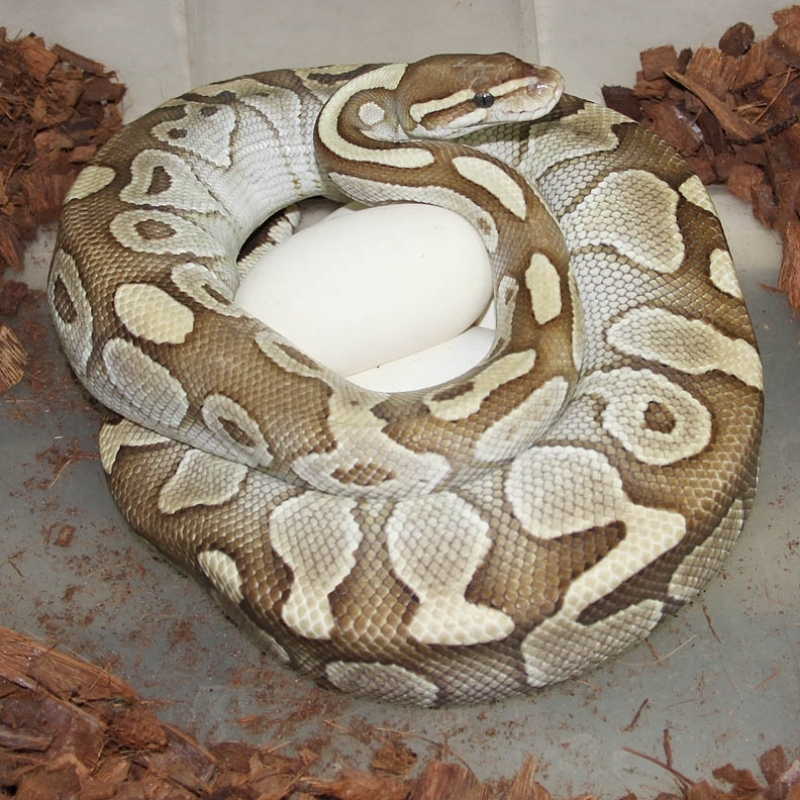 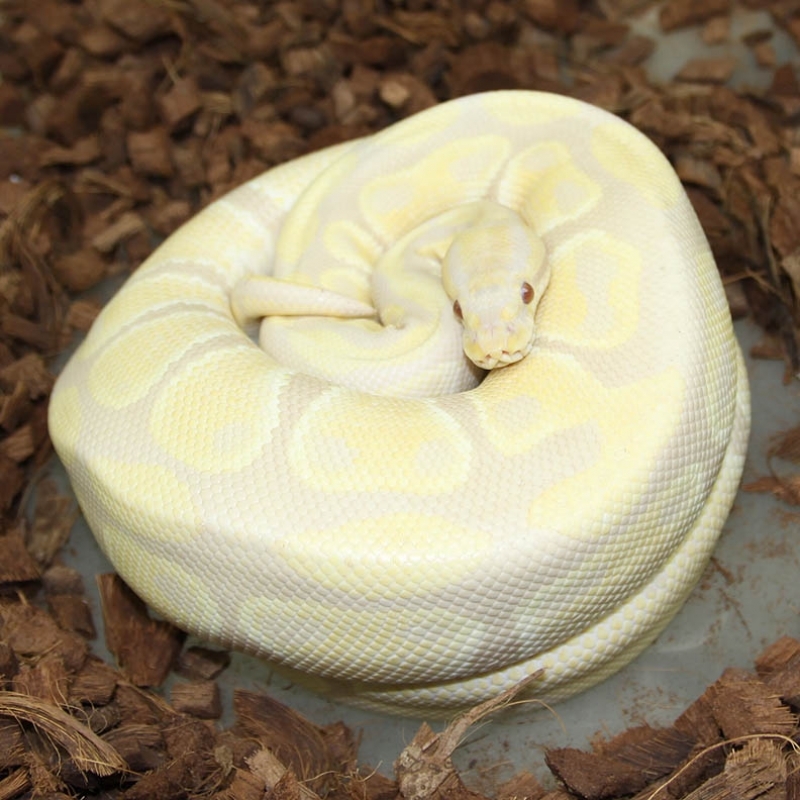 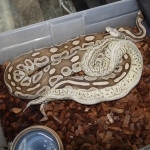 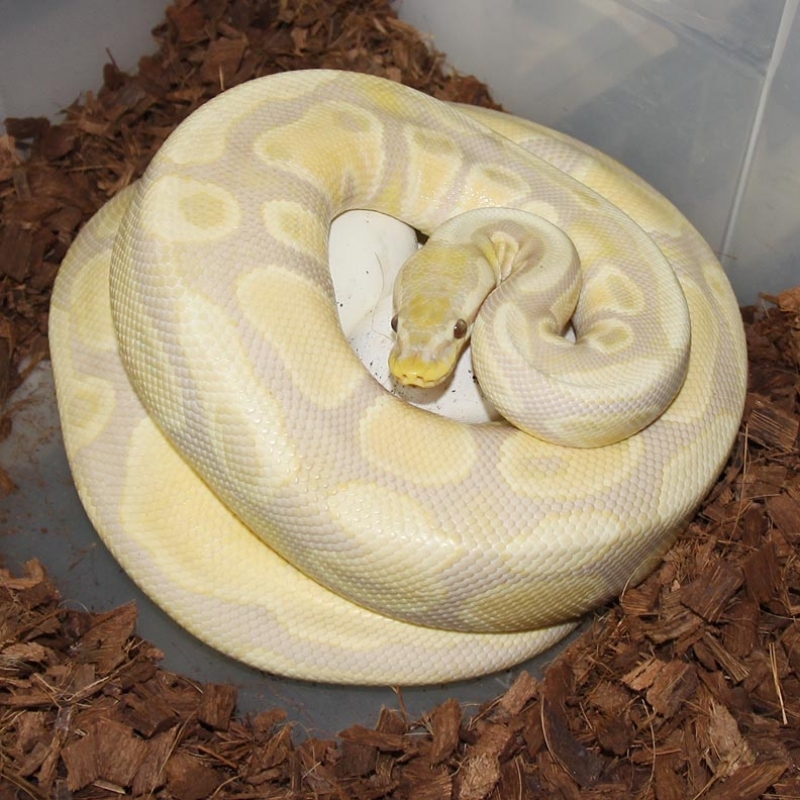 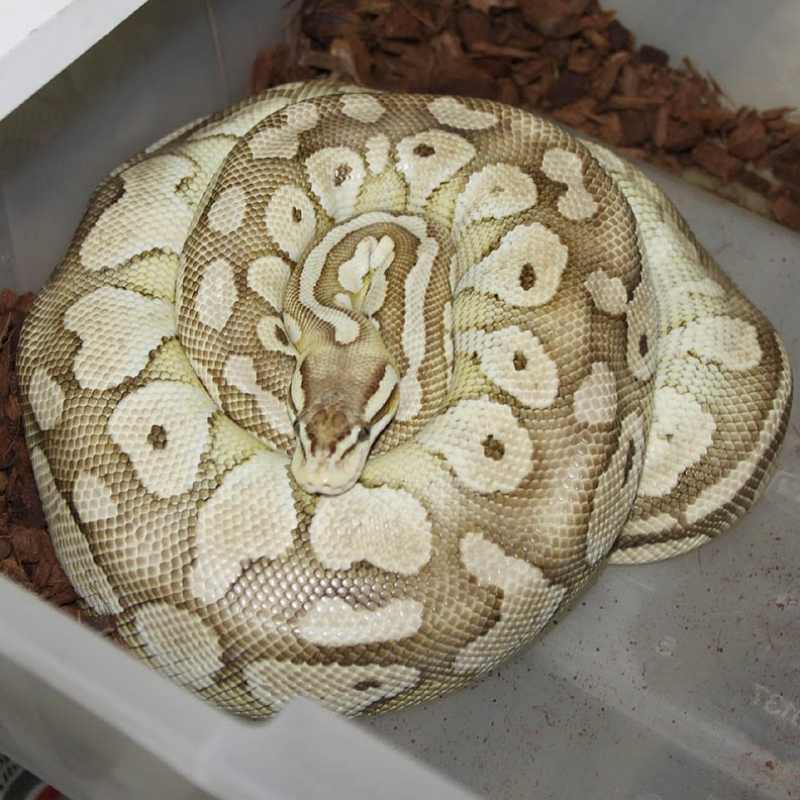 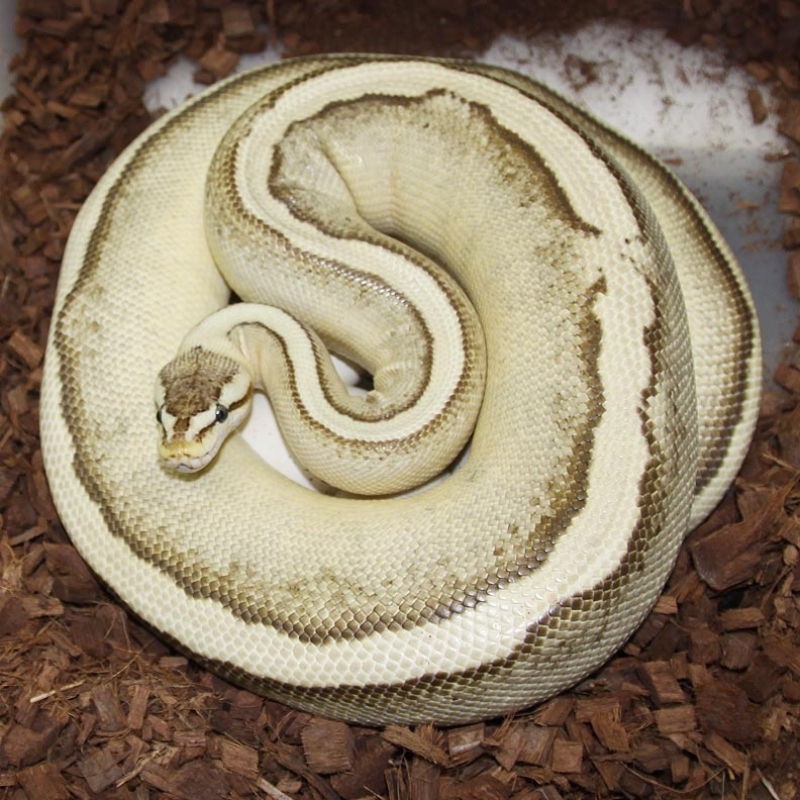 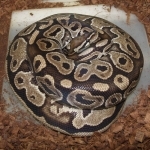 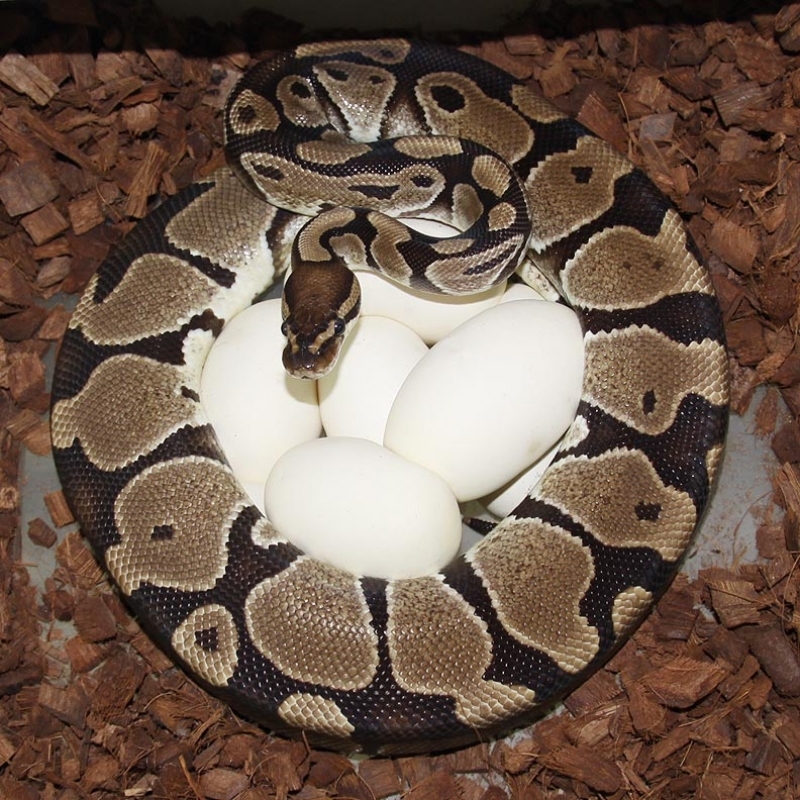 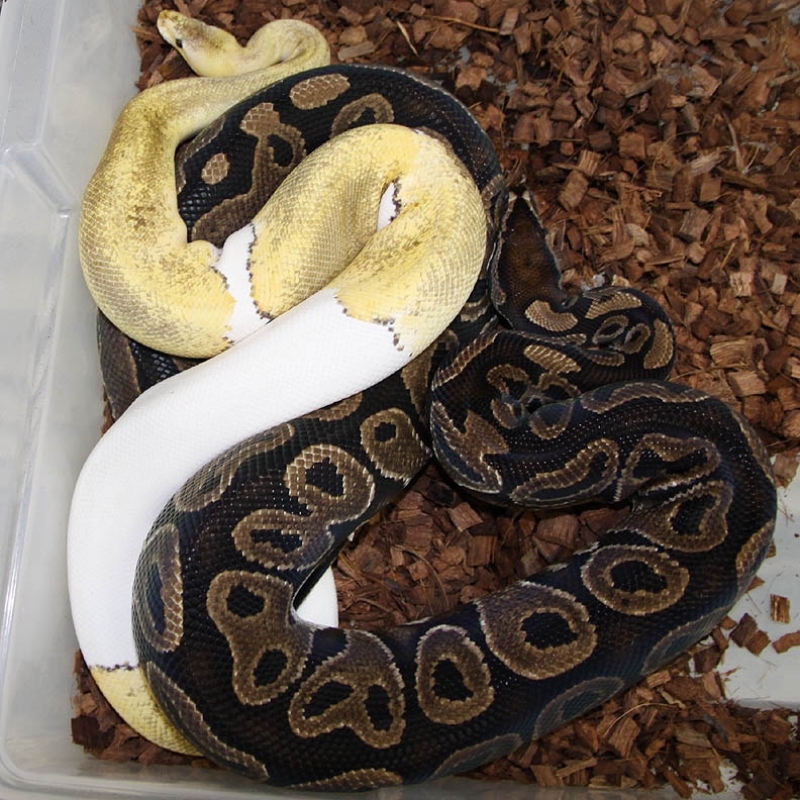 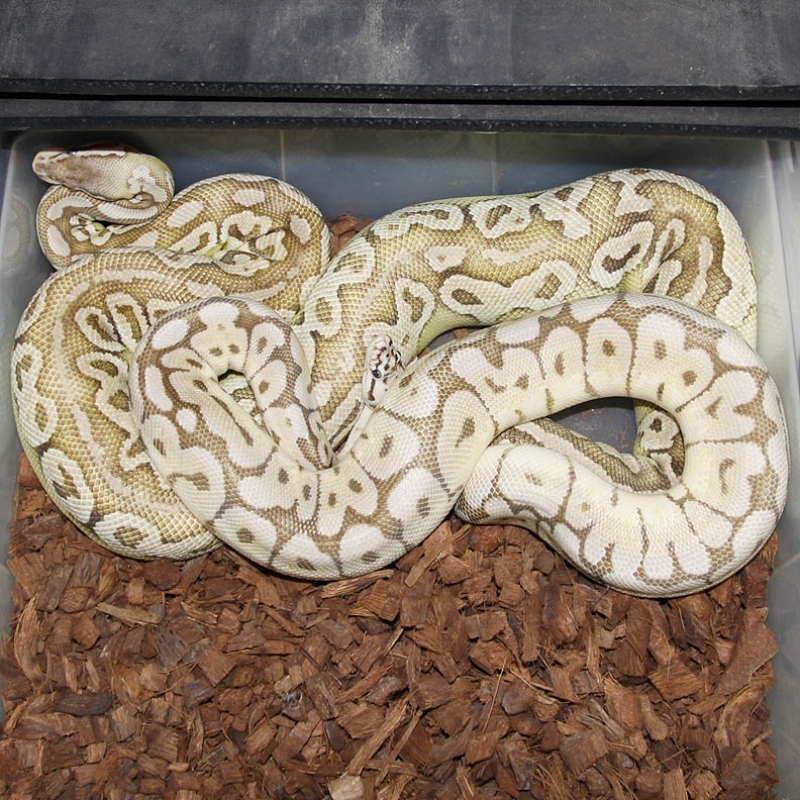 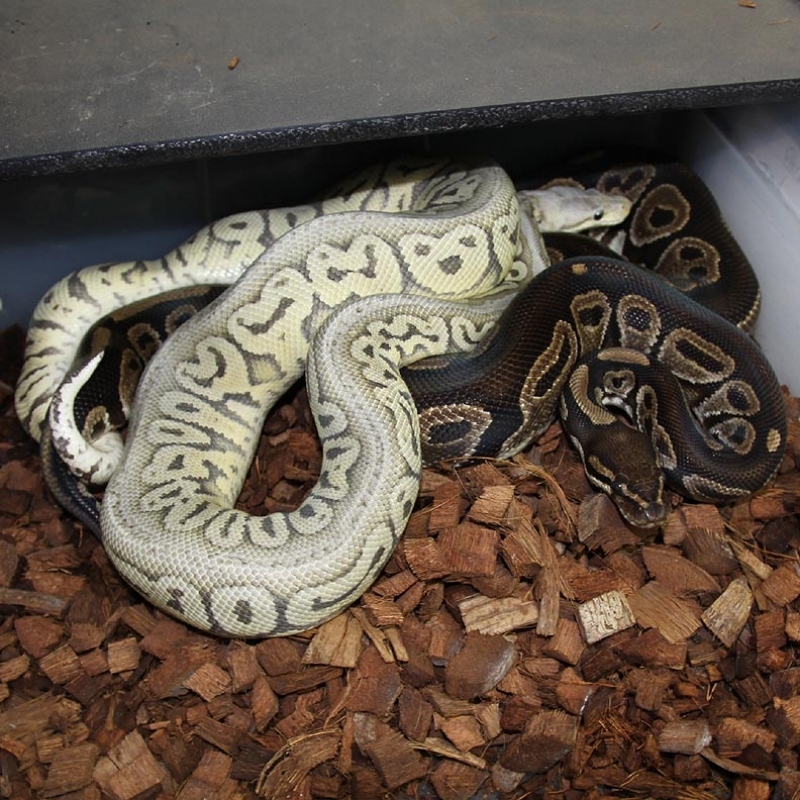 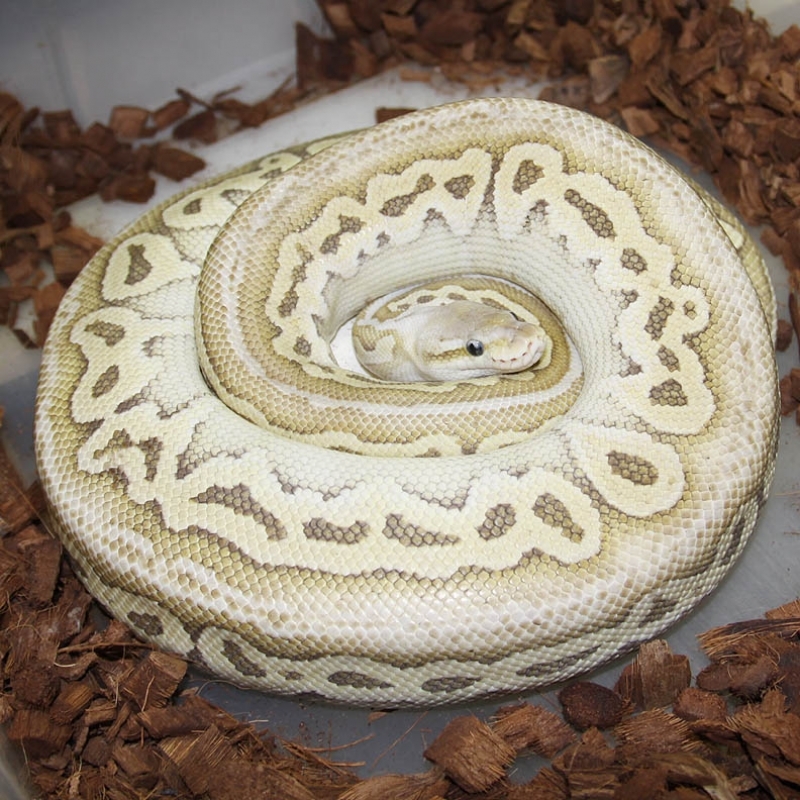 Description: Pastel Lesser YB Het Green Ghost 1/13 x Pastel Lesser Spark Het Green Ghost 1/13. The Pastel Lesser Puma could be a Super Pastel. 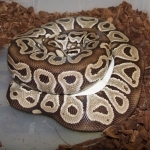 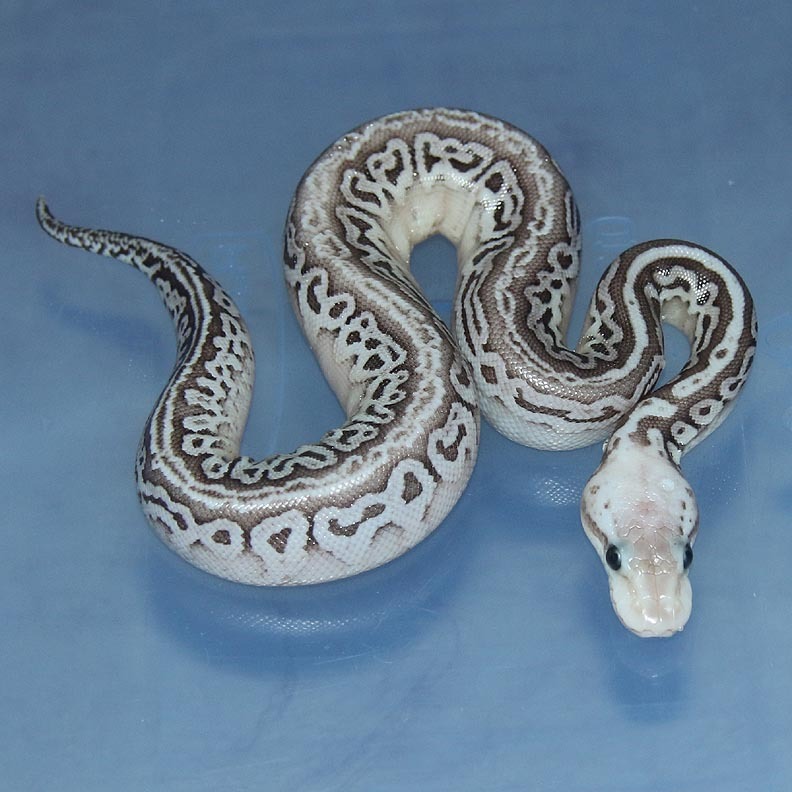 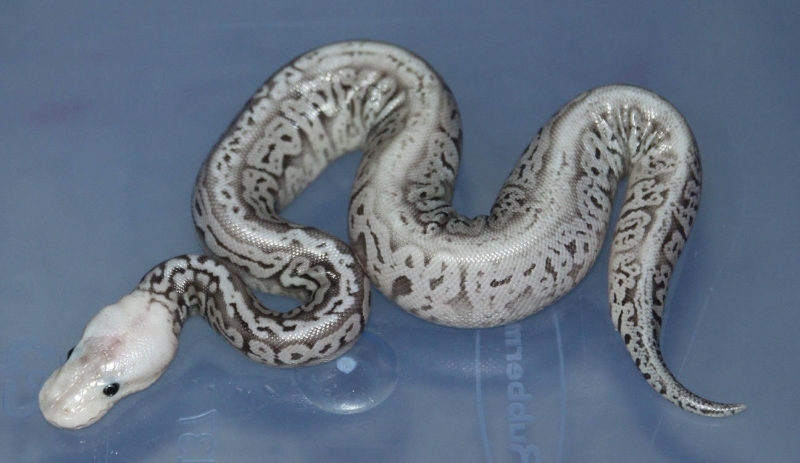 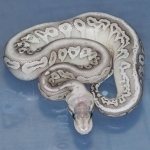 Description: Lavender Het Pied 1/12 JK x Pied 3/10. 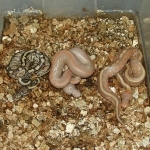 Description: Lesser Het Caramel 1/12 x Pastel Het Caramel PH Albino 2/09. 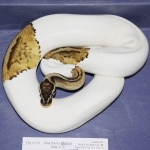 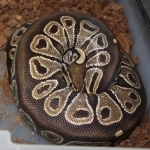 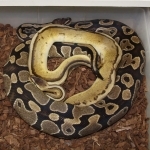 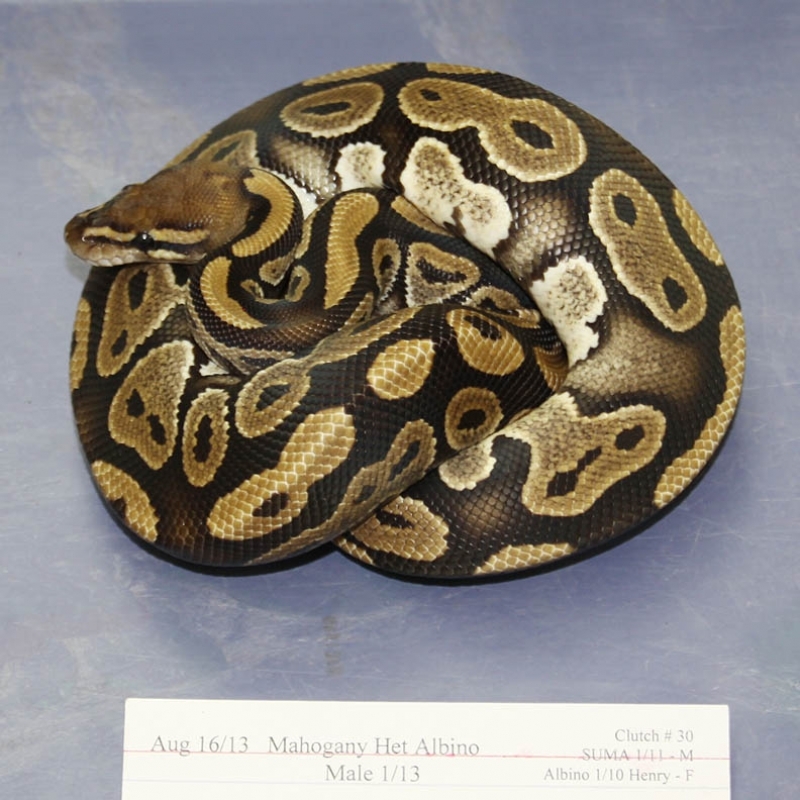 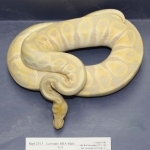 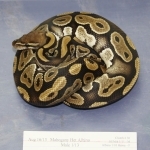 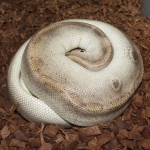 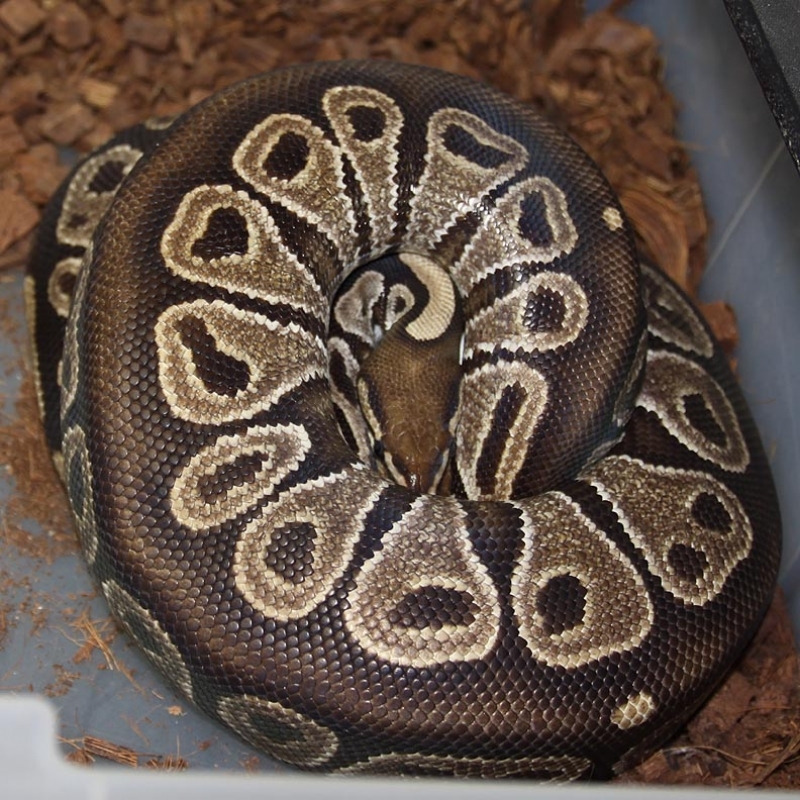 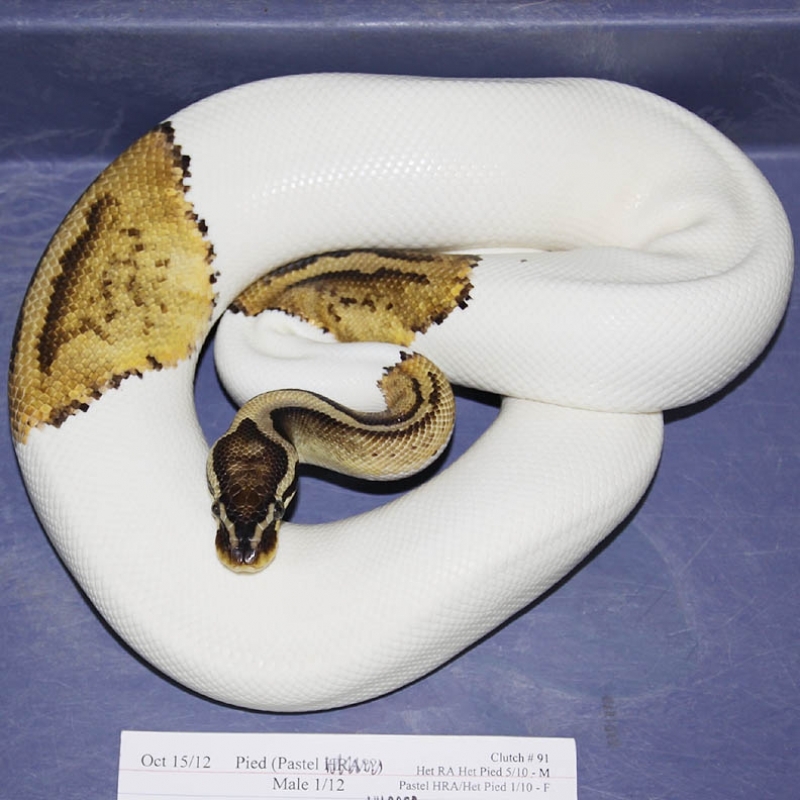 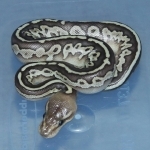 Description: Pastel Pin Champ Het RA Het Pied 1/13 x Het RA Het Pied 7/10. Maybe the Champagne Pied is a white snake???? 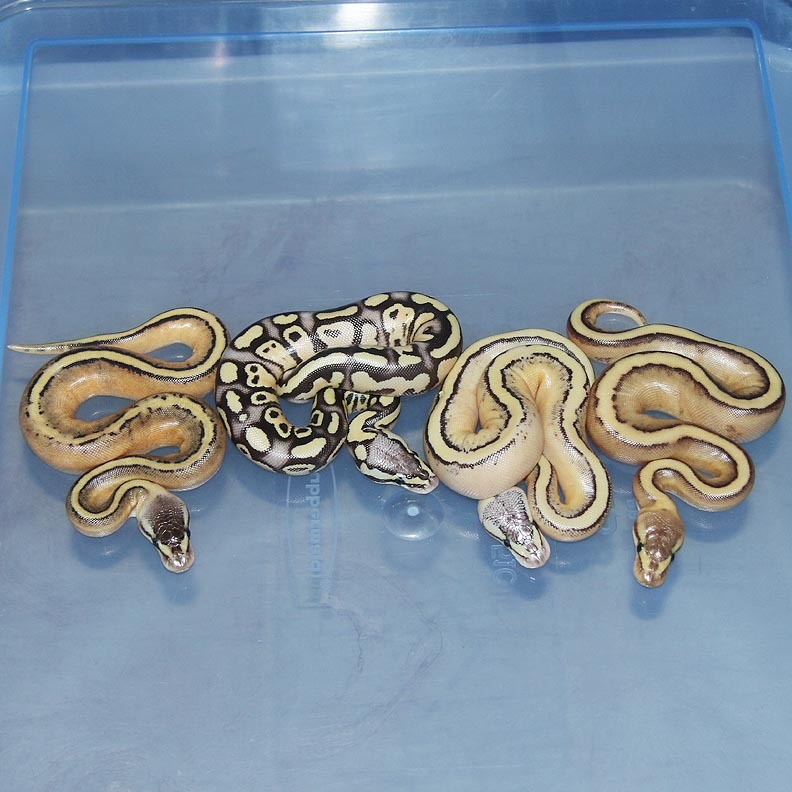 It's hard to figure out when the Champagne Het Pieds are really heavy ringers! 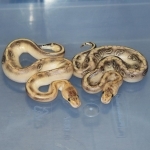 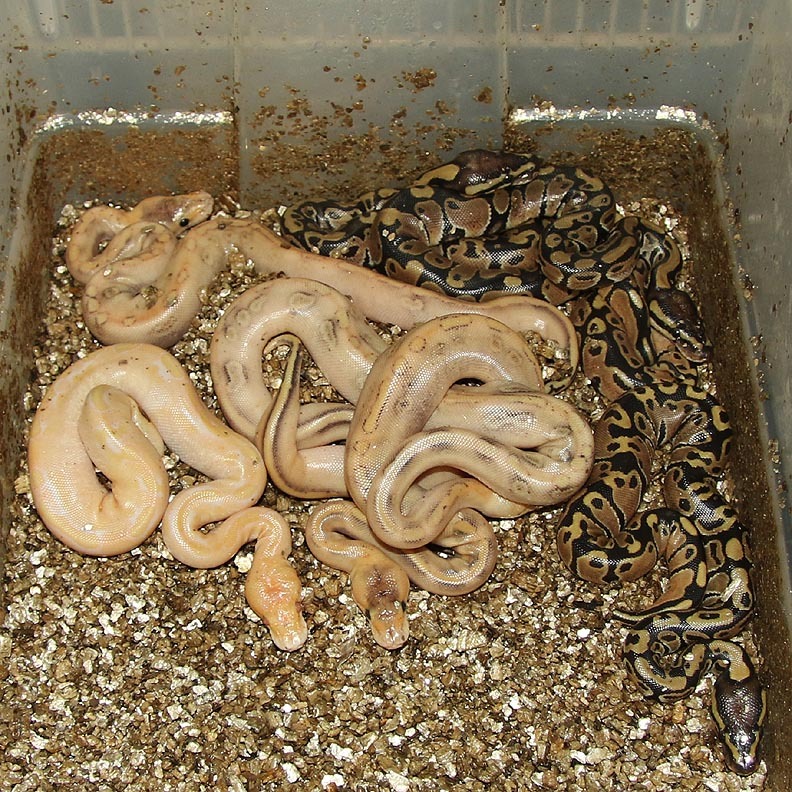 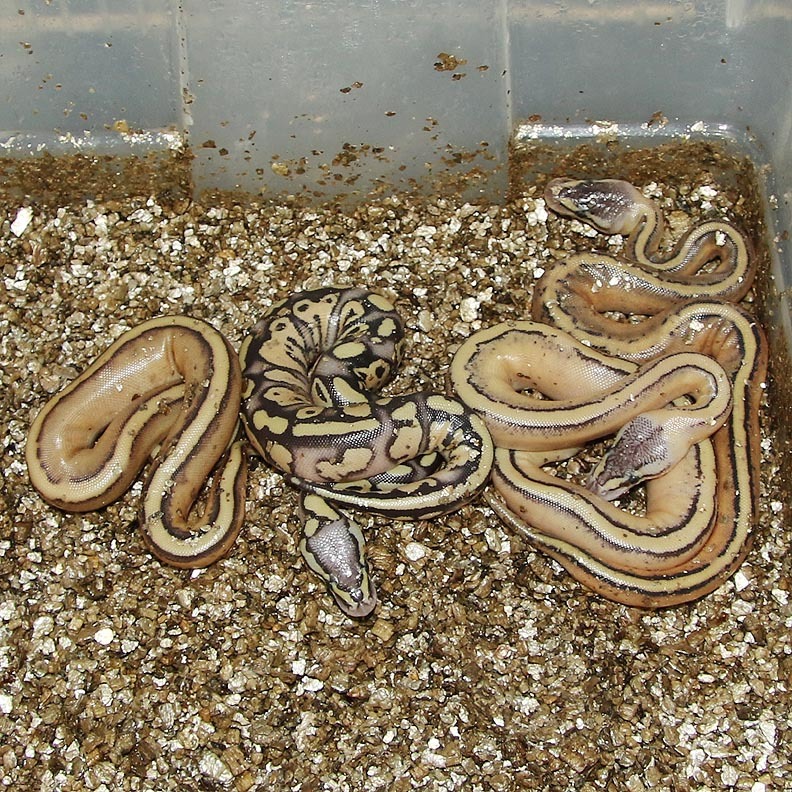 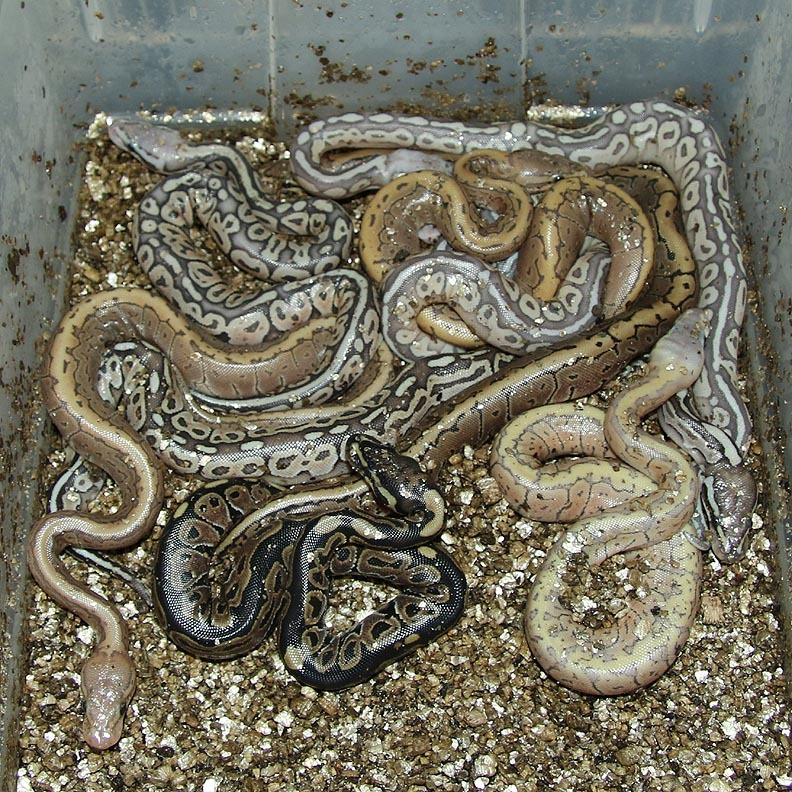 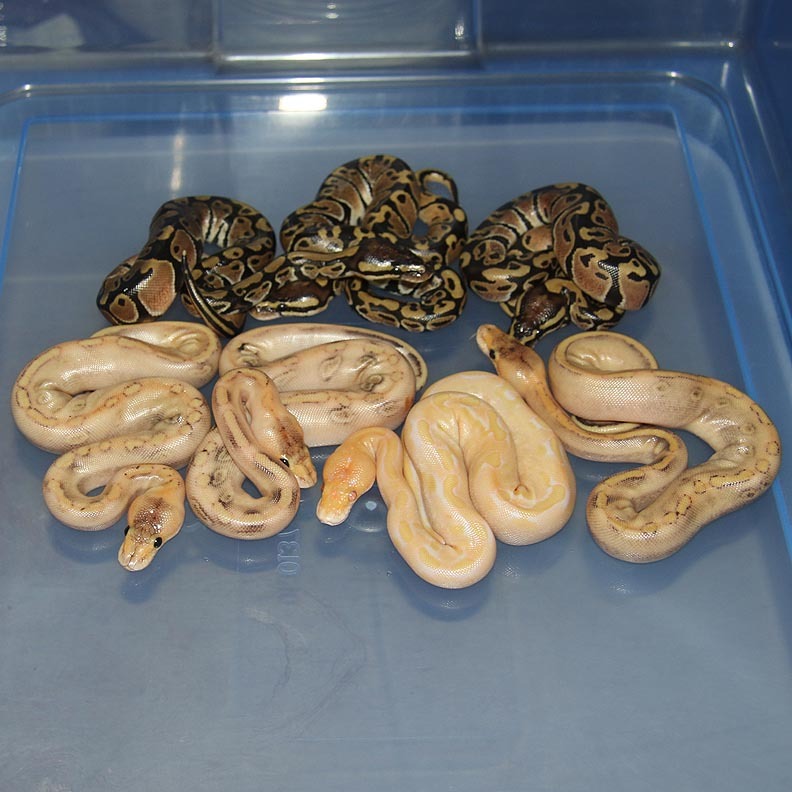 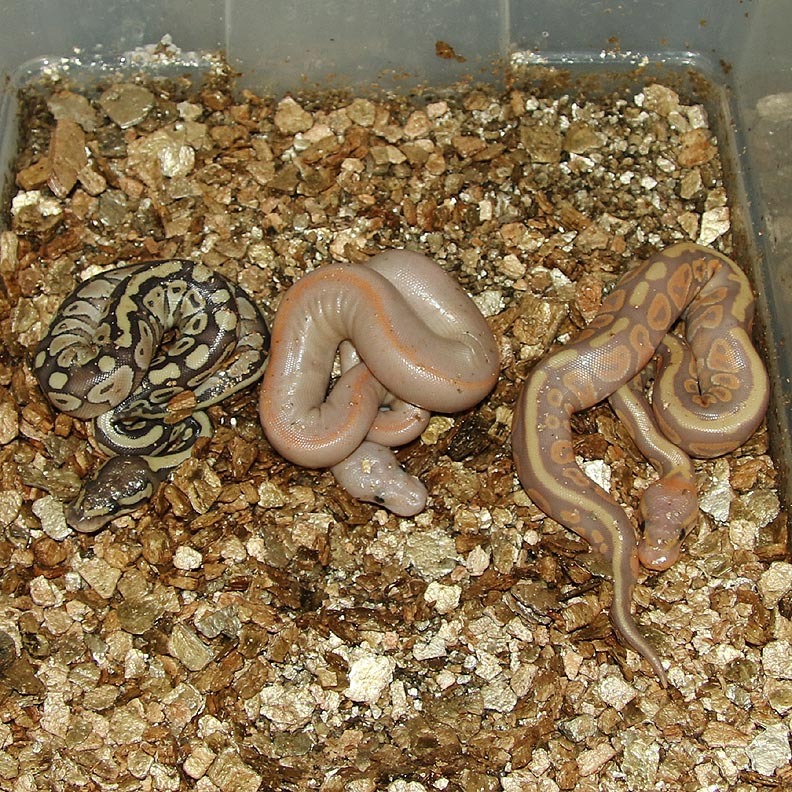 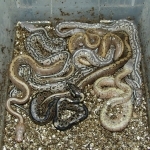 Description: Red Axanthic Pinstripe Champagne 2/12 x Champagne Het Red Axanthic 2/10. 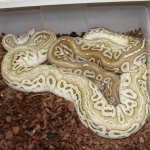 Description: Super Phantom 6/10 RDR x Lavender HRA 1/13. 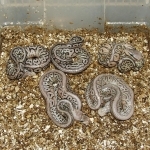 Description: Banana Mahogany 1/13 x Lesser Mahogany HRA 1/13. Yup, this guy is AWESOME! 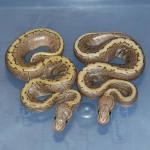 Description: Lesser Caramel 1/12 x Lesser YB 3/12. 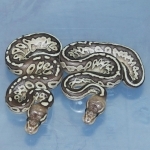 Description: POG RA 1/11 x Het RA/OG 3/08. 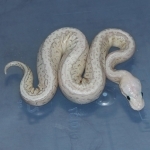 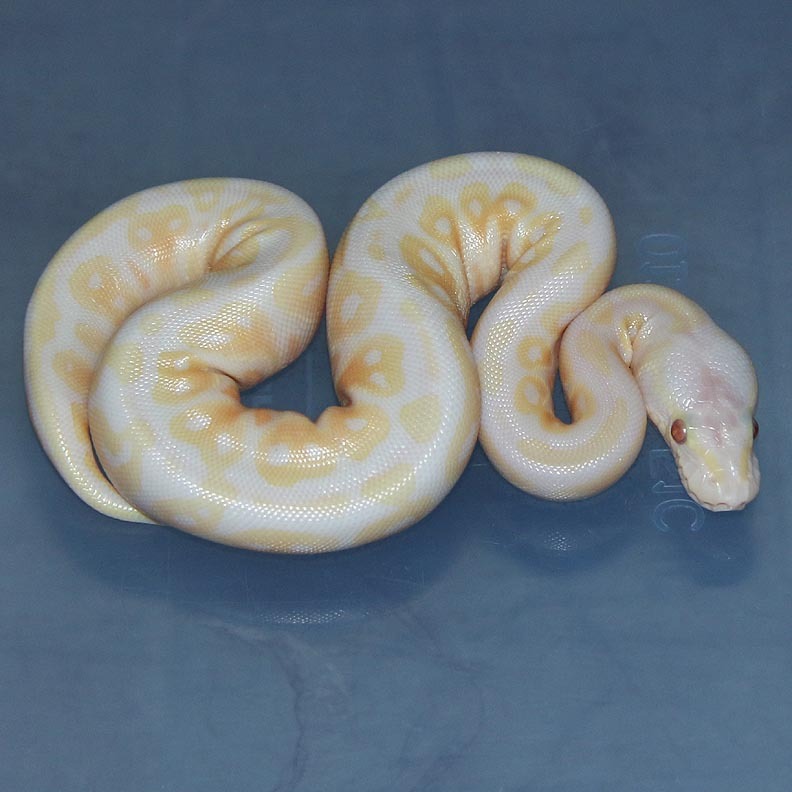 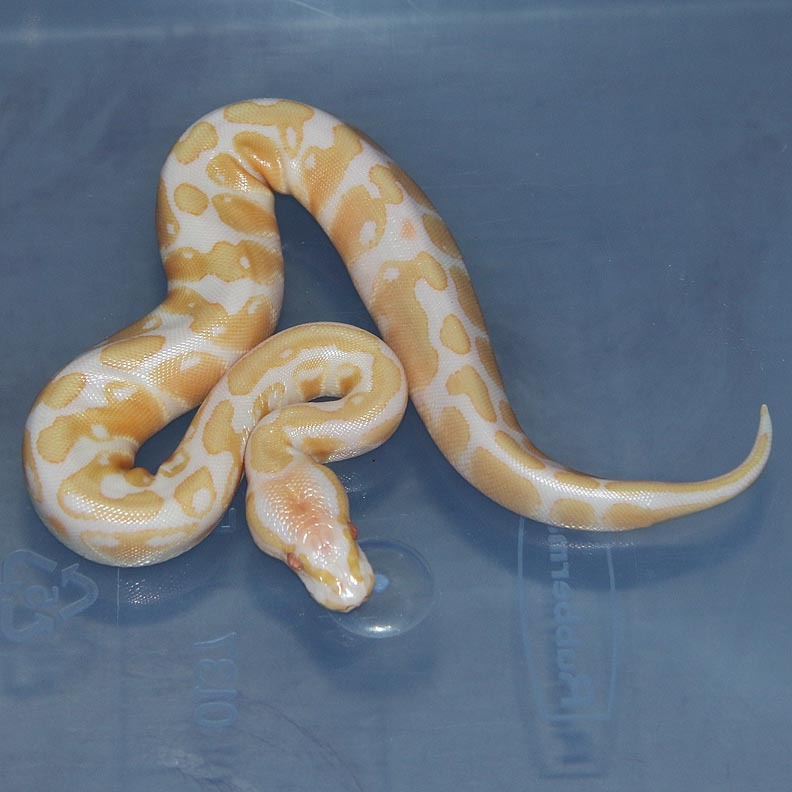 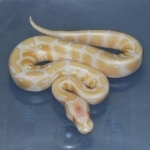 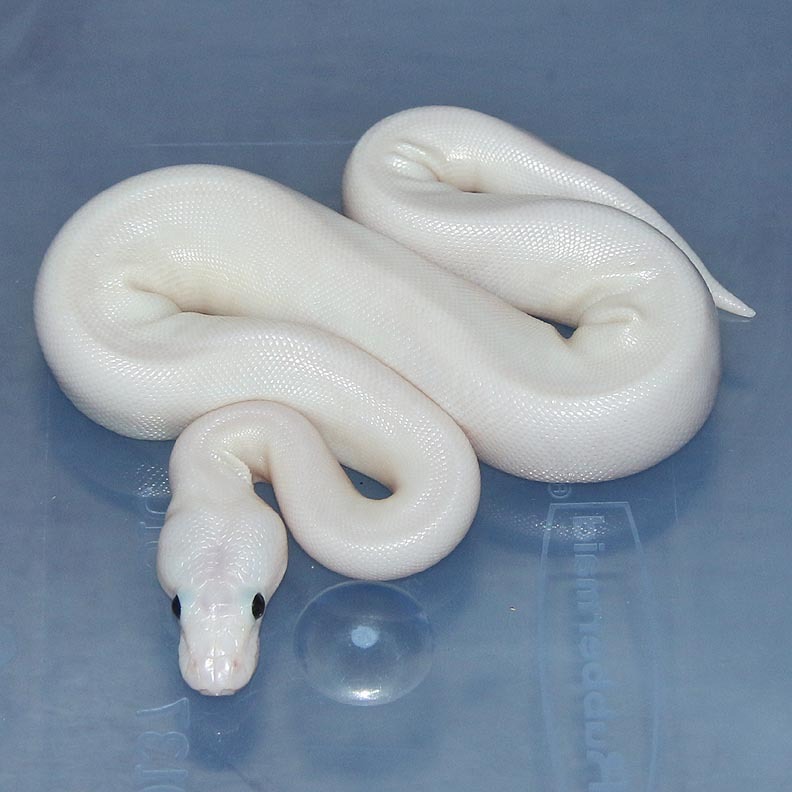 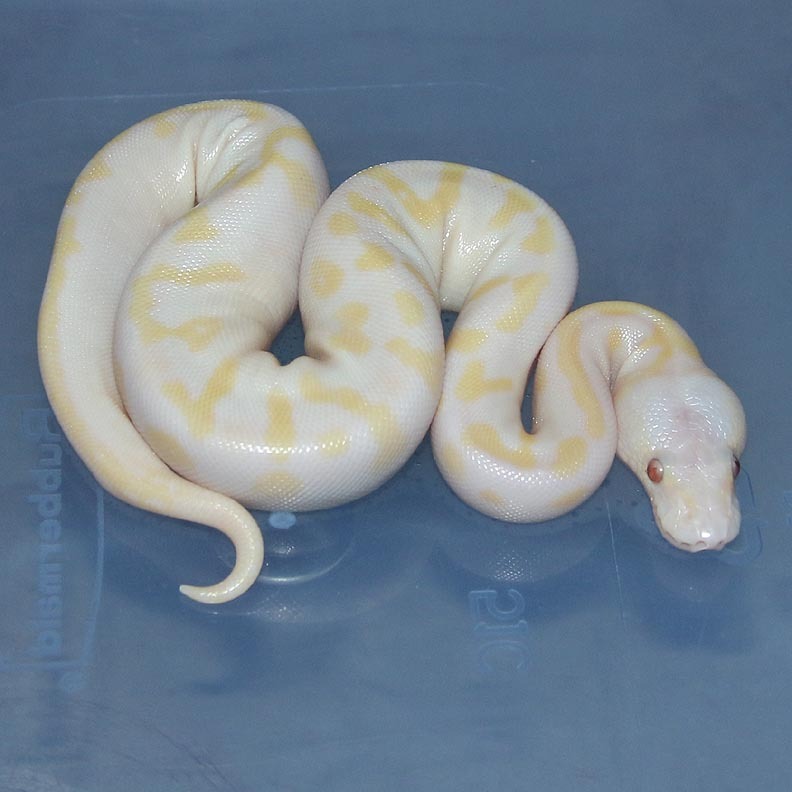 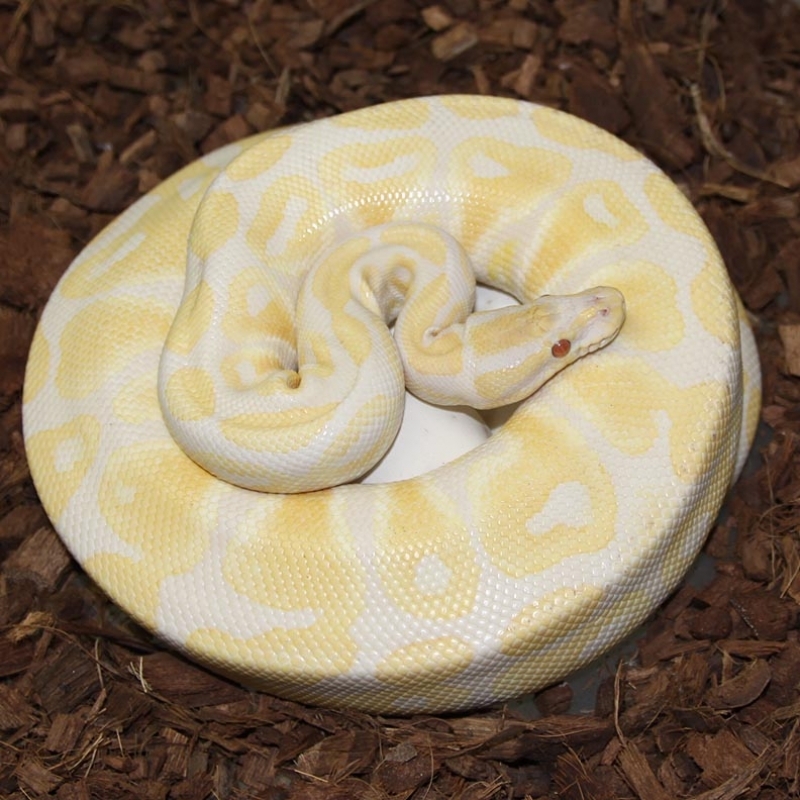 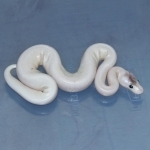 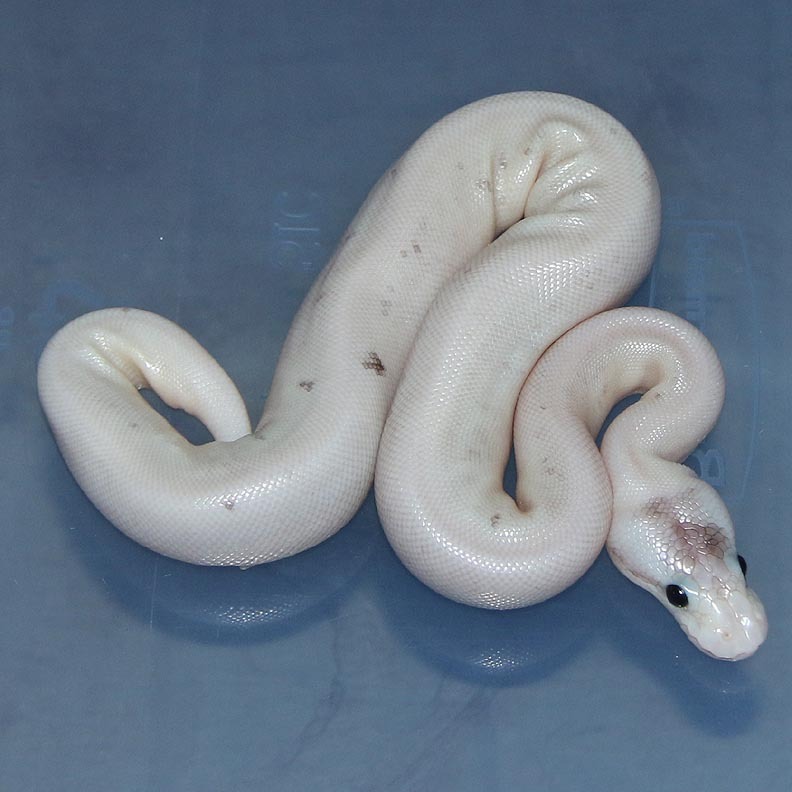 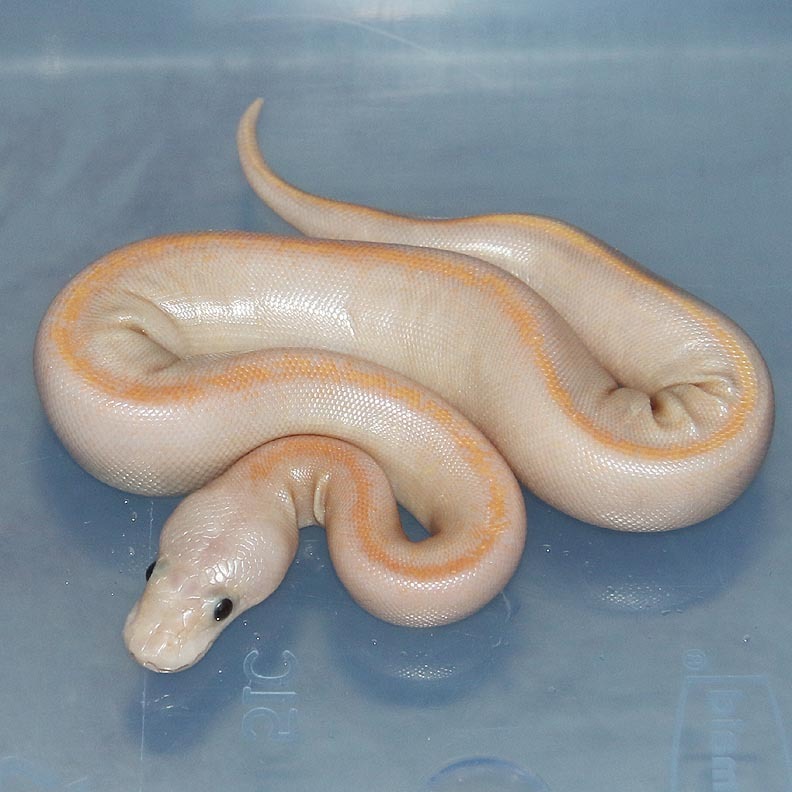 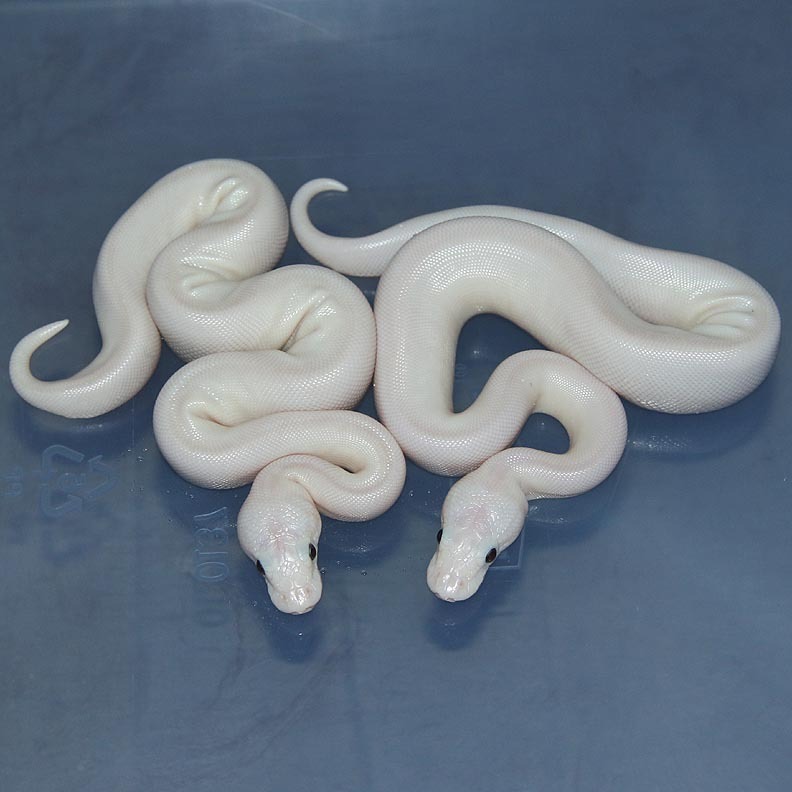 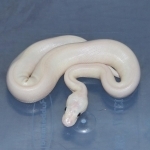 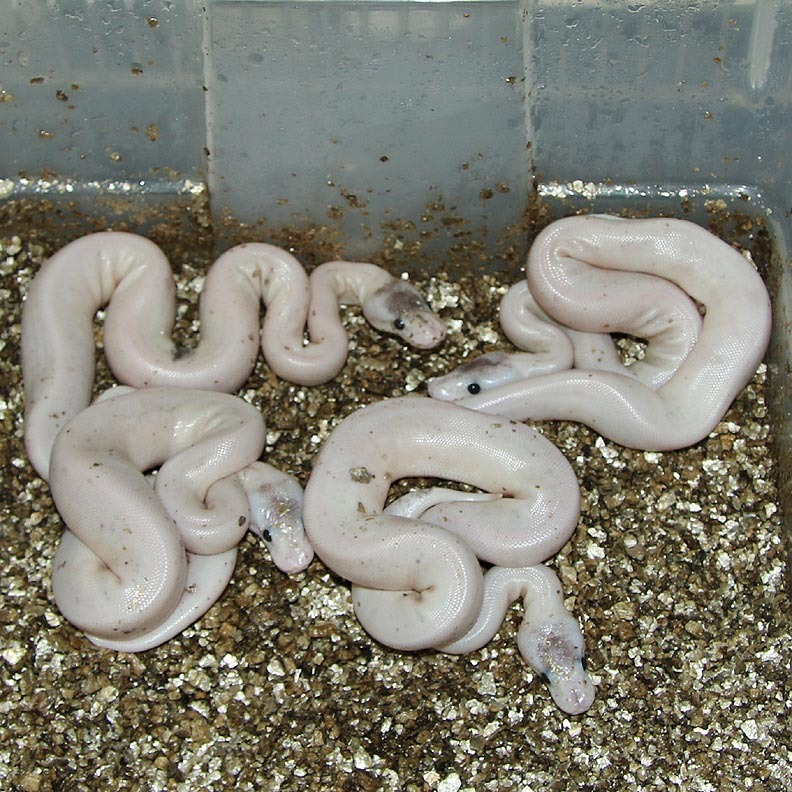 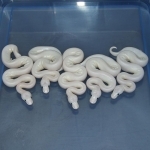 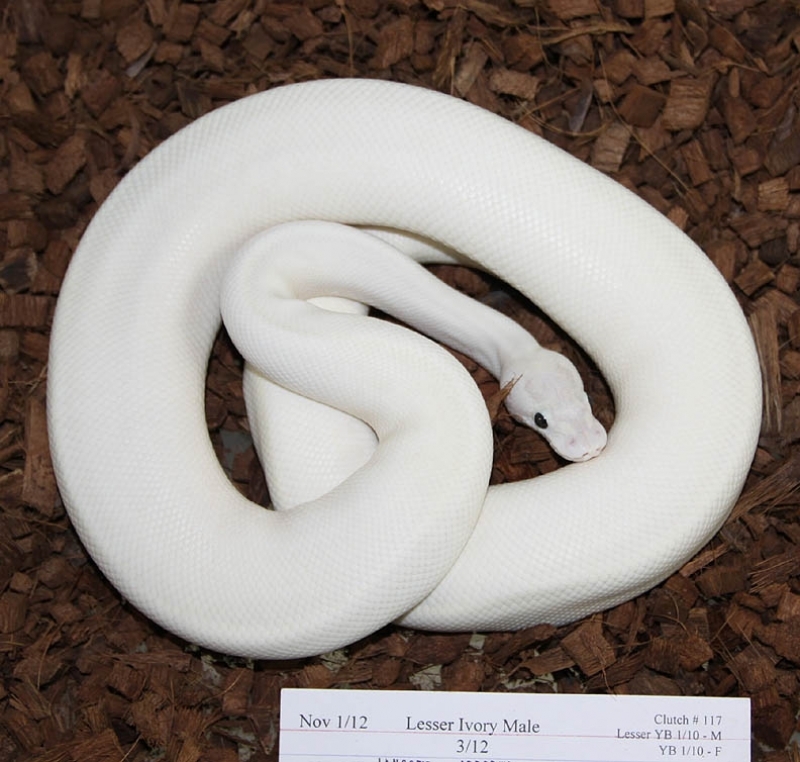 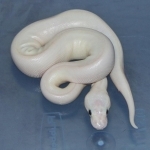 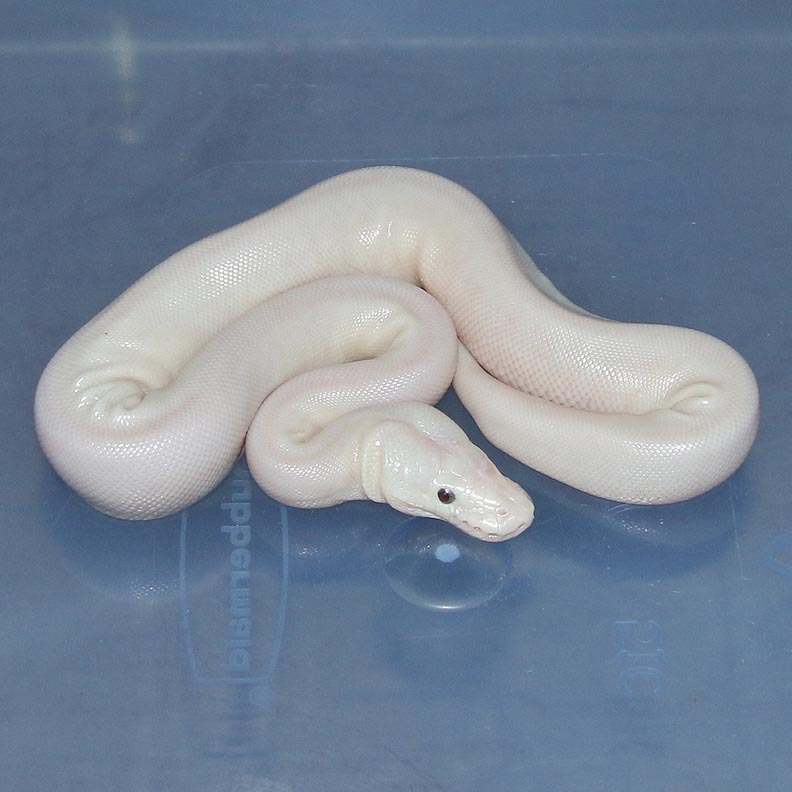 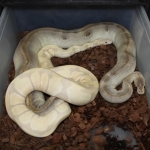 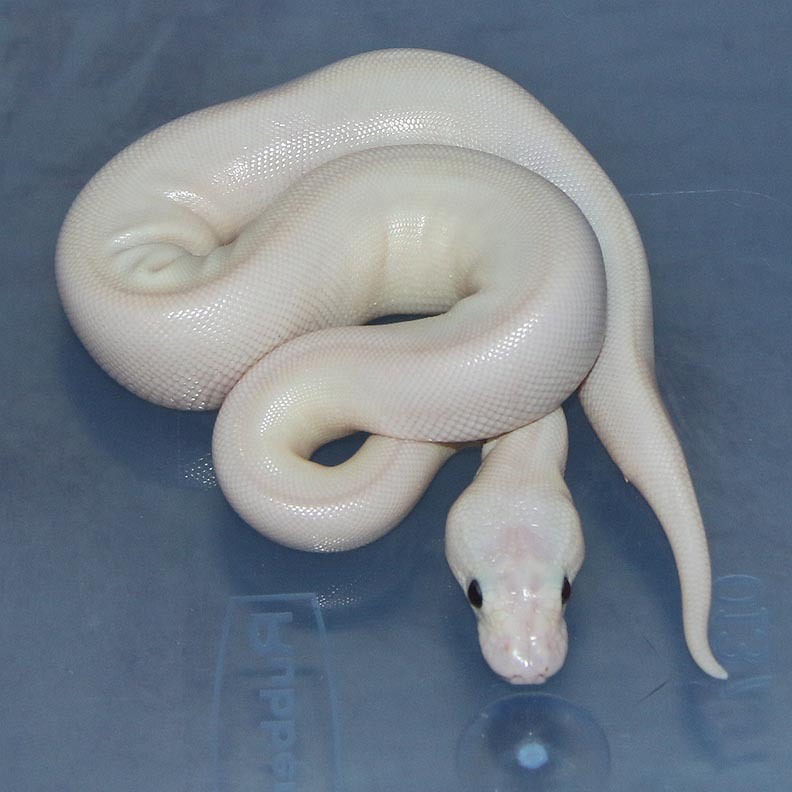 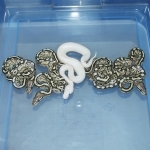 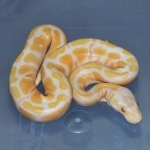 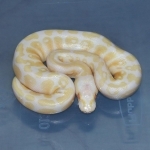 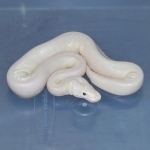 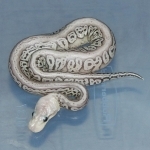 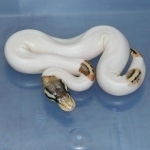 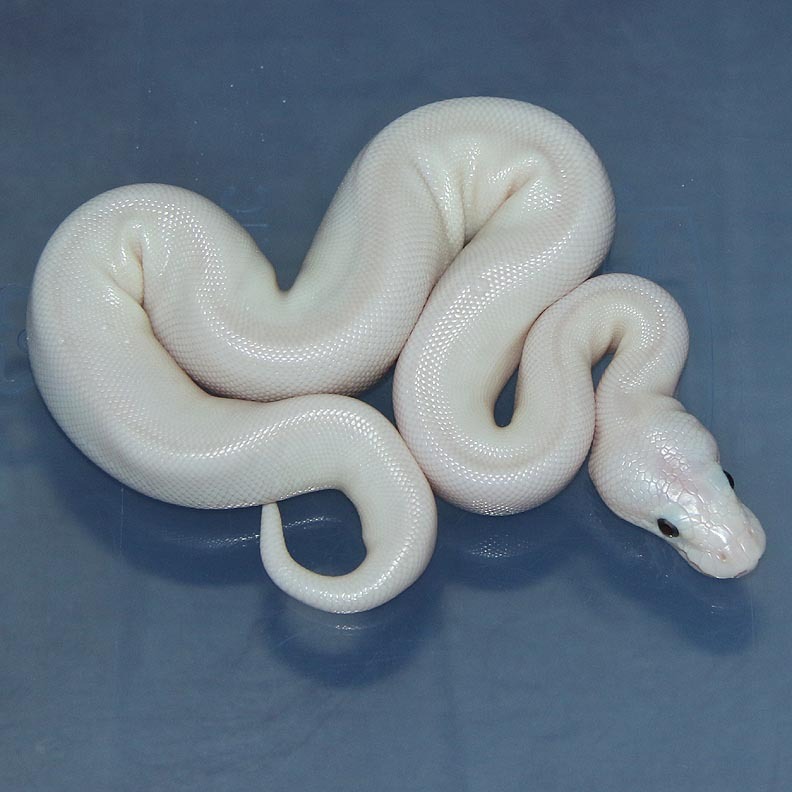 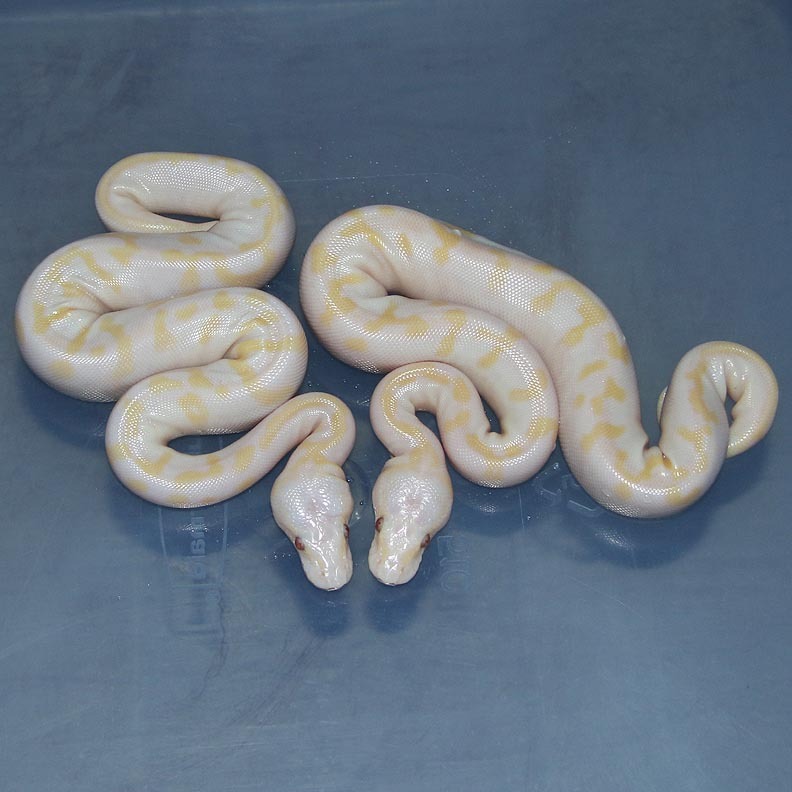 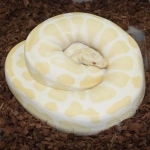 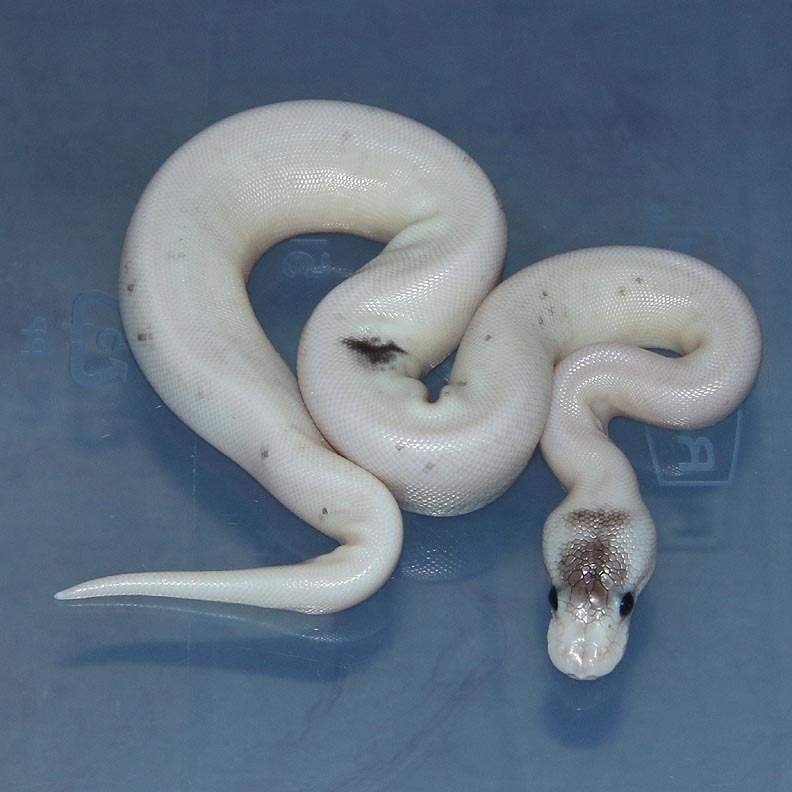 Description: Toffino 1/11 x Champagne Het Albino 1/11. 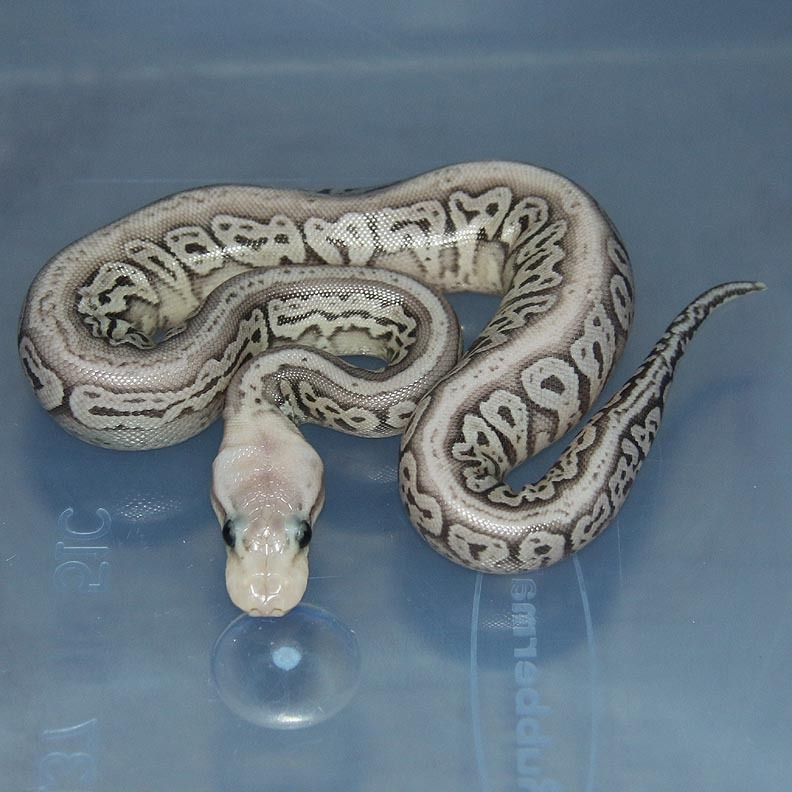 Description: Pastel Lavender Het Genetic Stripe 1/10 x Mutation X Pastel Genetic Stripe 1/11. 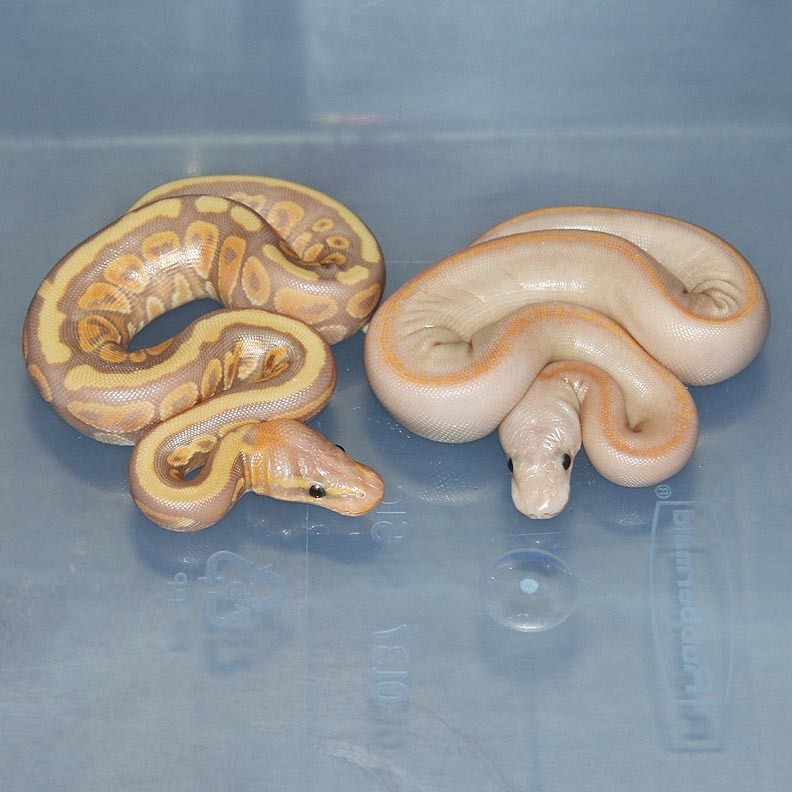 Description: Champagne Het Lavender 1/12 x Pastel Lavender PHGS 1/12. 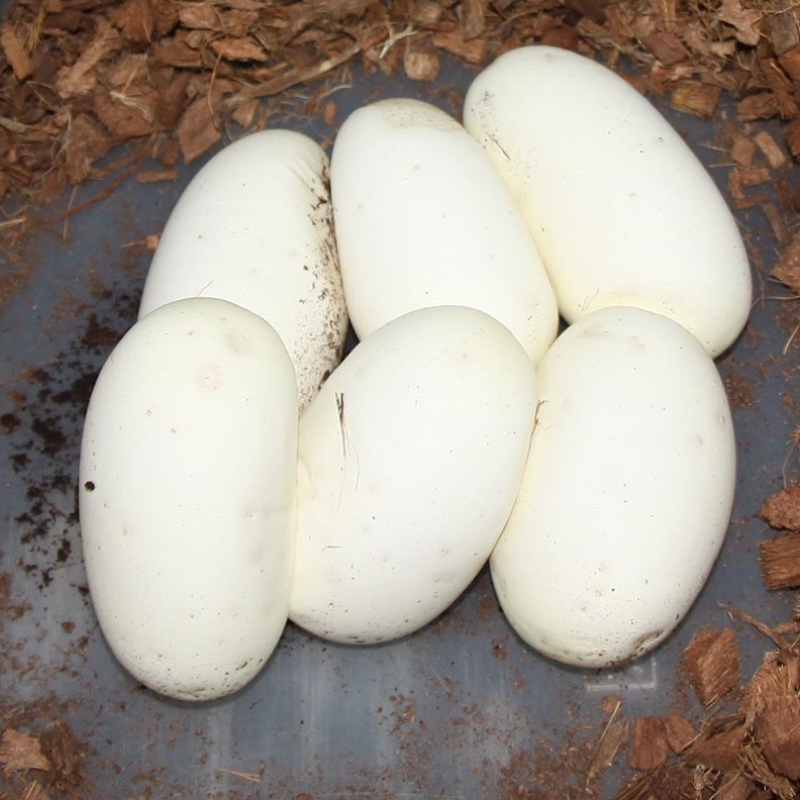 This entire clutch was Lavender! 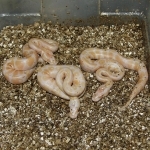 Description: Champagne Het Lavender 1/12 x Het Lavender 6/10 JW. 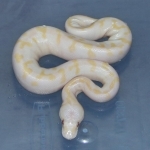 Description: Mahogany Het Albino 1/13 x Albino 1/07 JC. 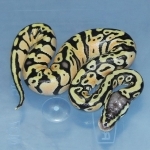 Description: Mutation X Bumble Bee HRA 1/13 x Red Axanthic 1/07. 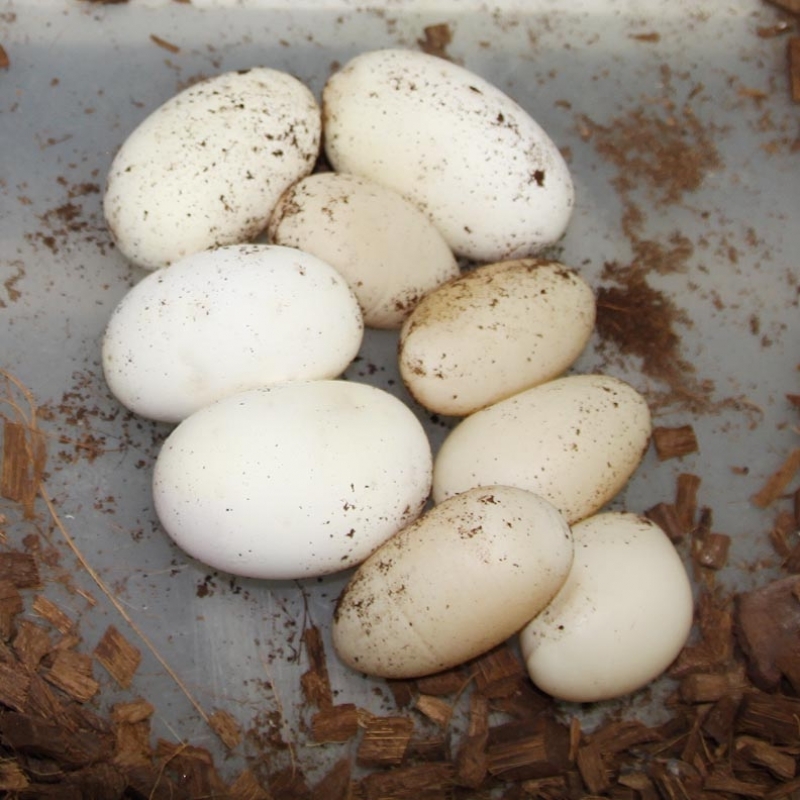 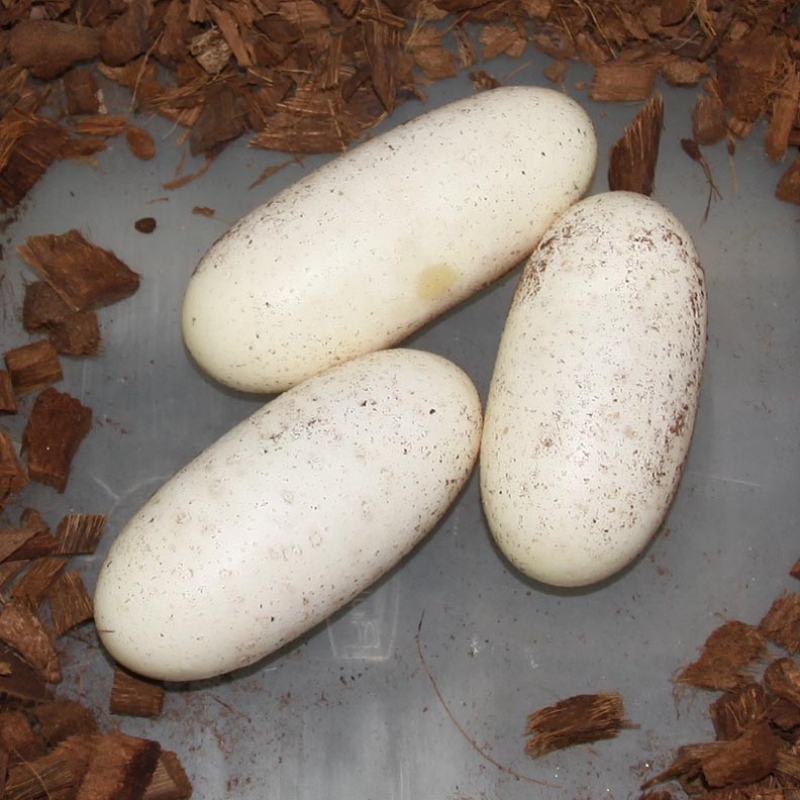 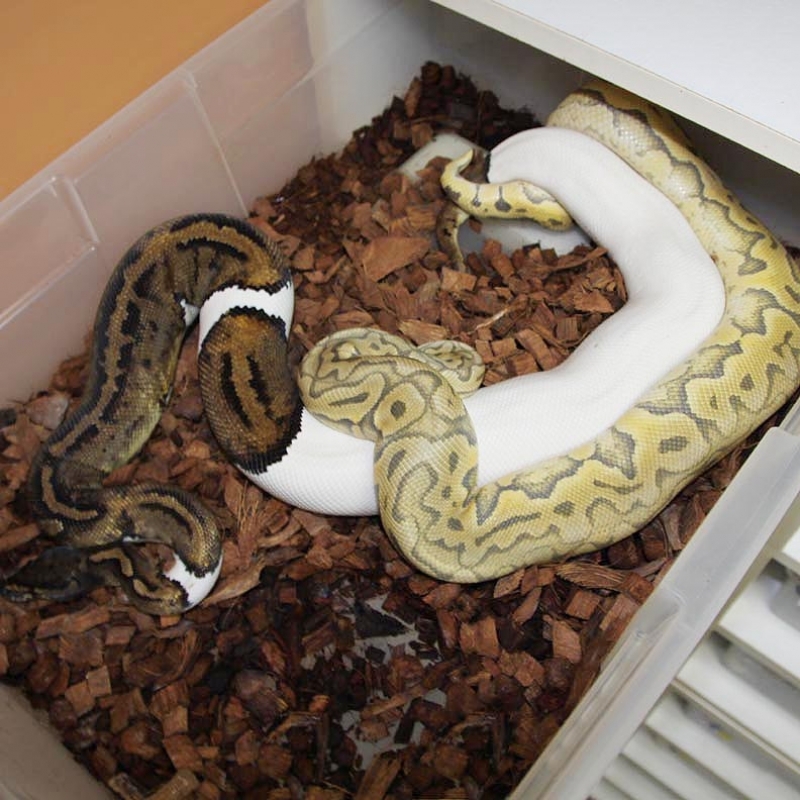 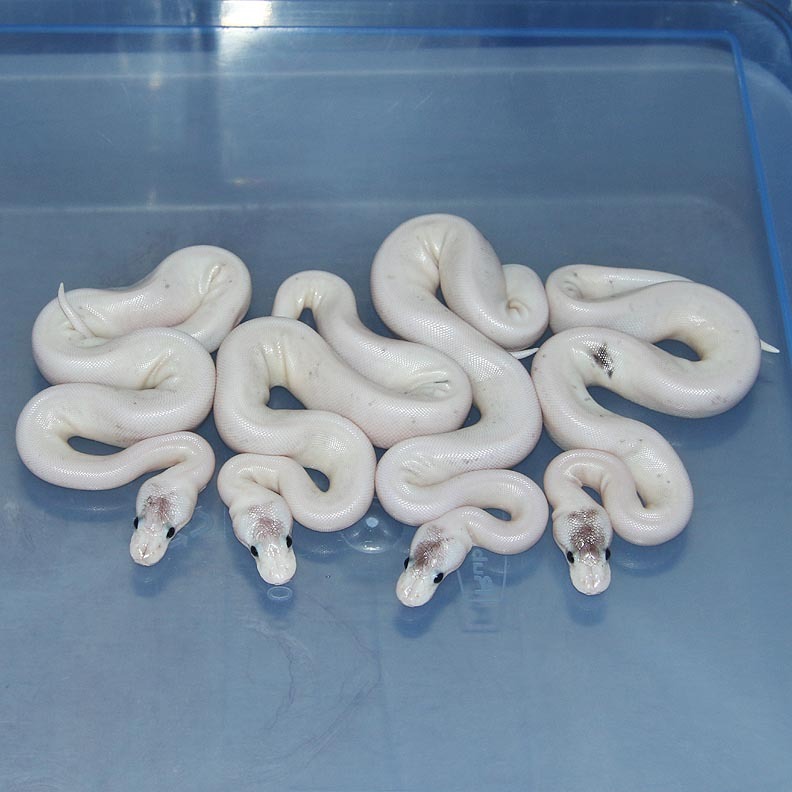 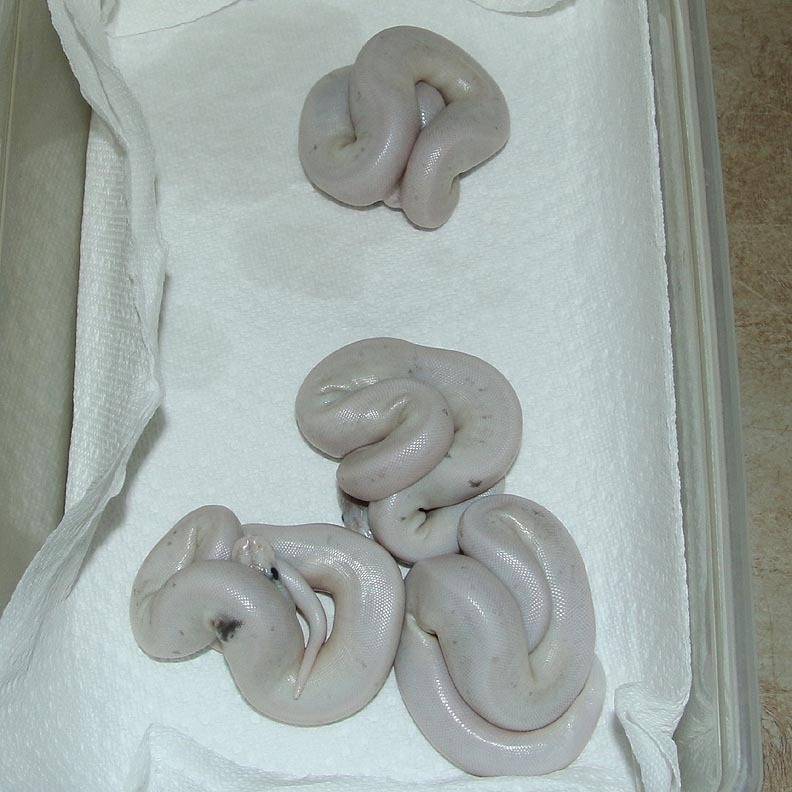 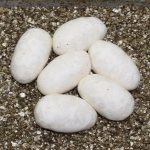 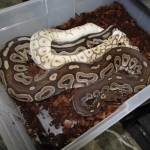 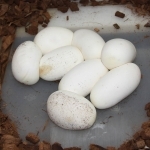 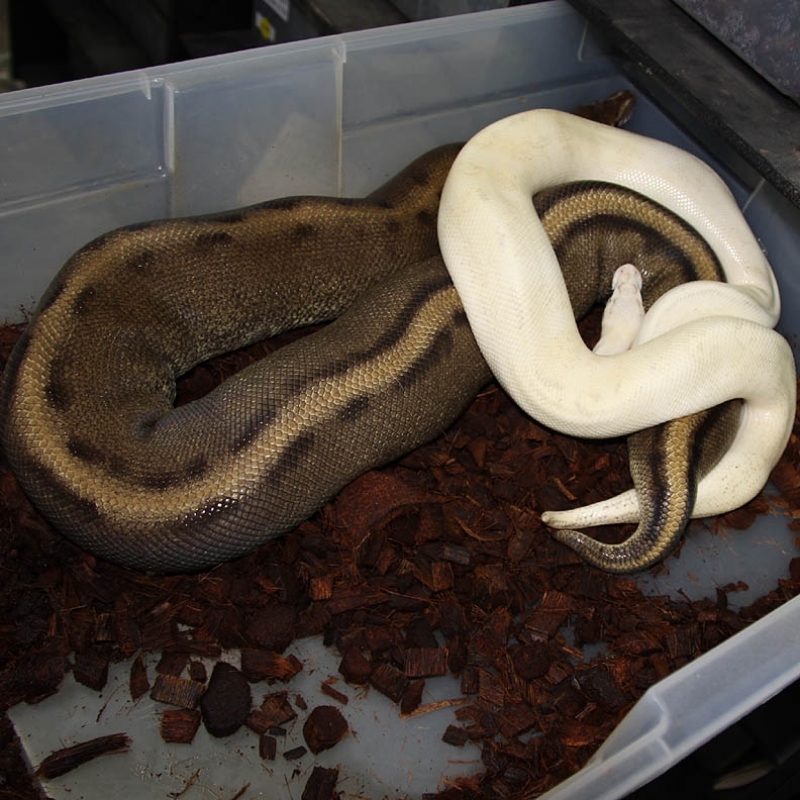 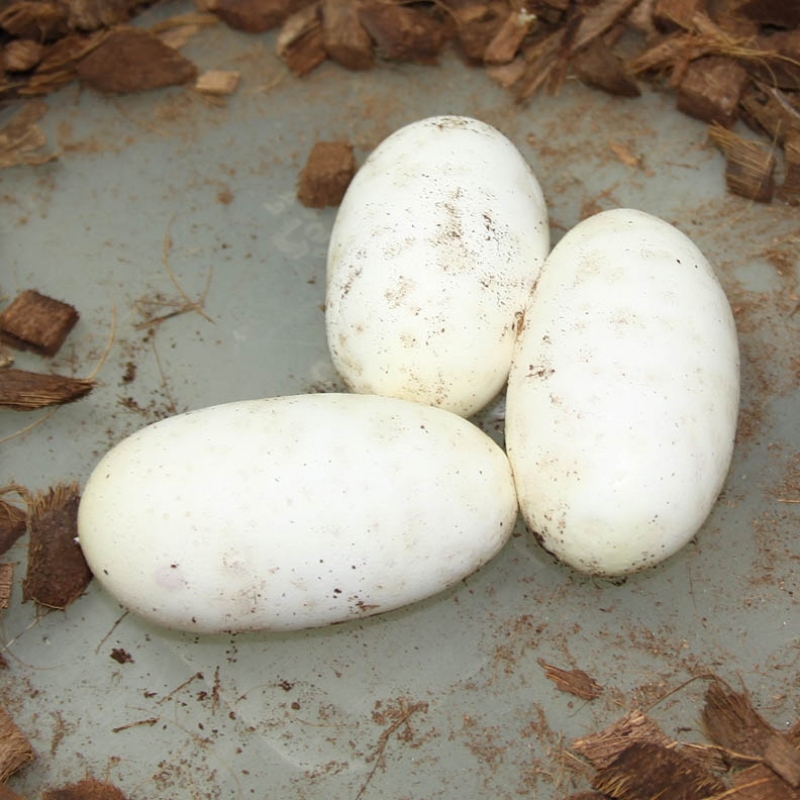 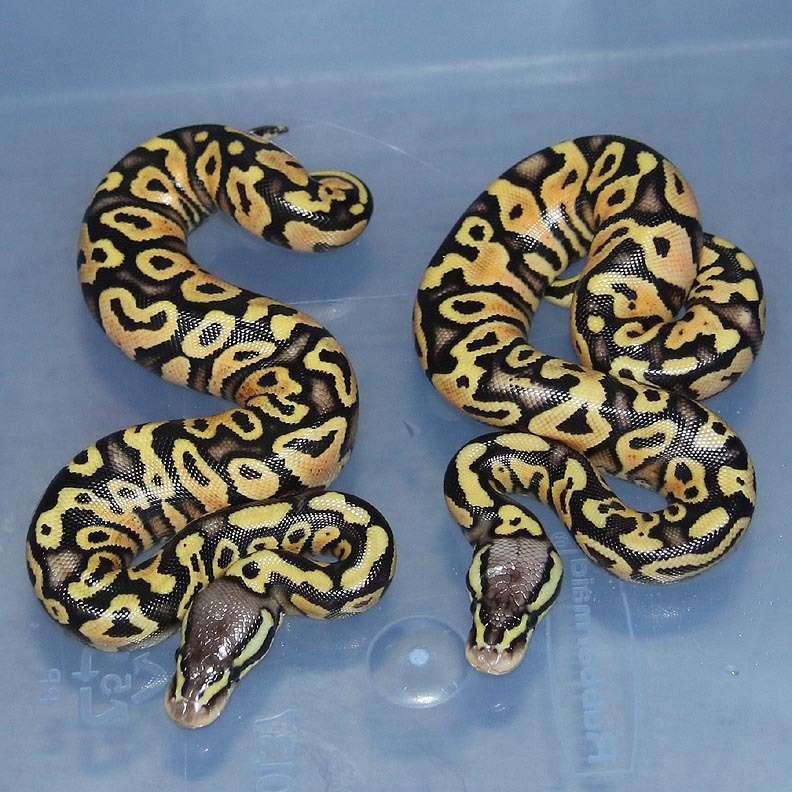 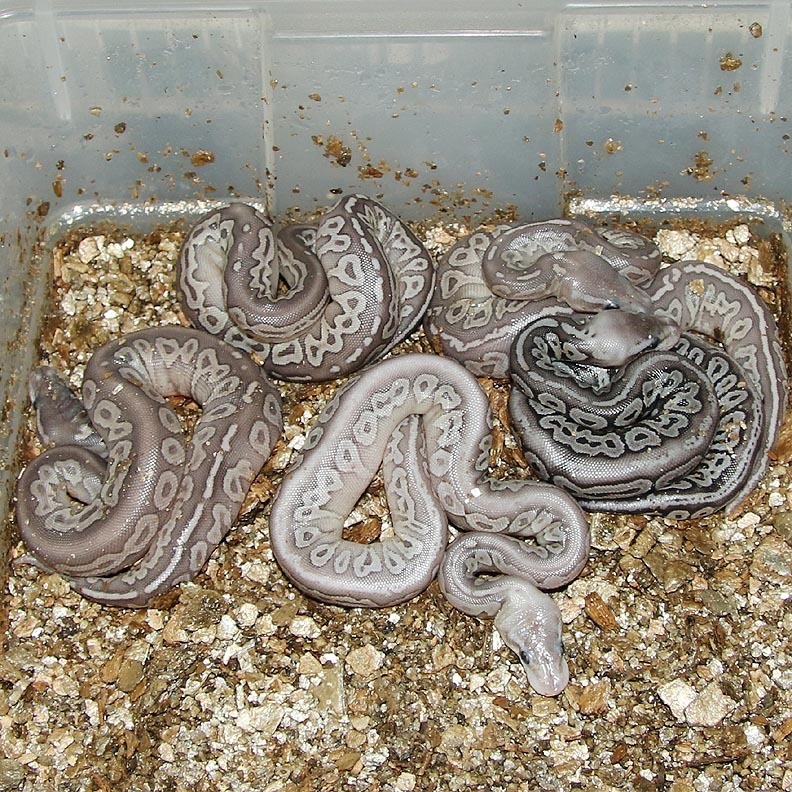 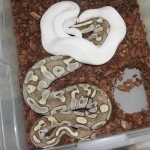 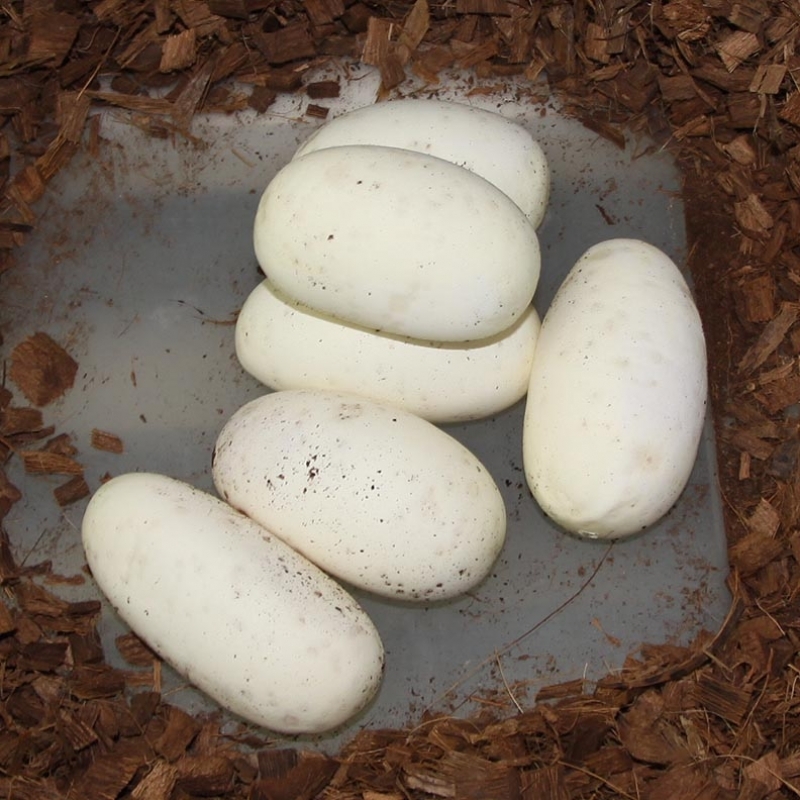 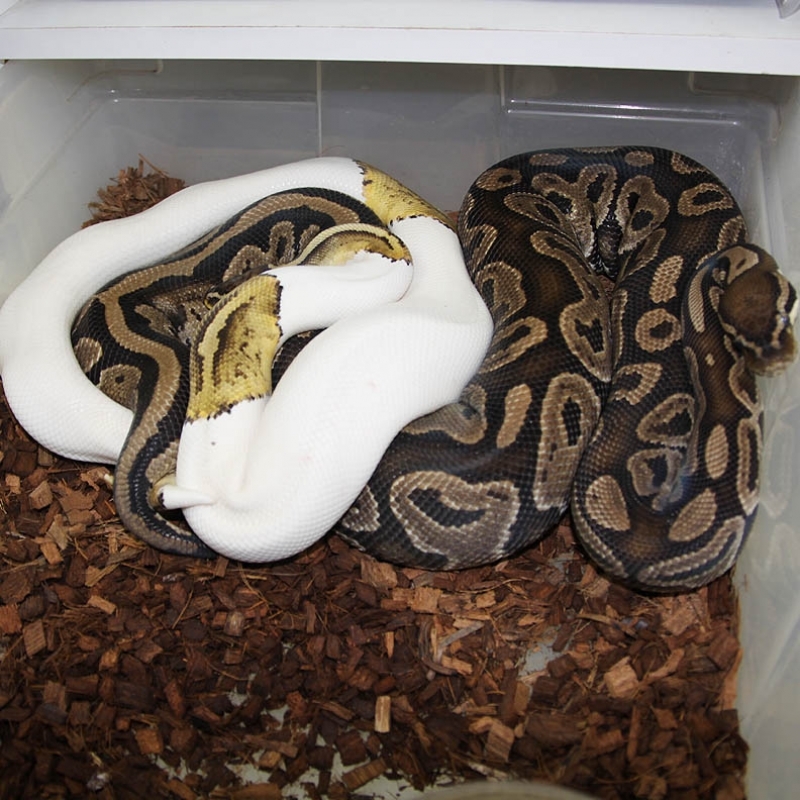 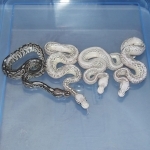 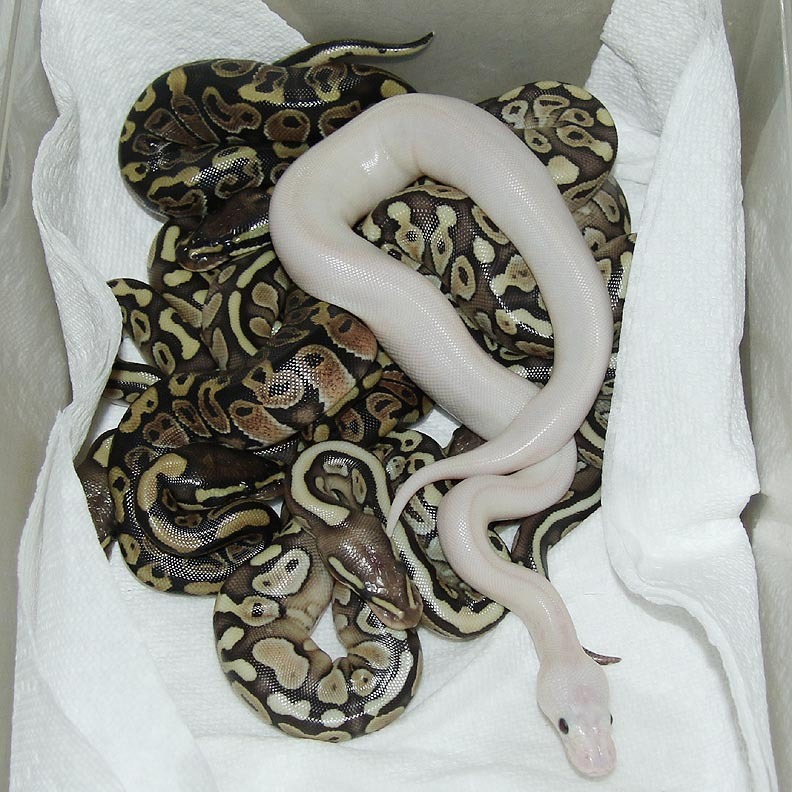 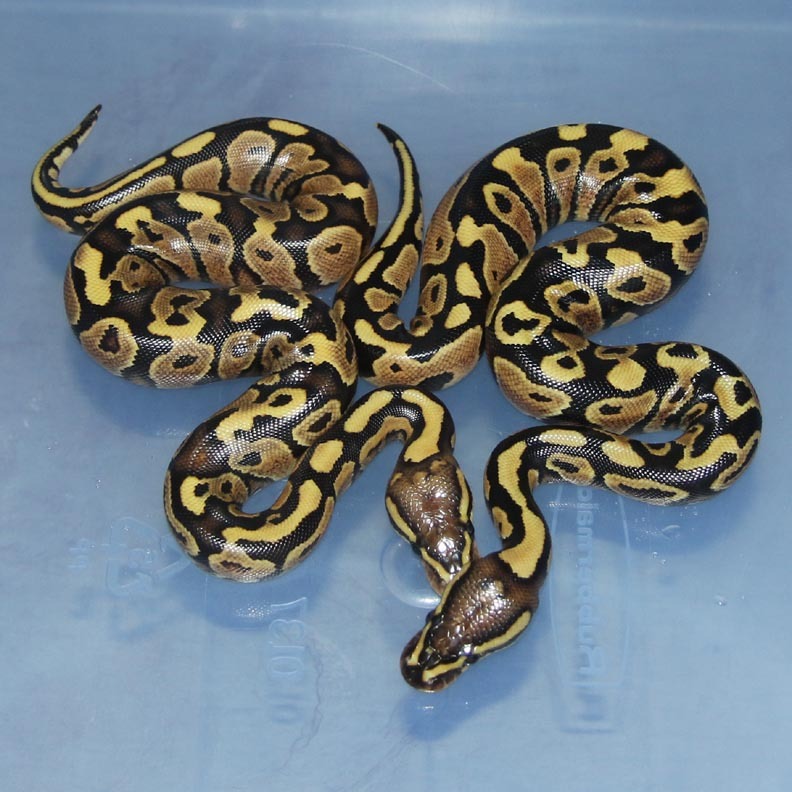 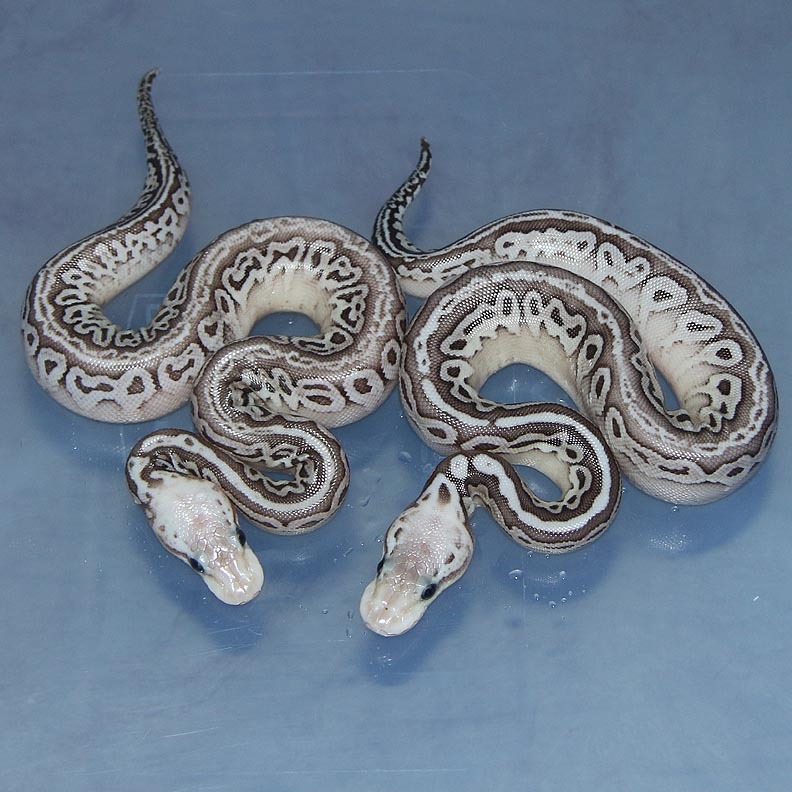 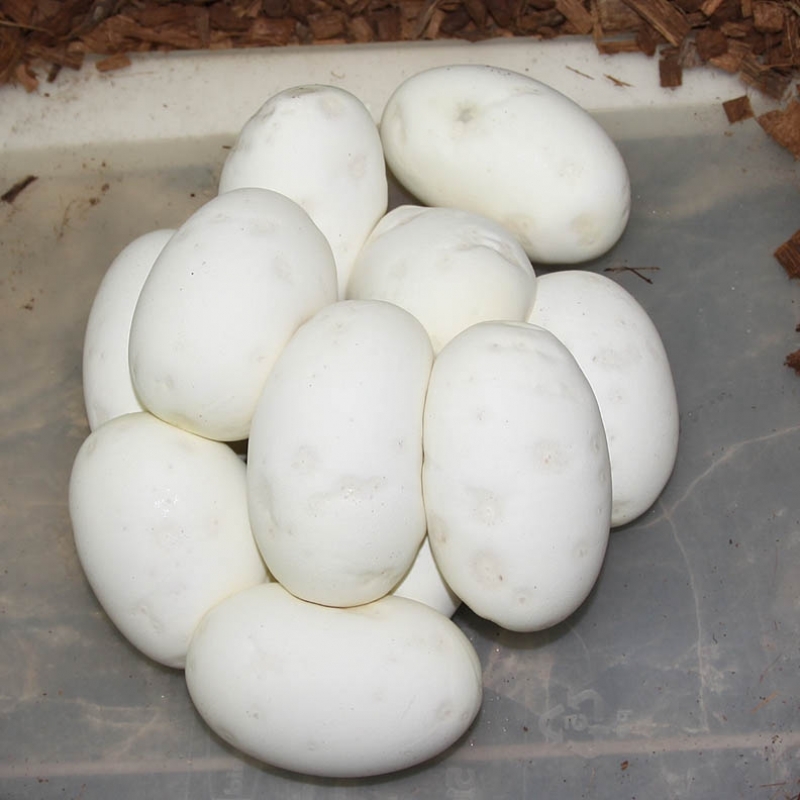 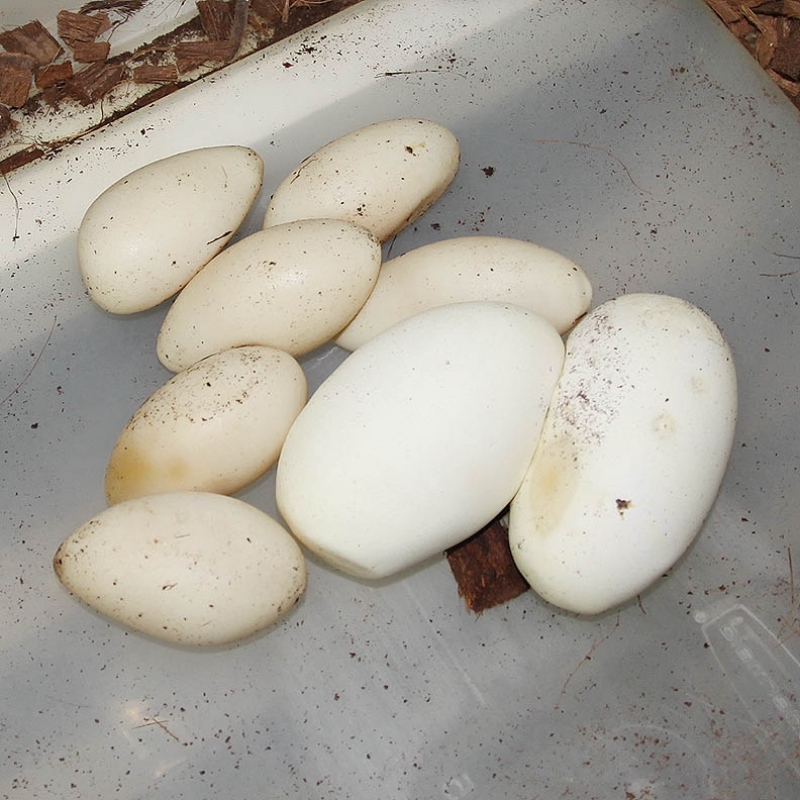 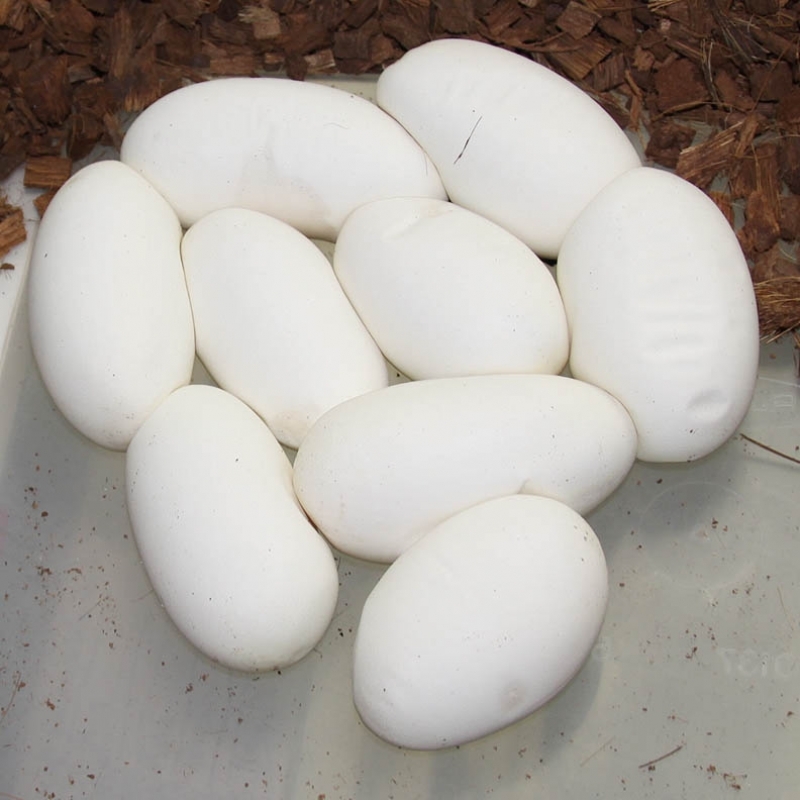 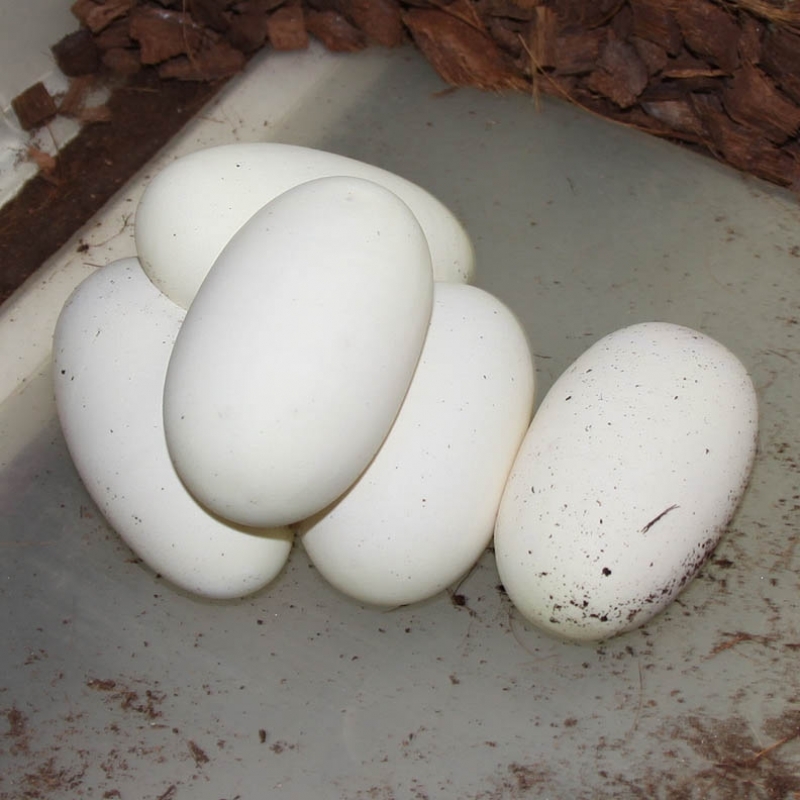 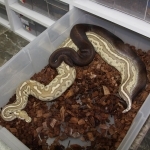 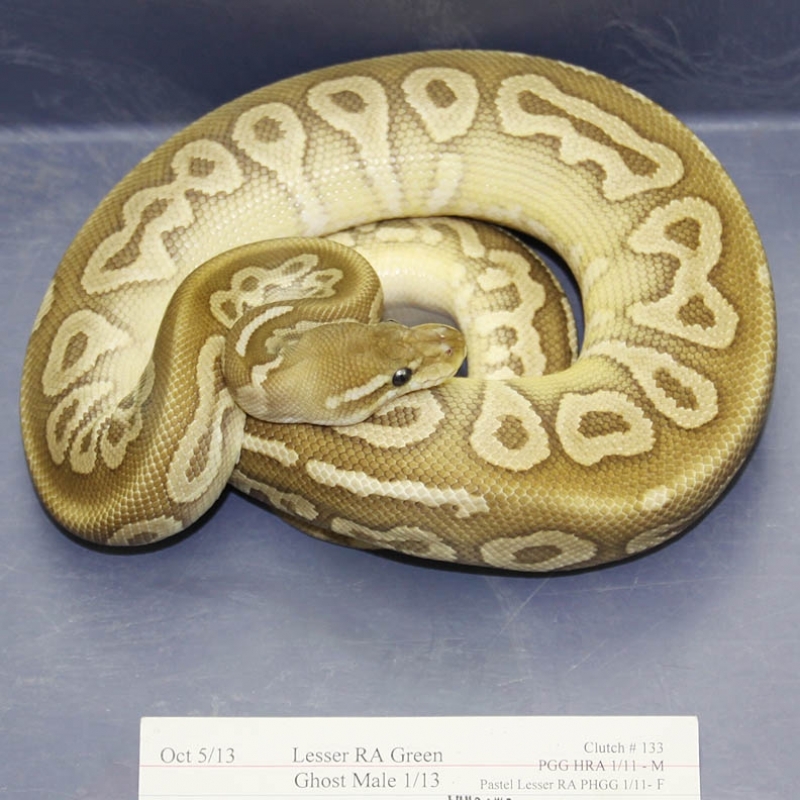 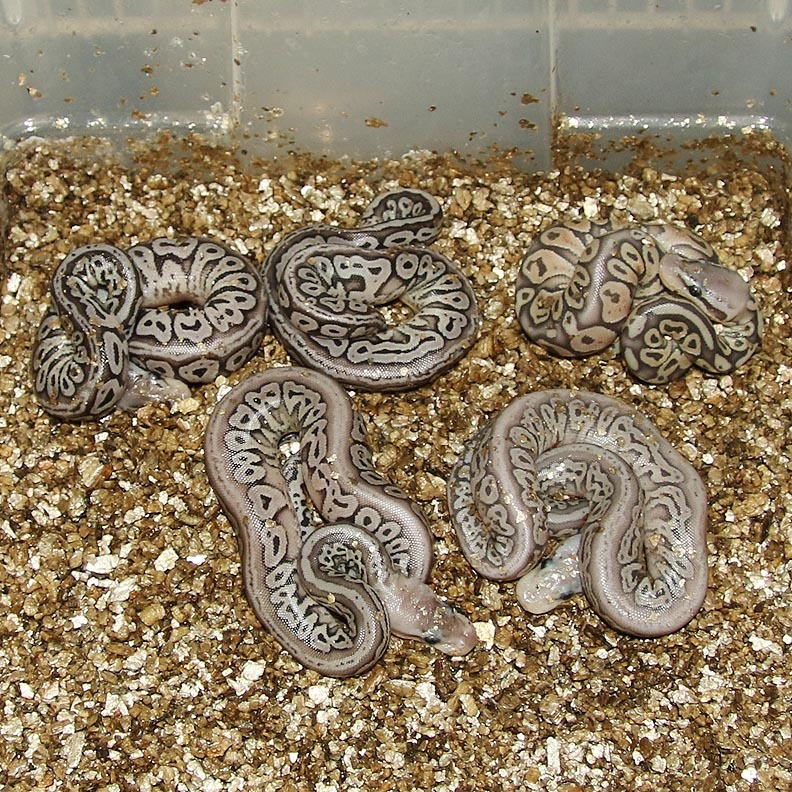 Description: Super Pastel Green Ghost Lesser HRA 1/13 x Lesser Chocolate PHGG 1/11. Description: Super Pastel Puzzle 1/12 x Pied 1/10 Sid. 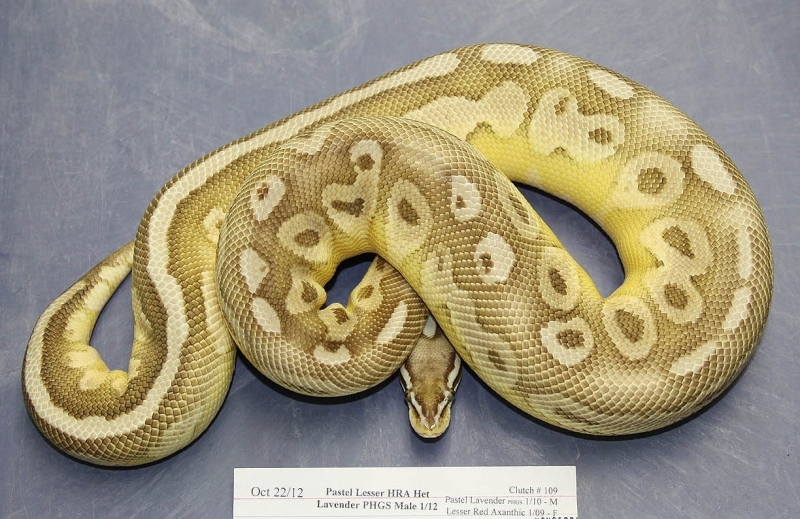 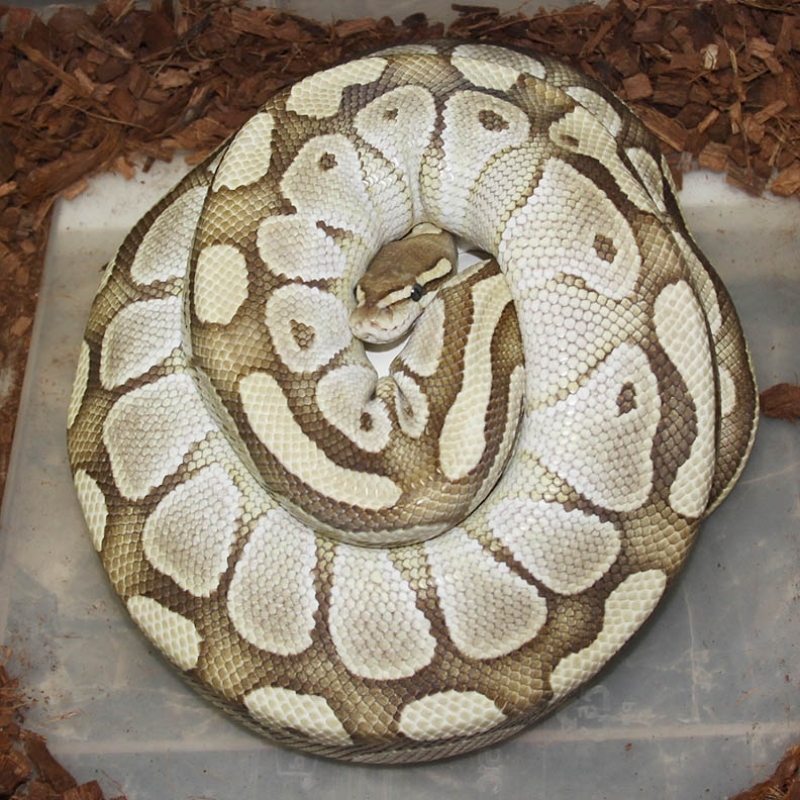 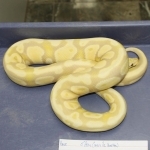 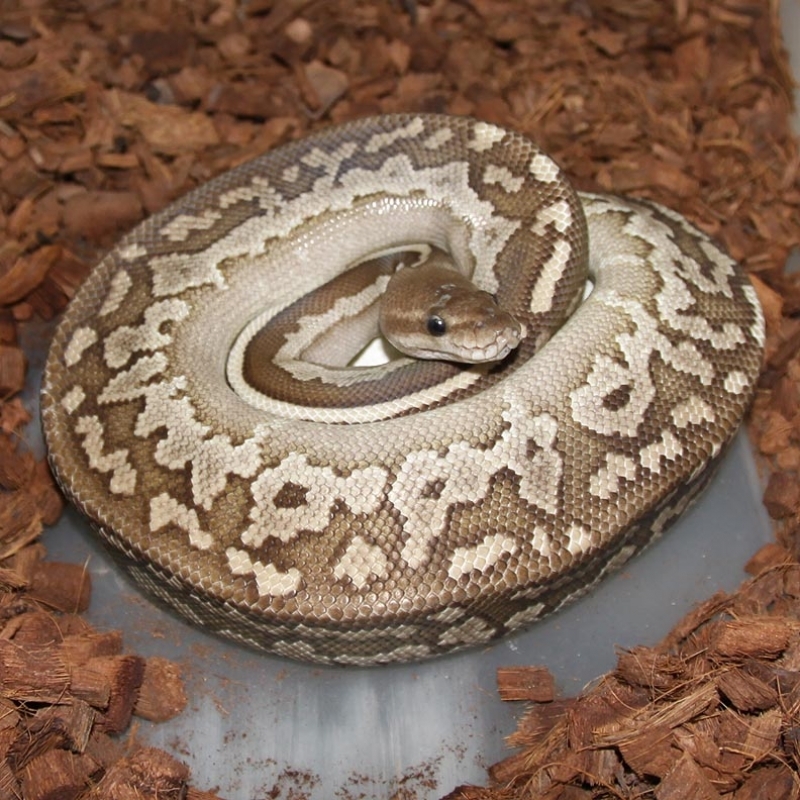 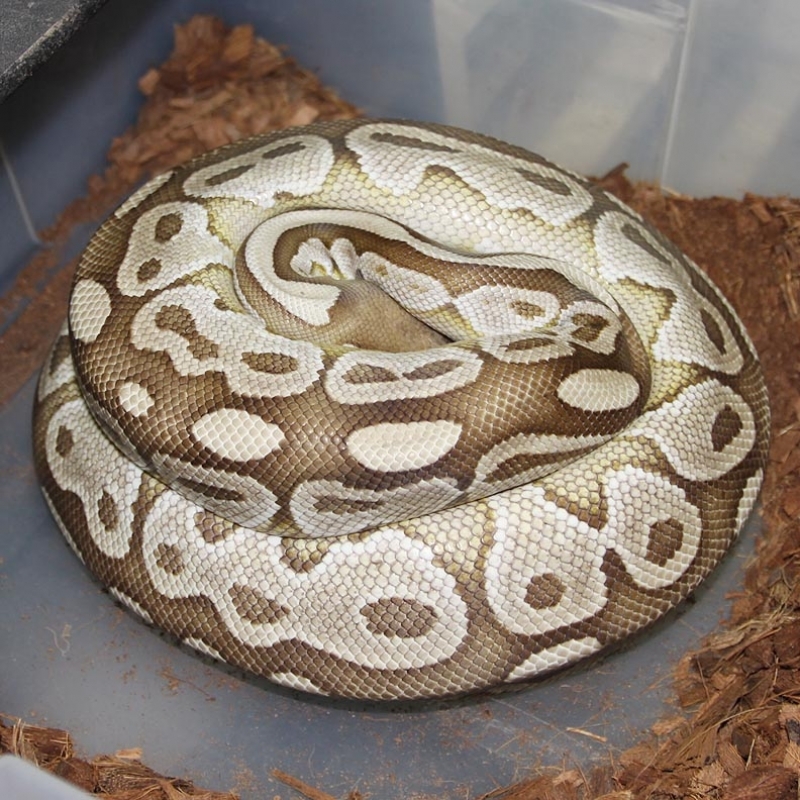 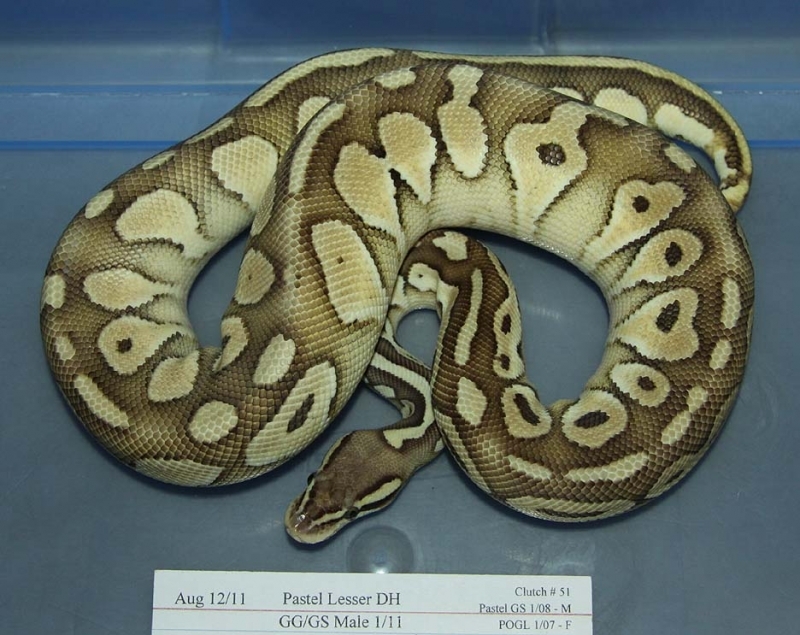 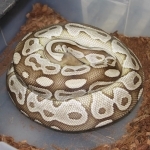 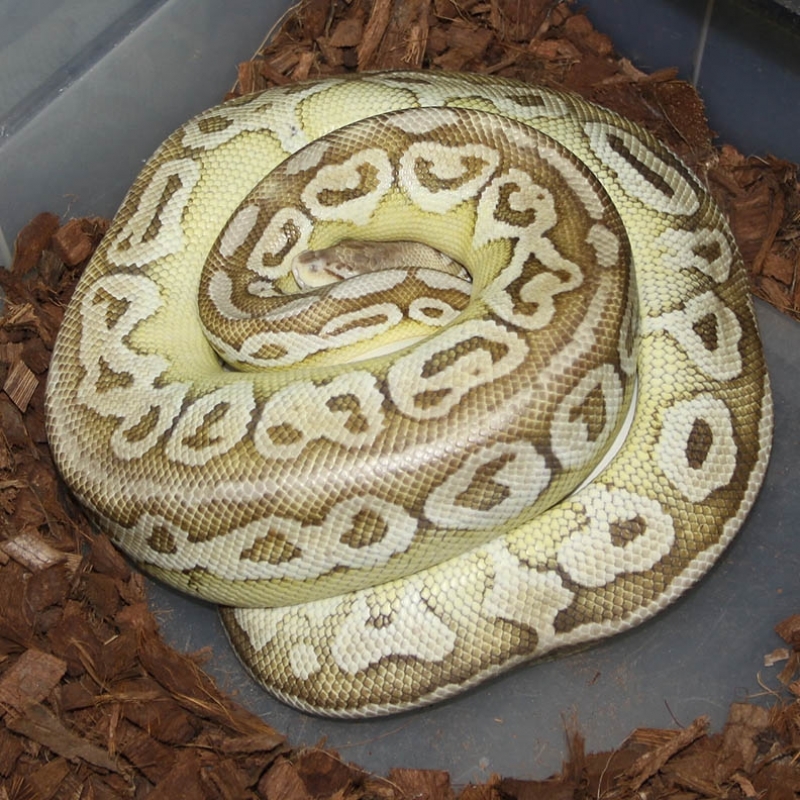 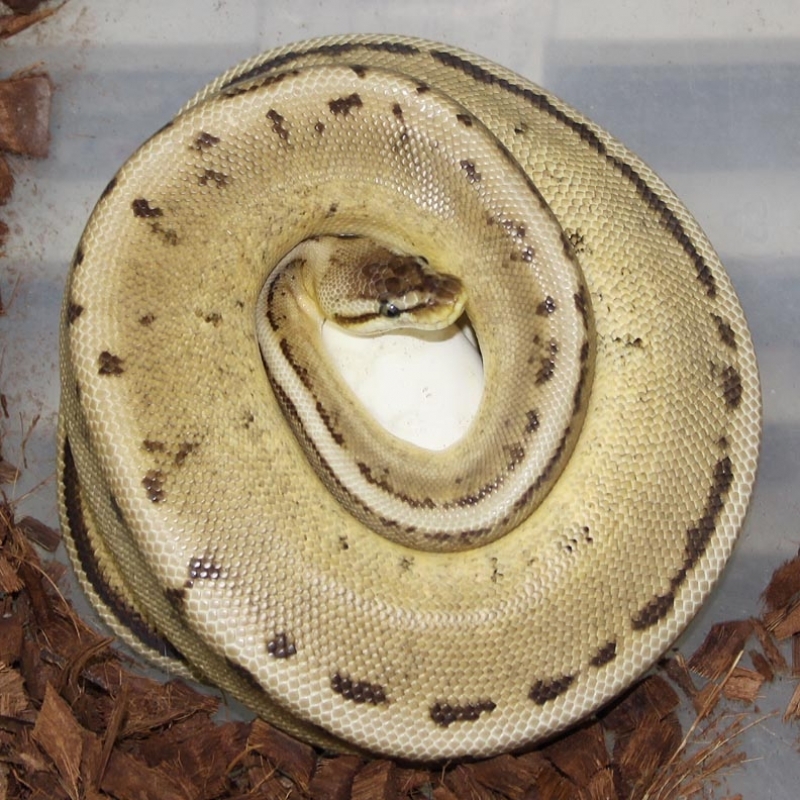 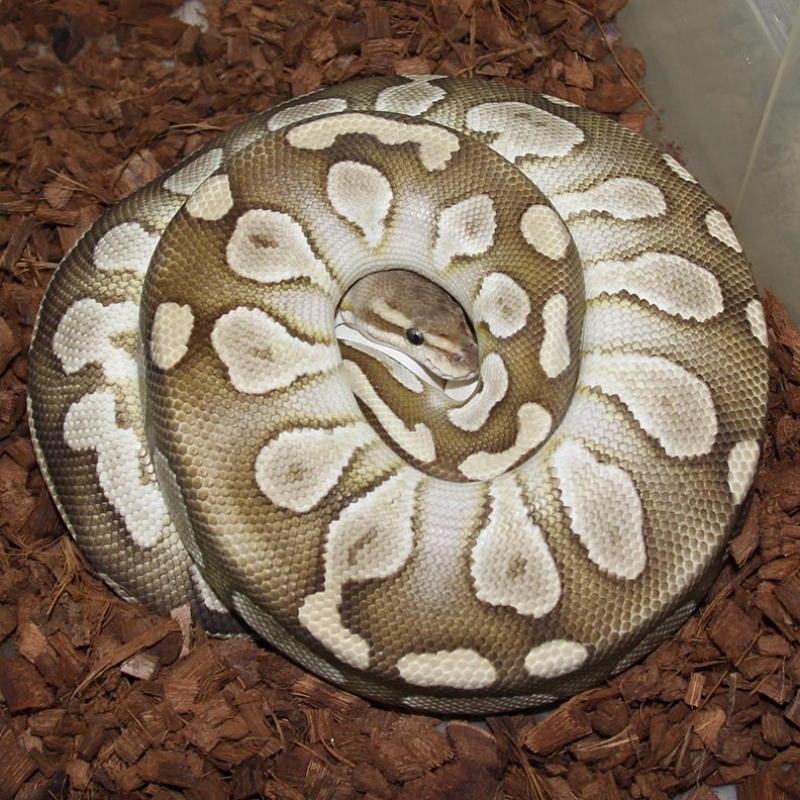 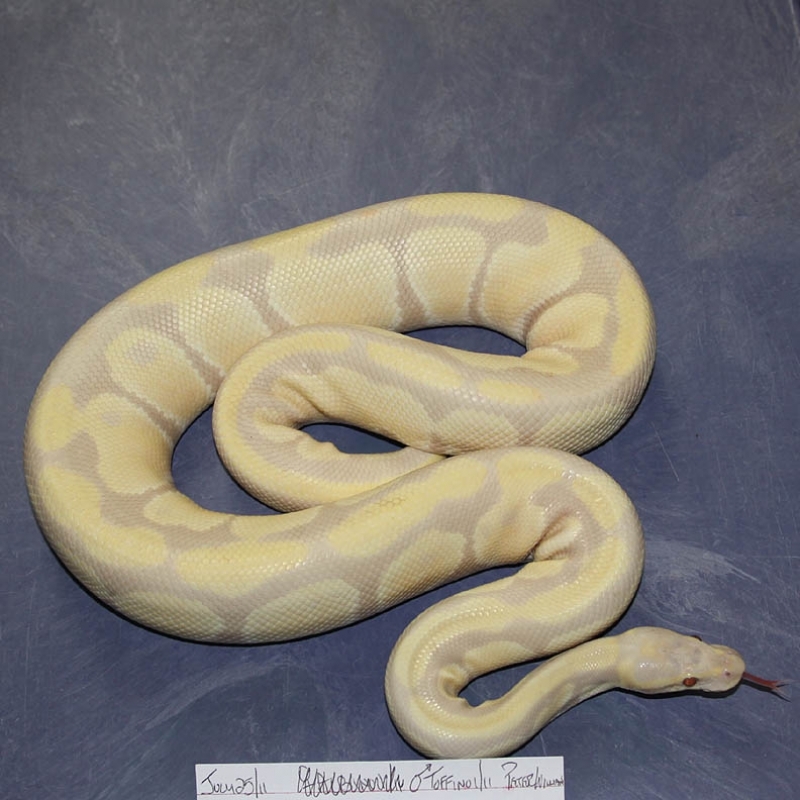 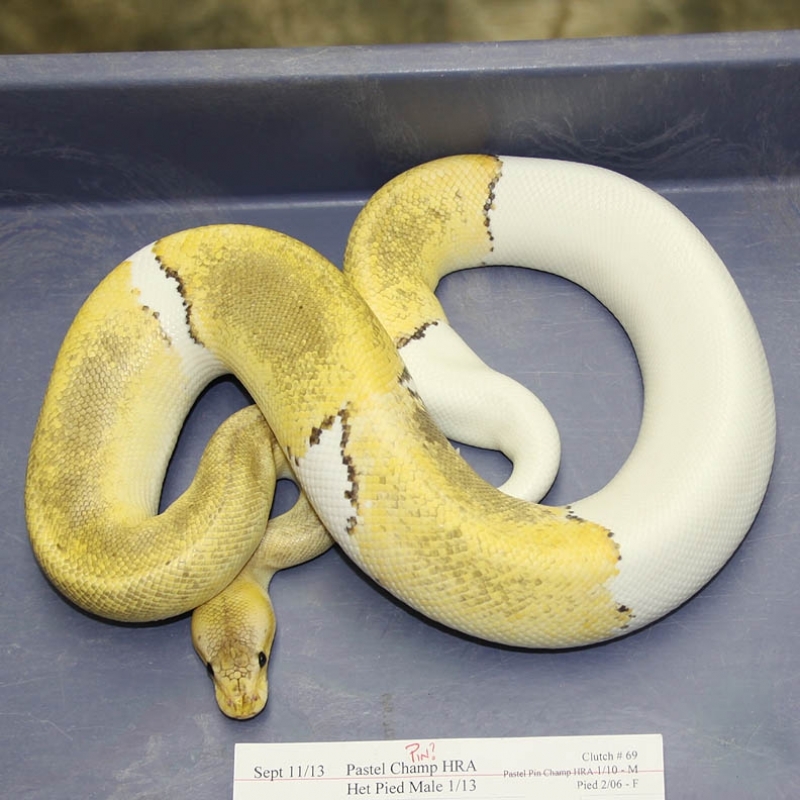 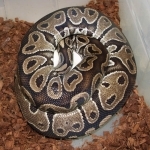 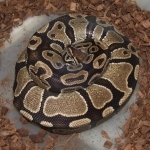 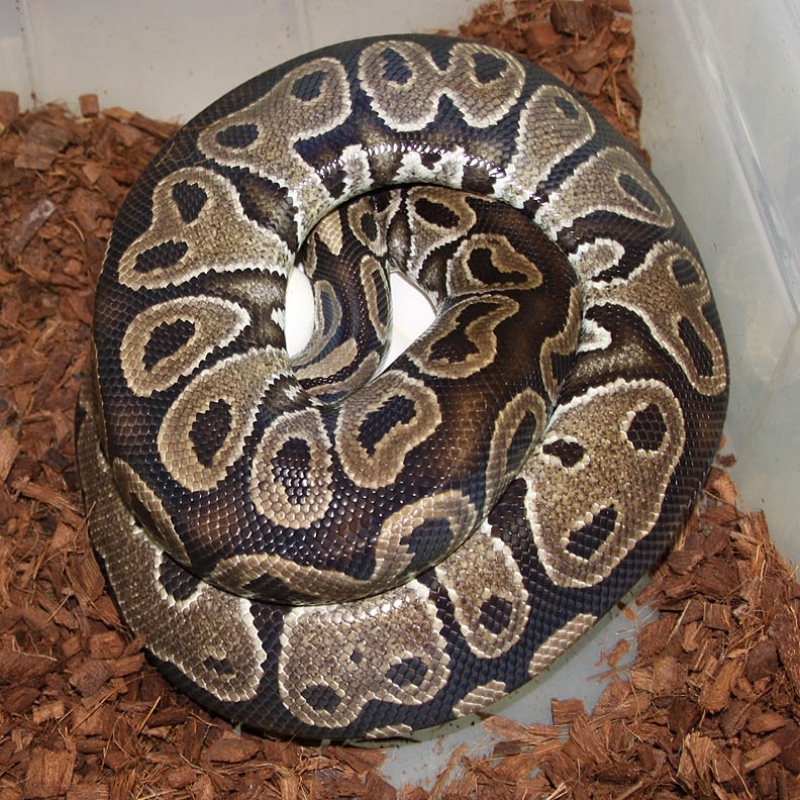 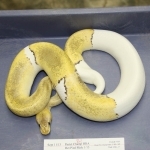 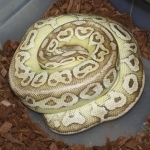 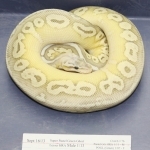 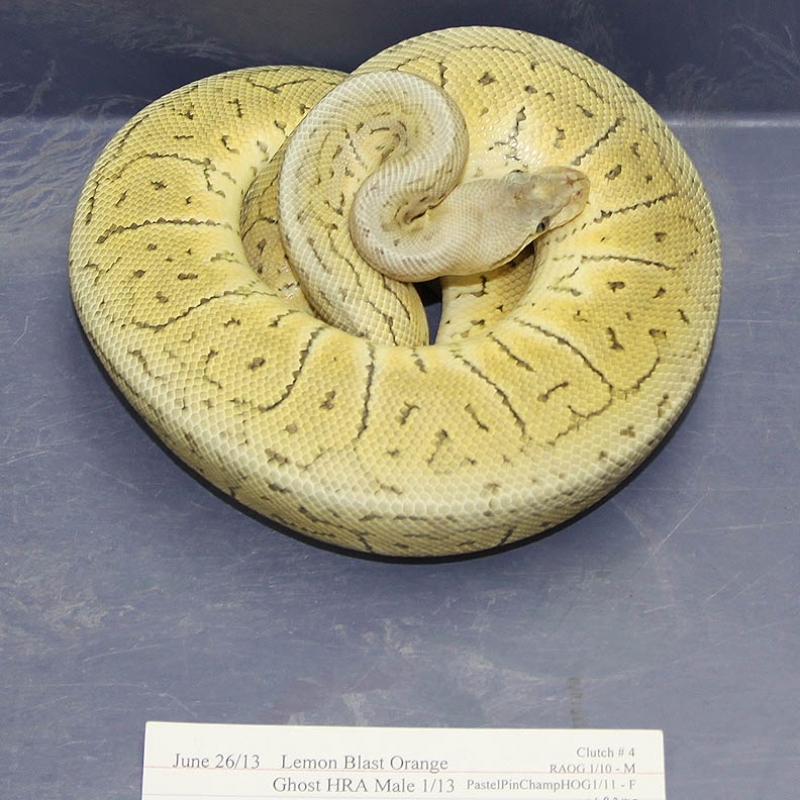 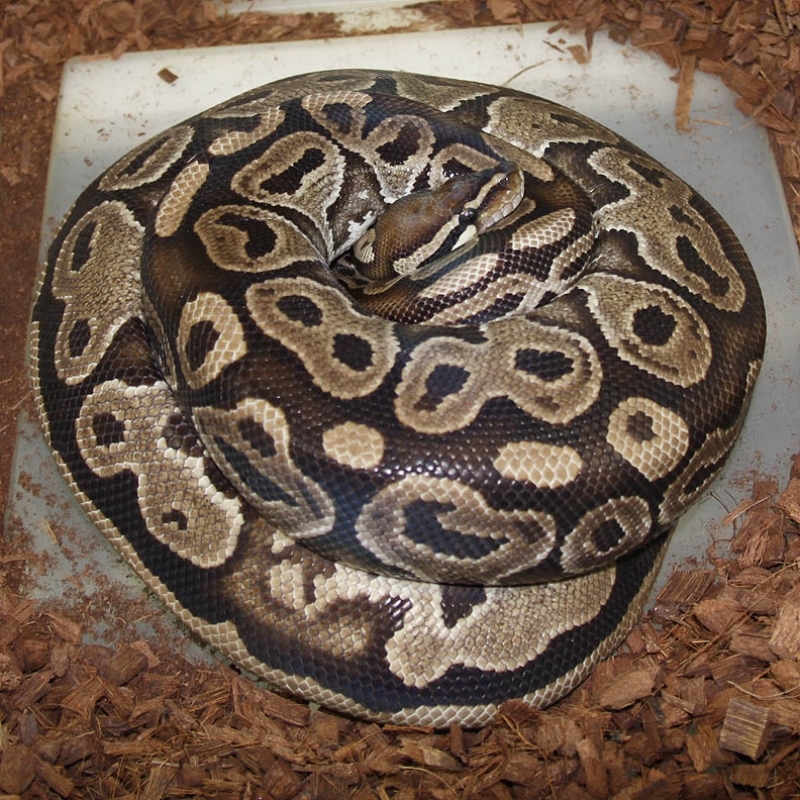 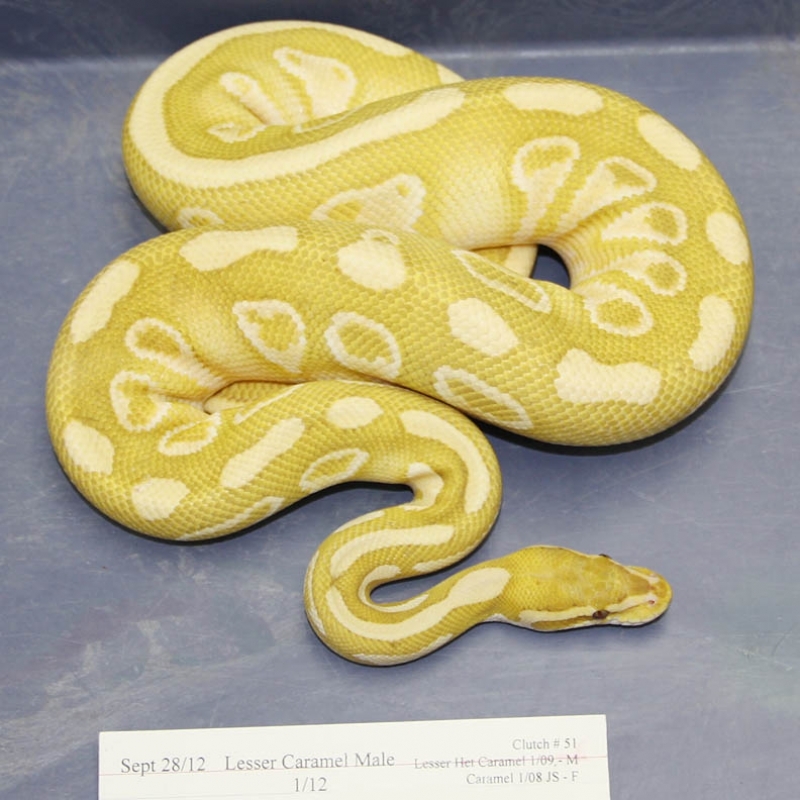 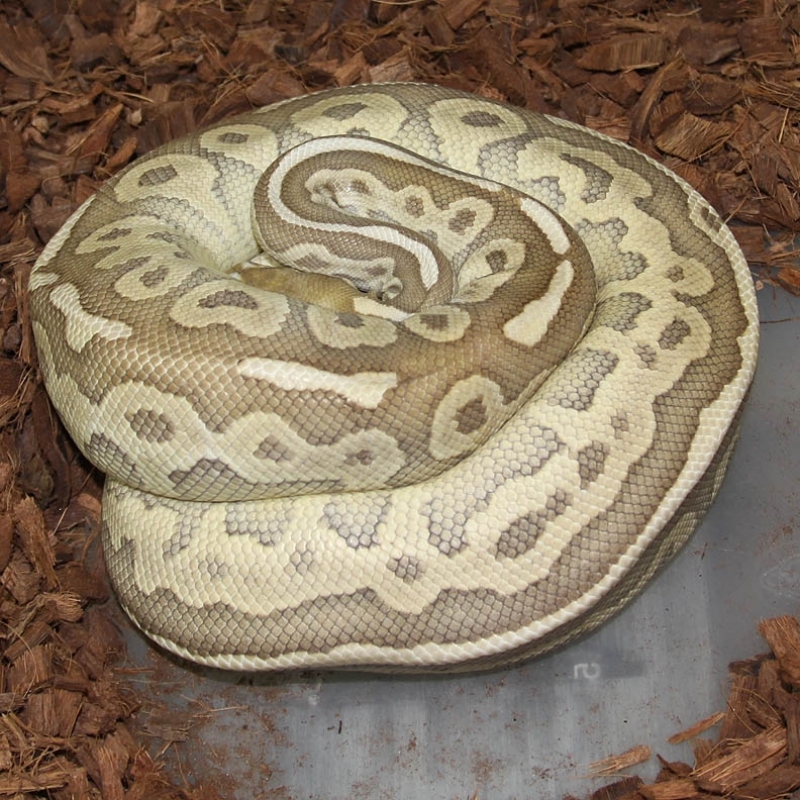 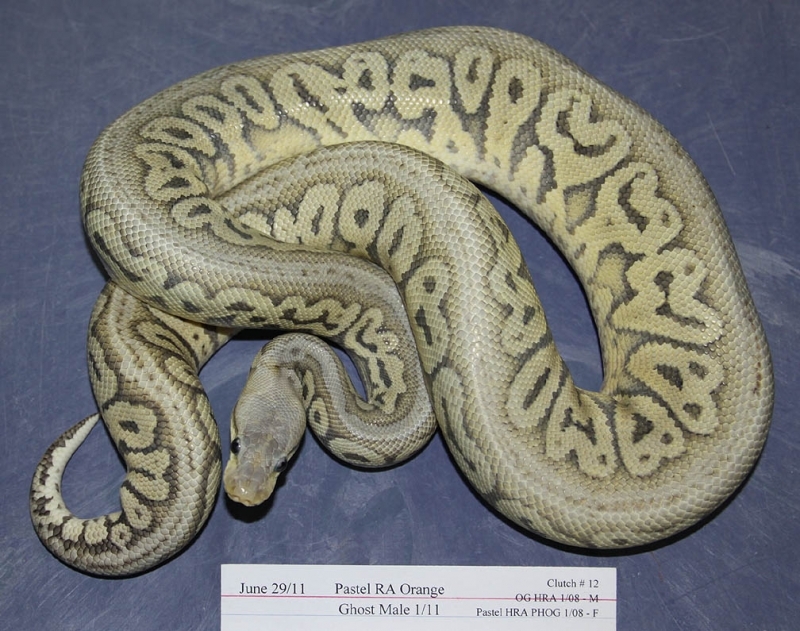 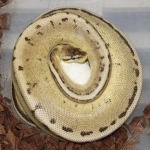 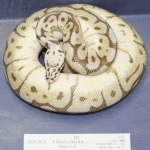 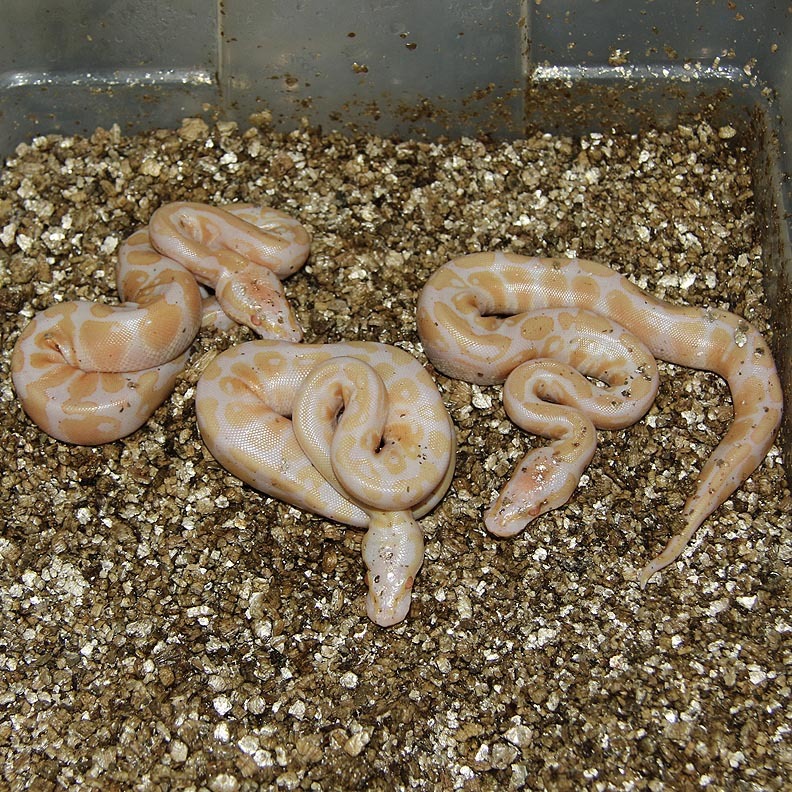 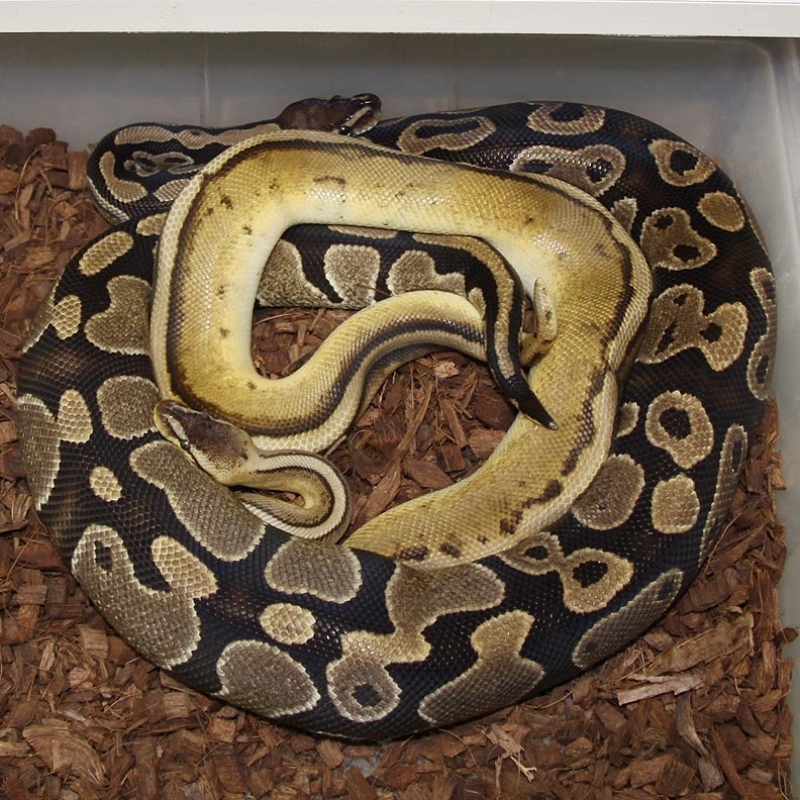 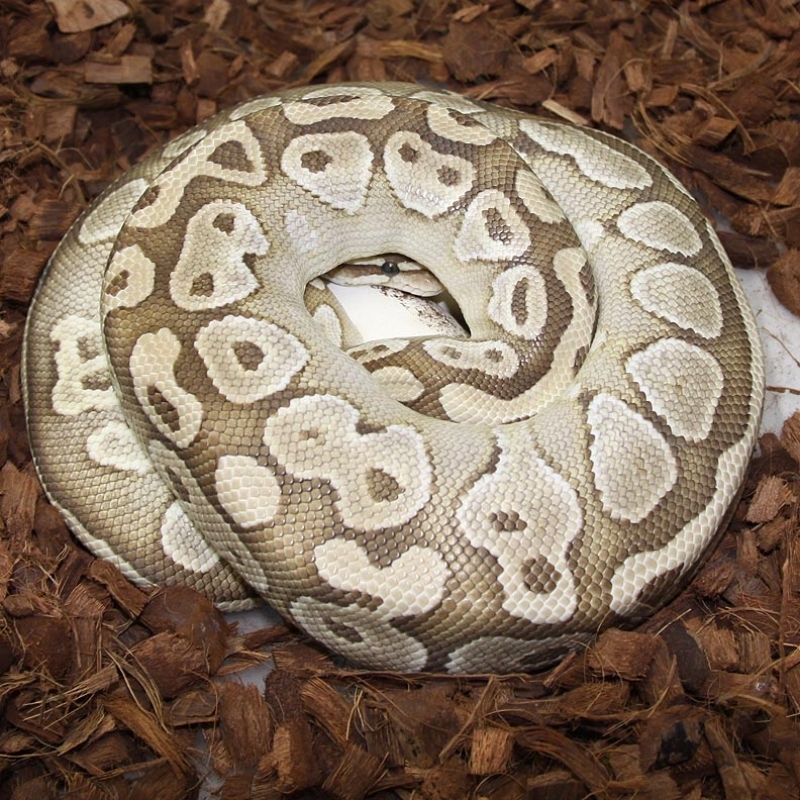 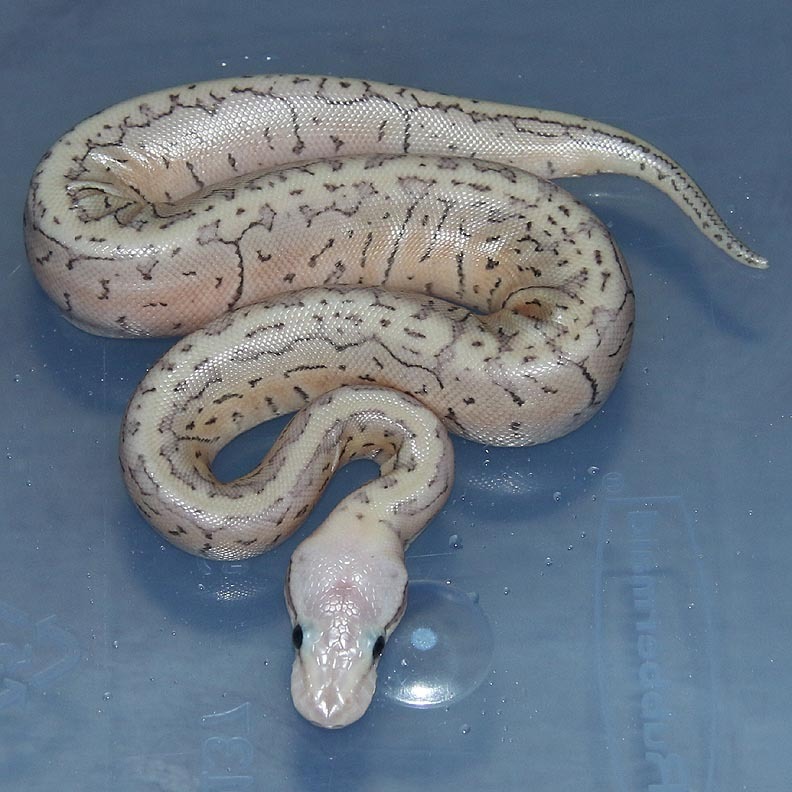 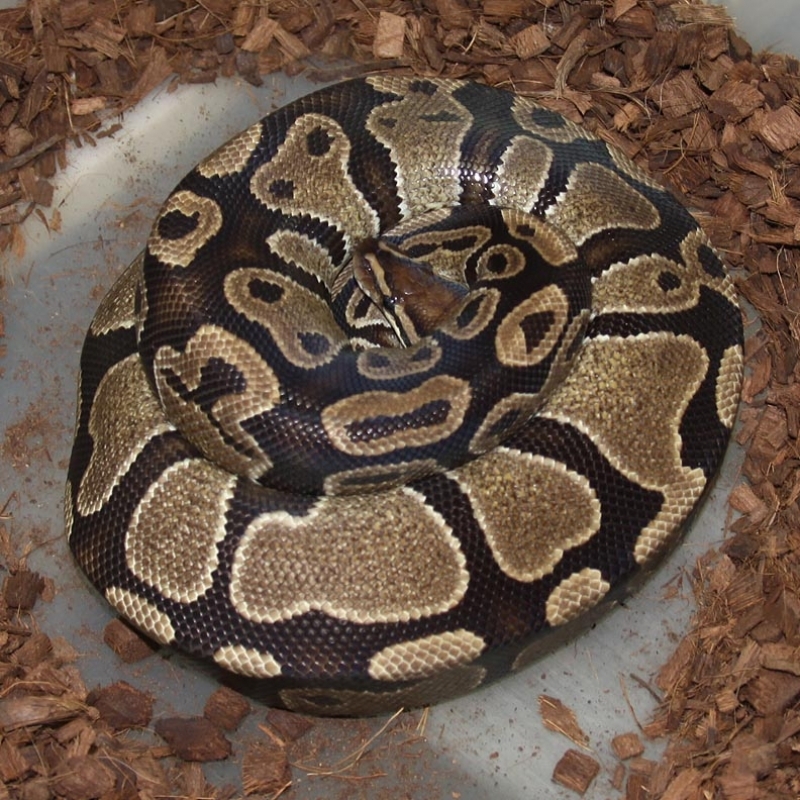 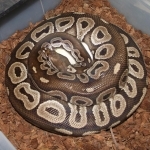 Description: Pastel Champagne Het RA Het Pied 1/13 x Het RA Het Pied 9/10. Description: Pastel Candy 1/12 x Toffino 11/12. This pair was never observed to be breeding. 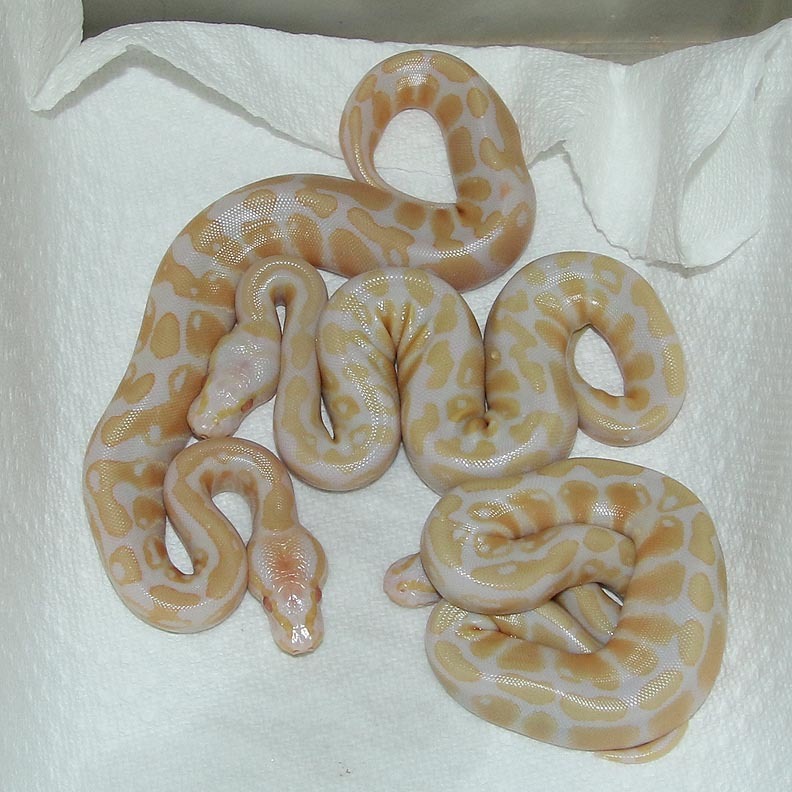 For simplicity I'm calling these guys Toffee/Toffinos. 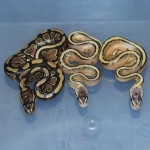 The Candy and Toffee males are brothers (same gene). 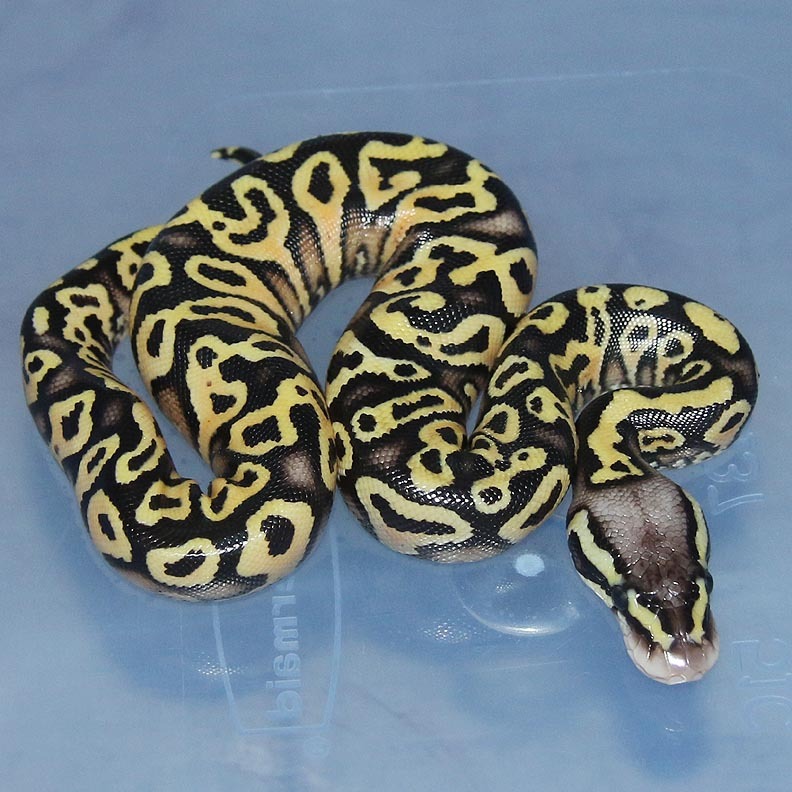 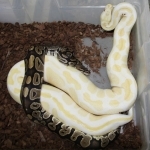 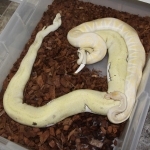 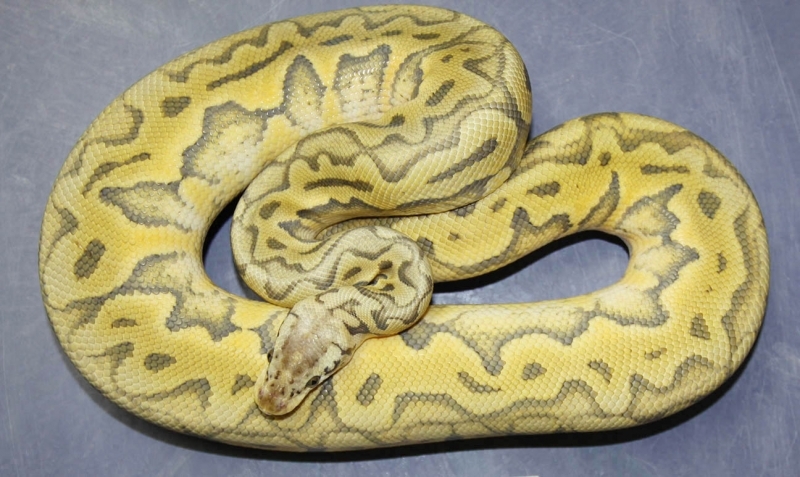 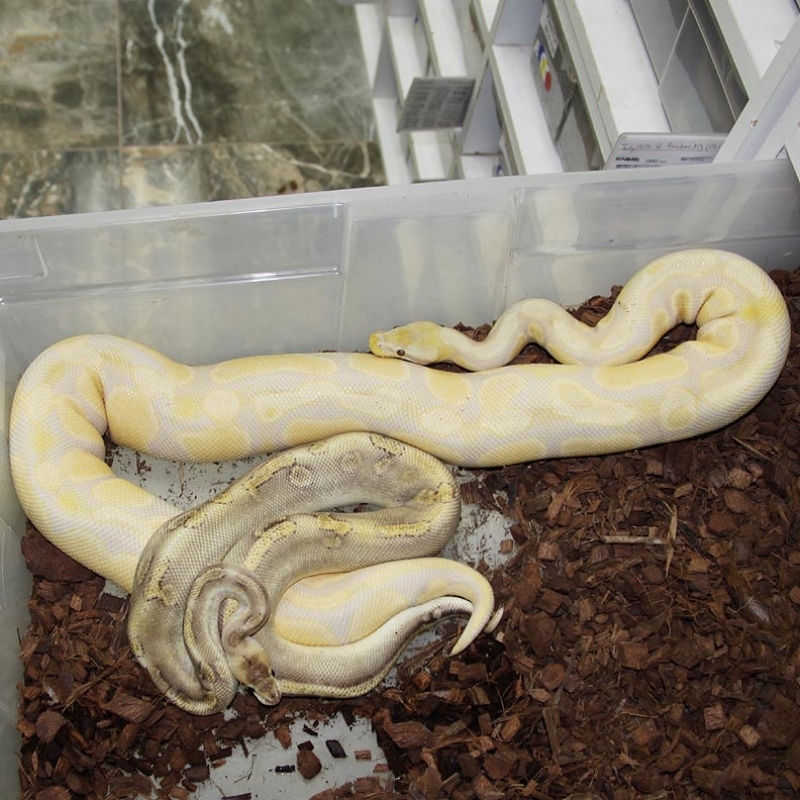 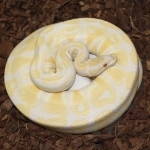 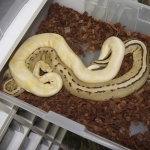 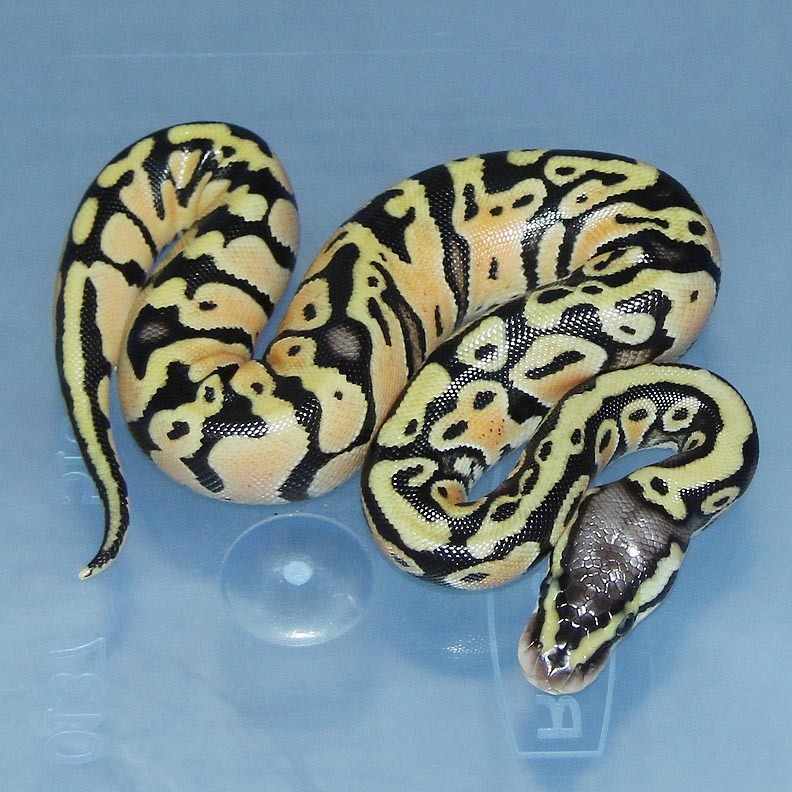 Description: Mutation X Bumble Bee HRA 1/13 x Pastel Lesser HRA 2/10. 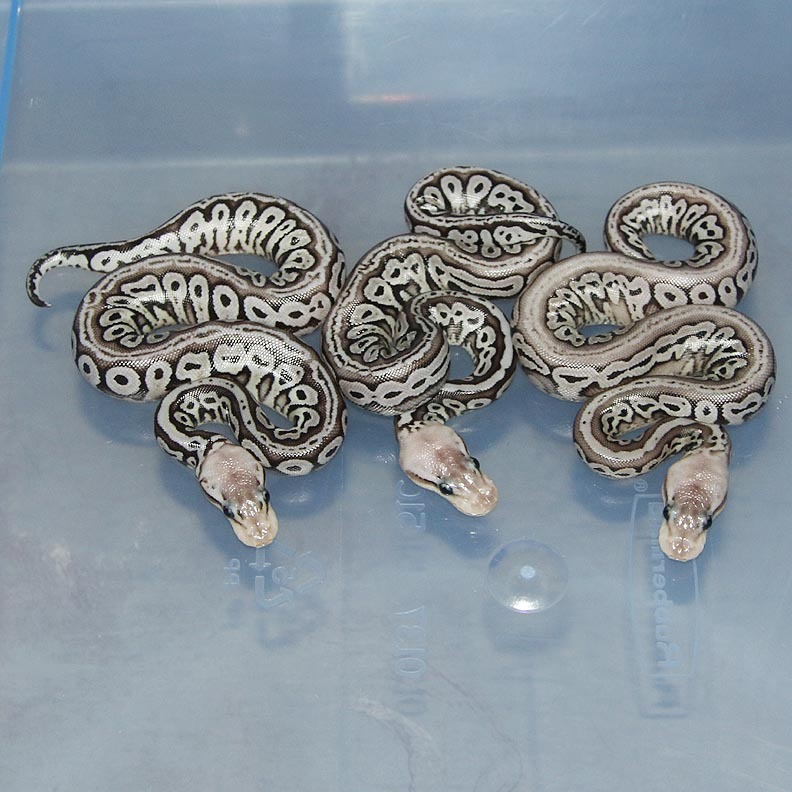 These guys are in shed in these pictures. 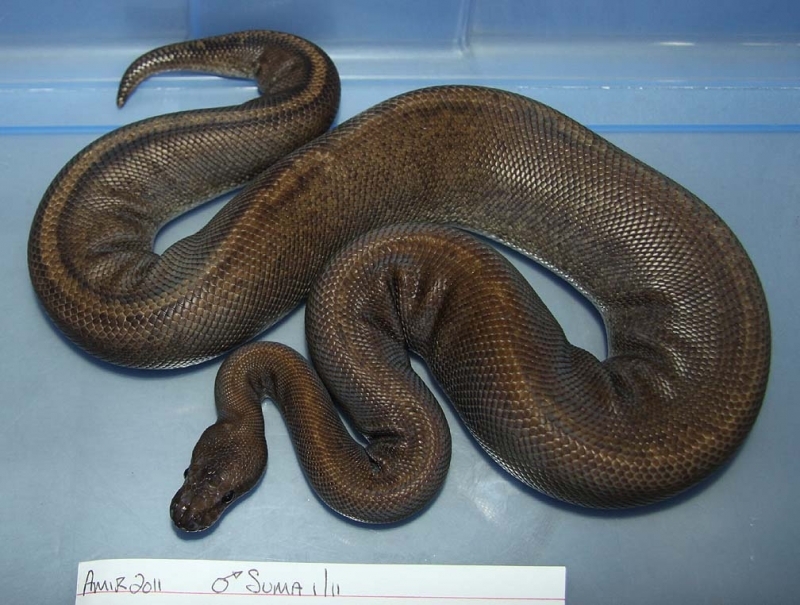 Description: SUMA (Super Mahogany) 1/11 x Lesser Red Axanthic Chocolate 1/13. 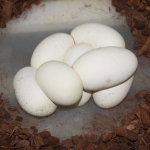 This clutch should help determine if the Chocolates and Mahogany's are allelic or not. 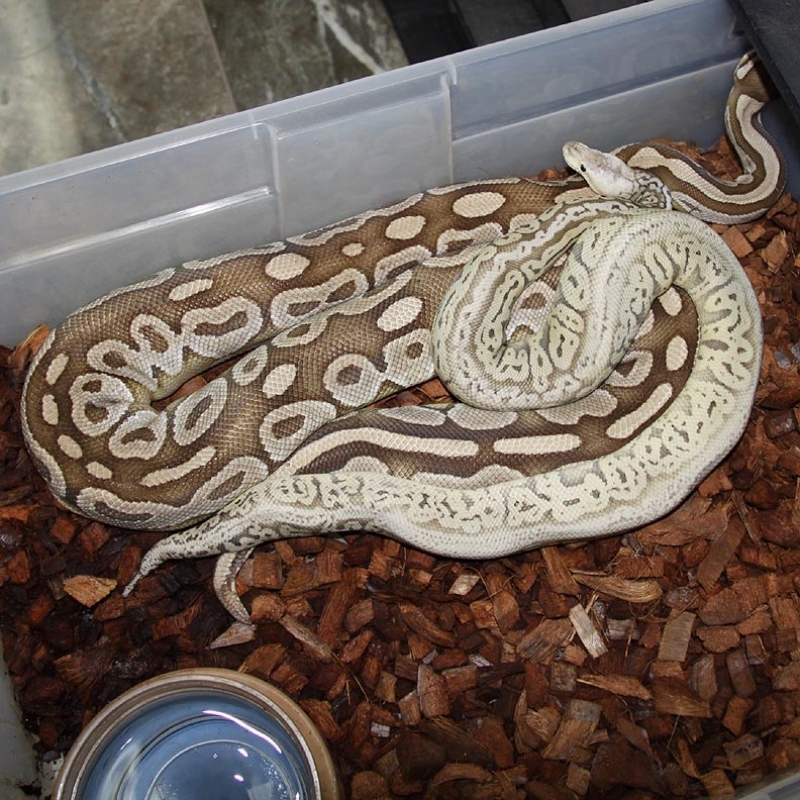 Description: Lesser Red Axanthic Het Green Ghost 1/13 x Pastel Lesser RA Het Green Ghost 1/11. Description: Lemon Blast Orange Ghost HRA 1/13 x Lesser HOG 1/06. 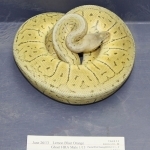 Description: Lemon Blast Orange Ghost HRA 1/13 x Lesser HOG 2/06. 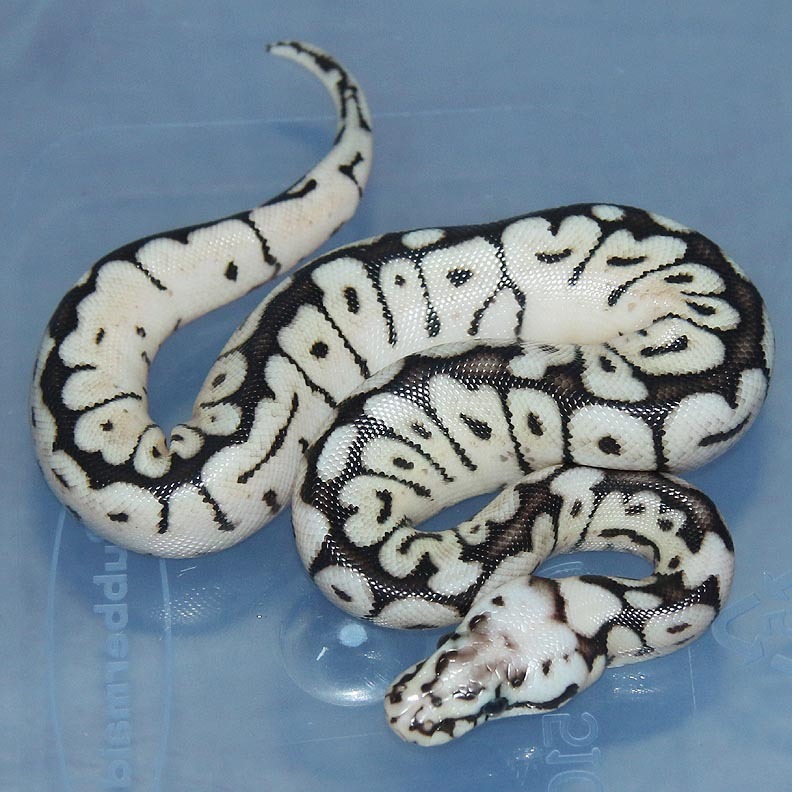 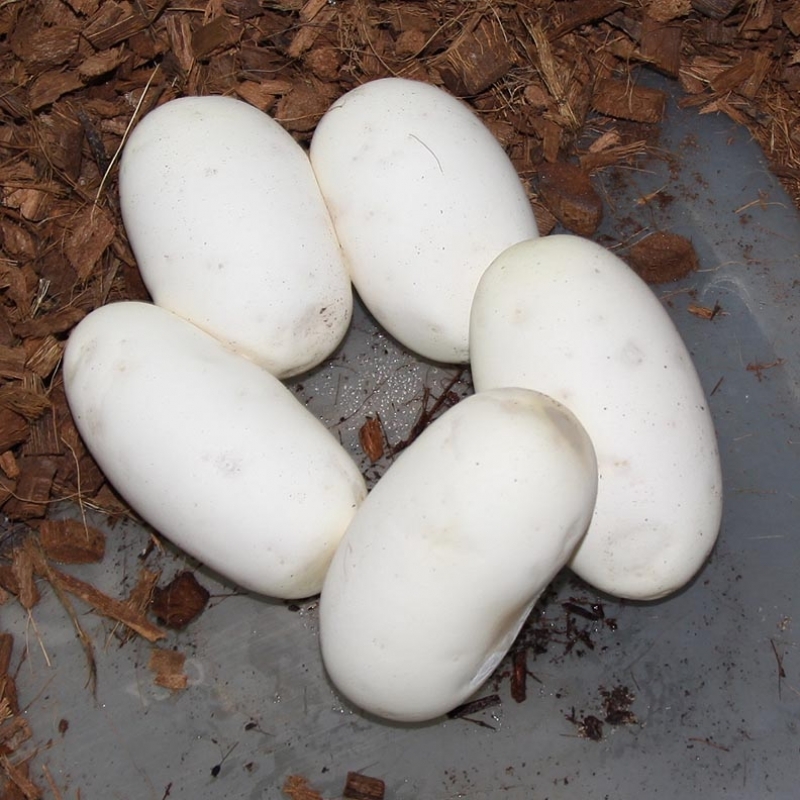 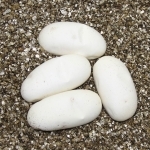 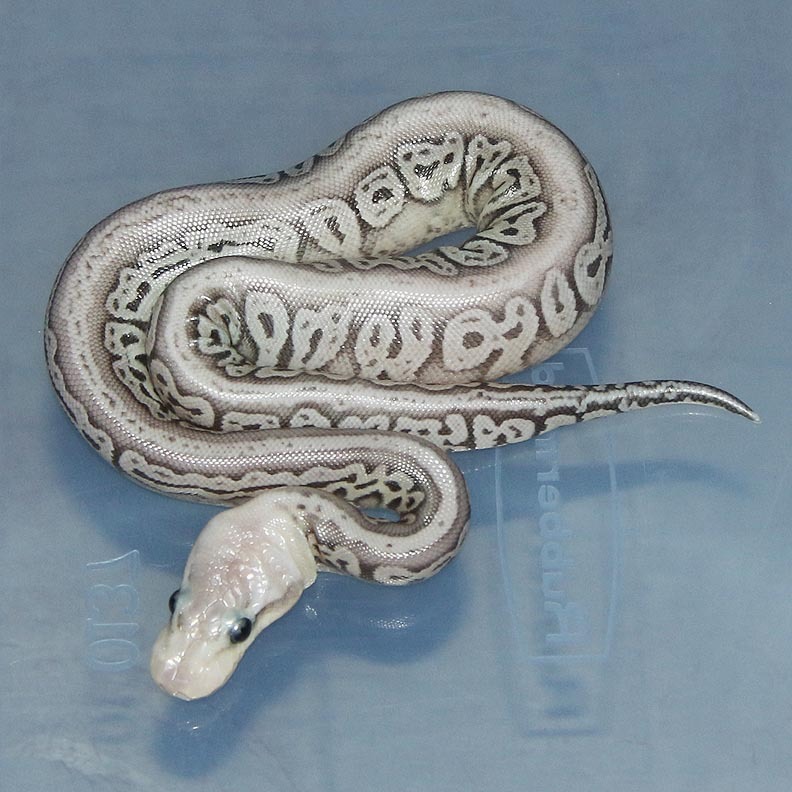 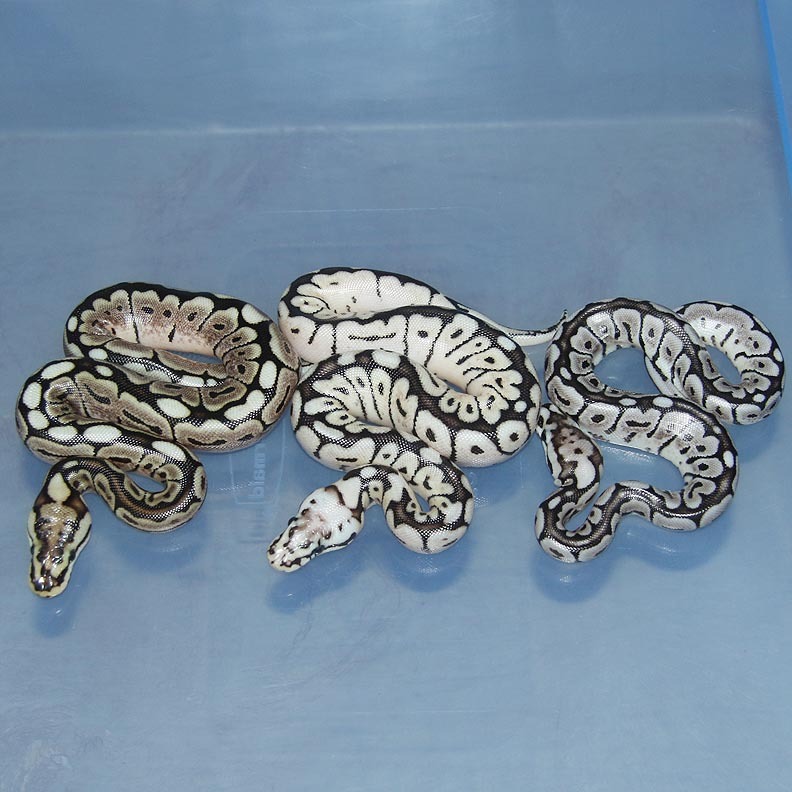 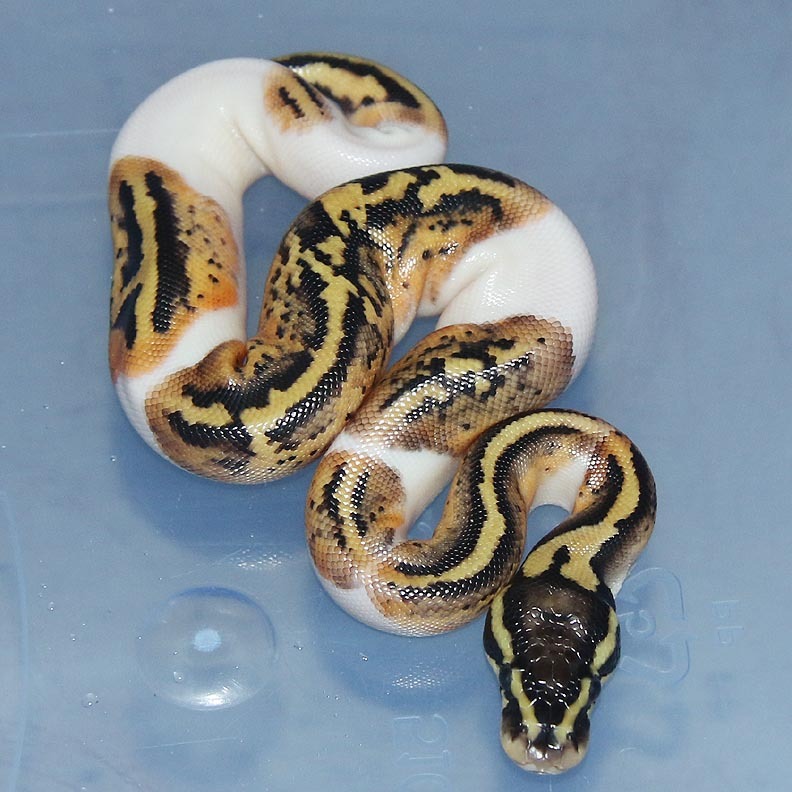 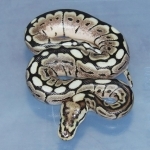 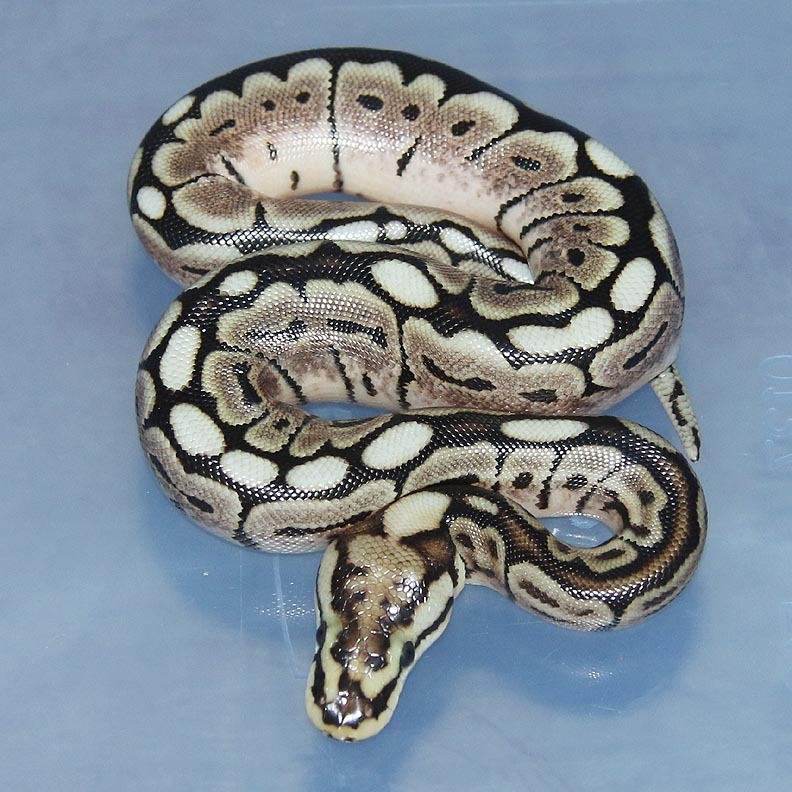 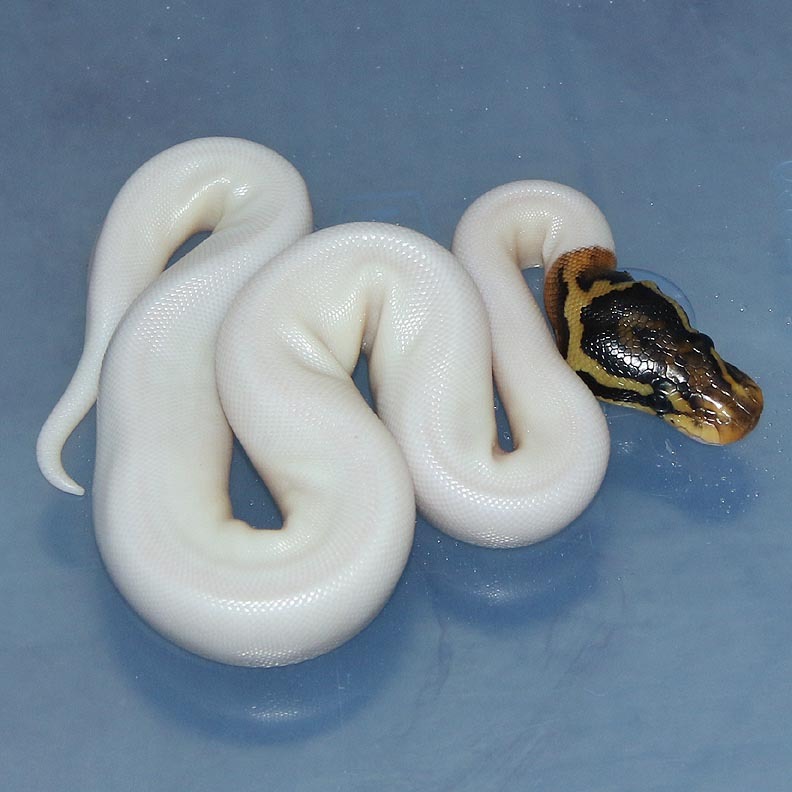 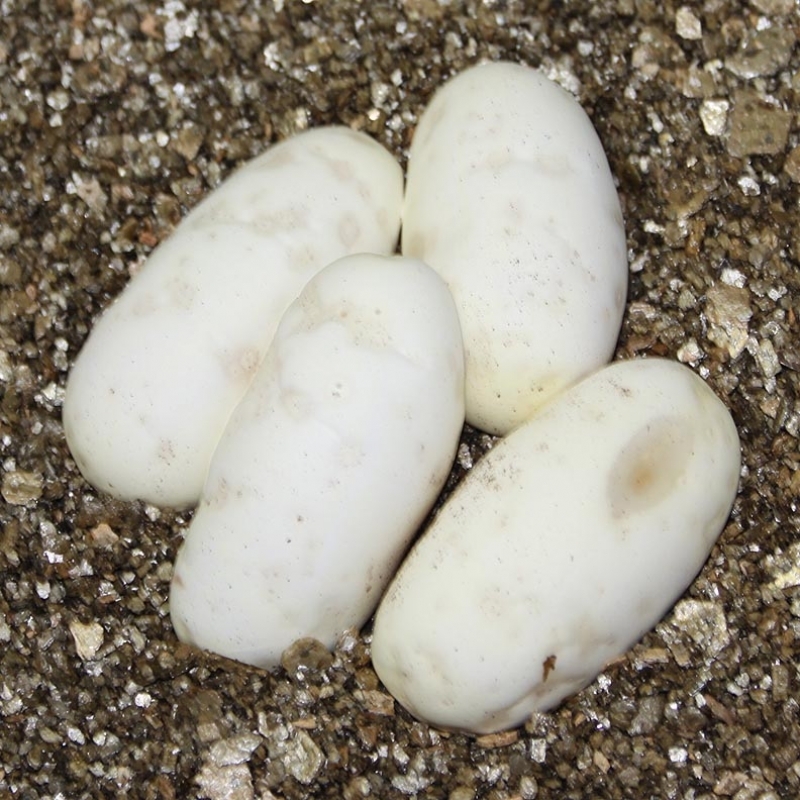 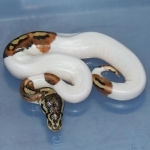 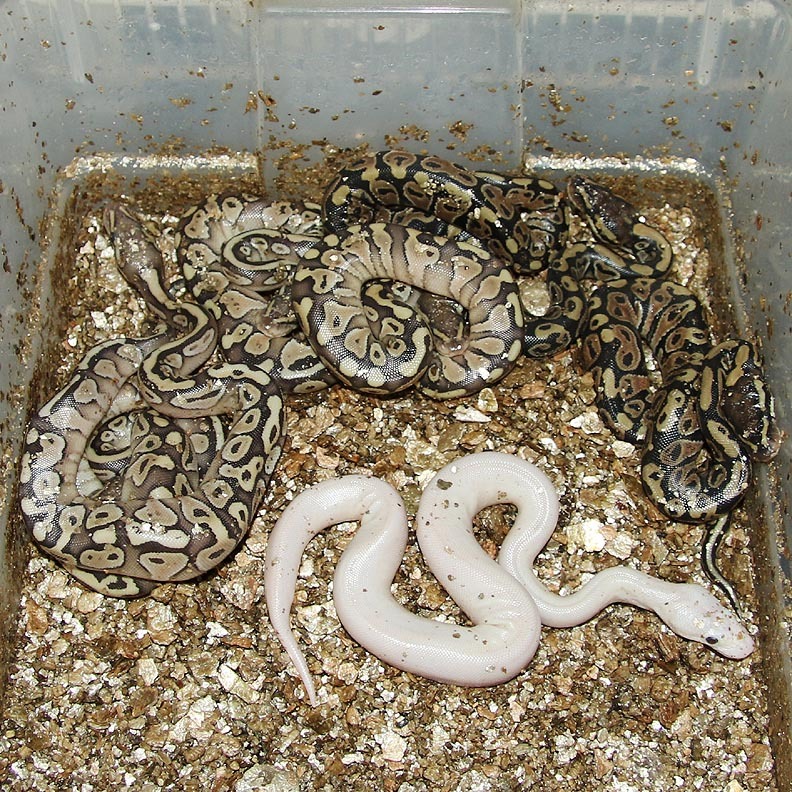 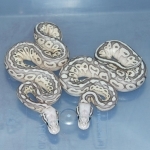 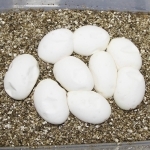 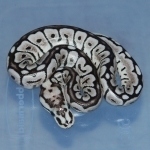 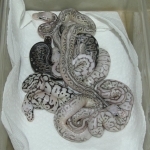 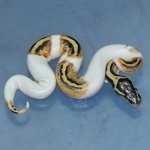 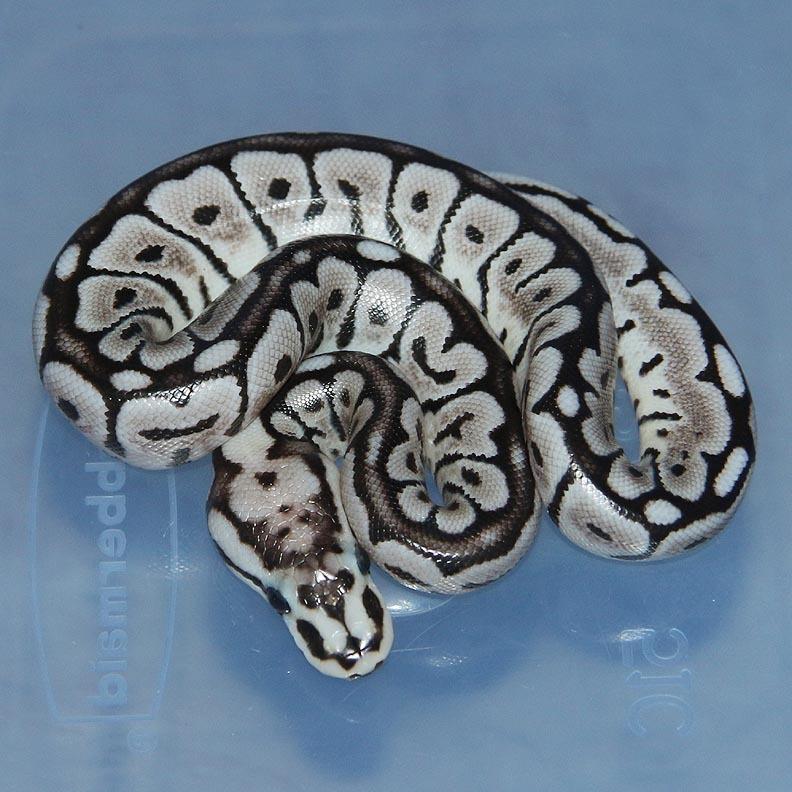 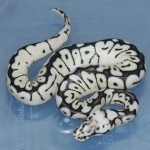 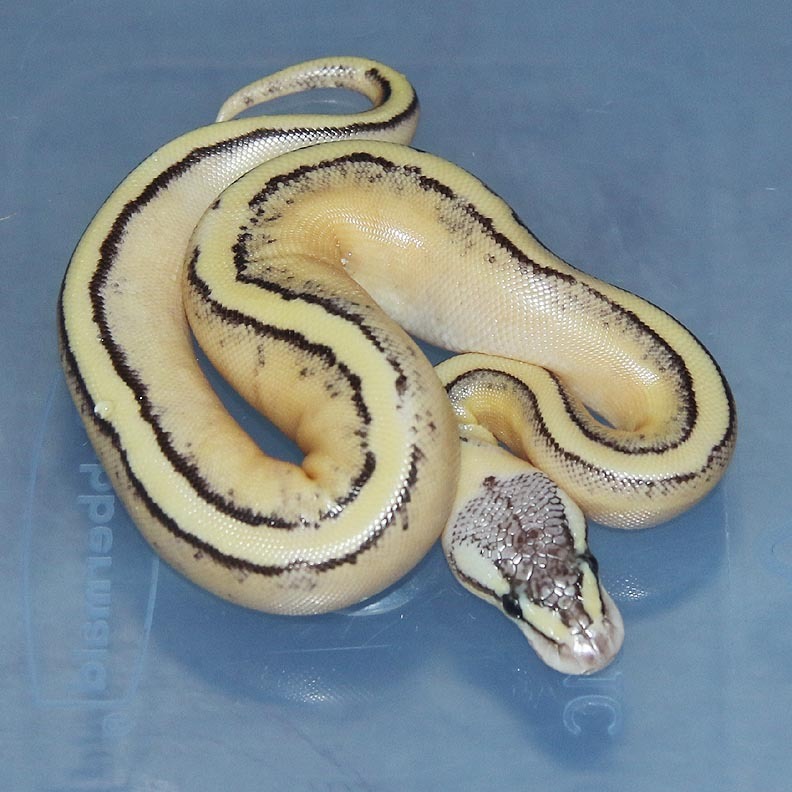 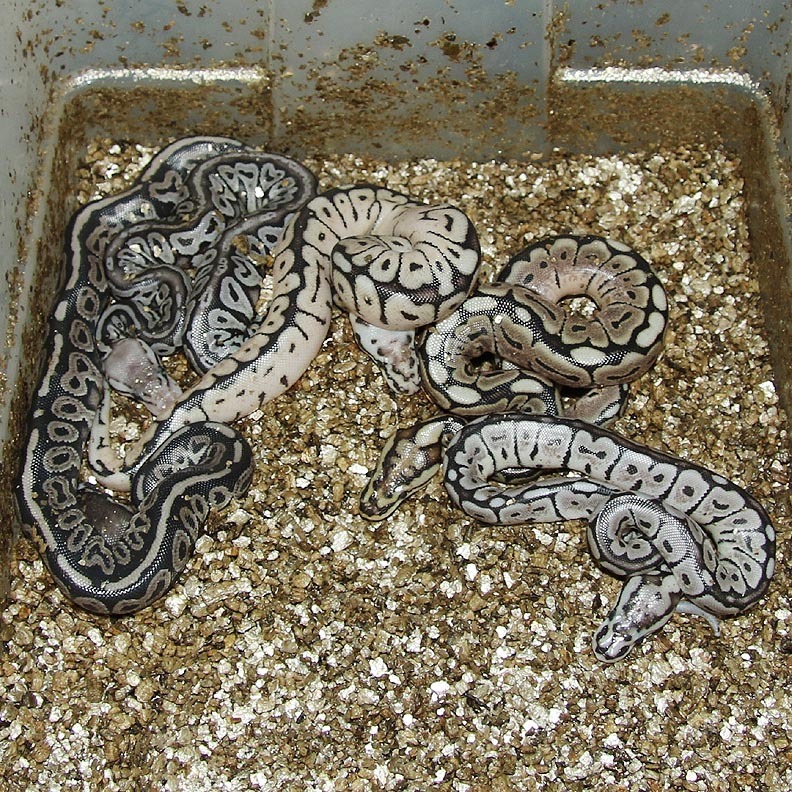 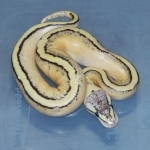 Description: Pastel Pied 1/12 x Het RA Het Pied 4/10. 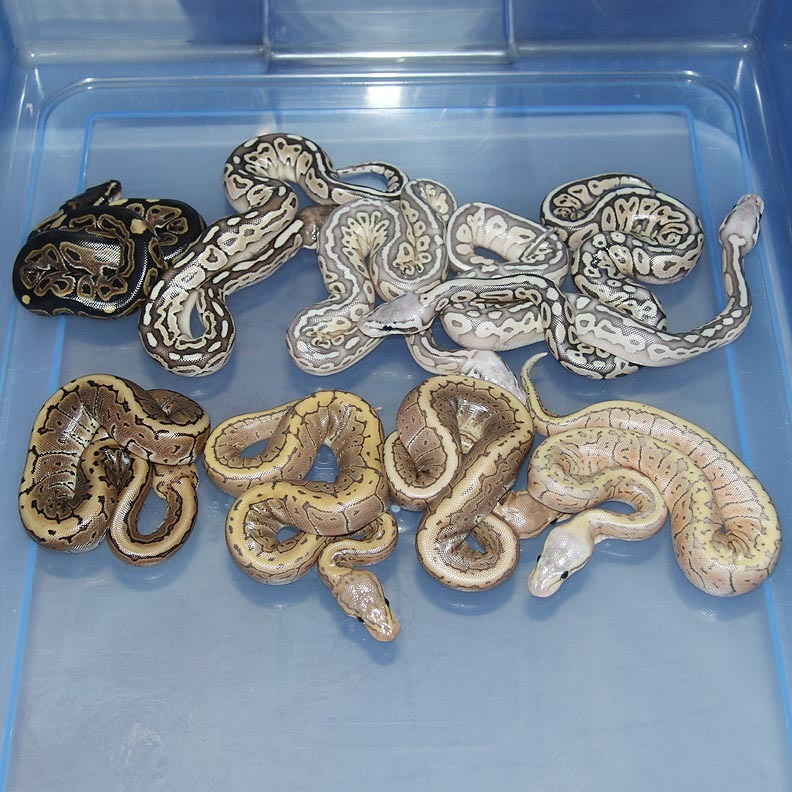 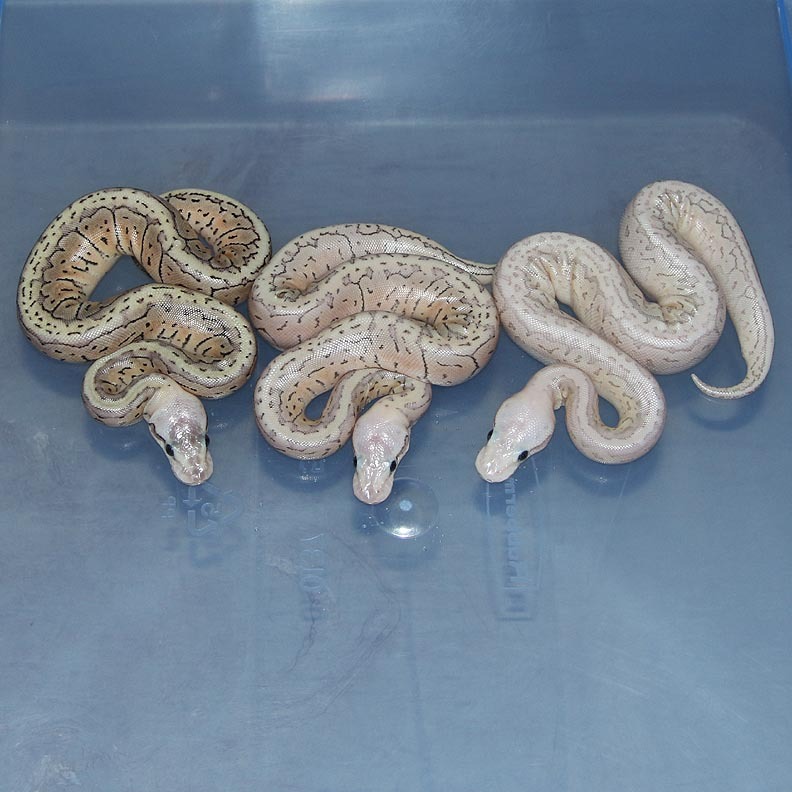 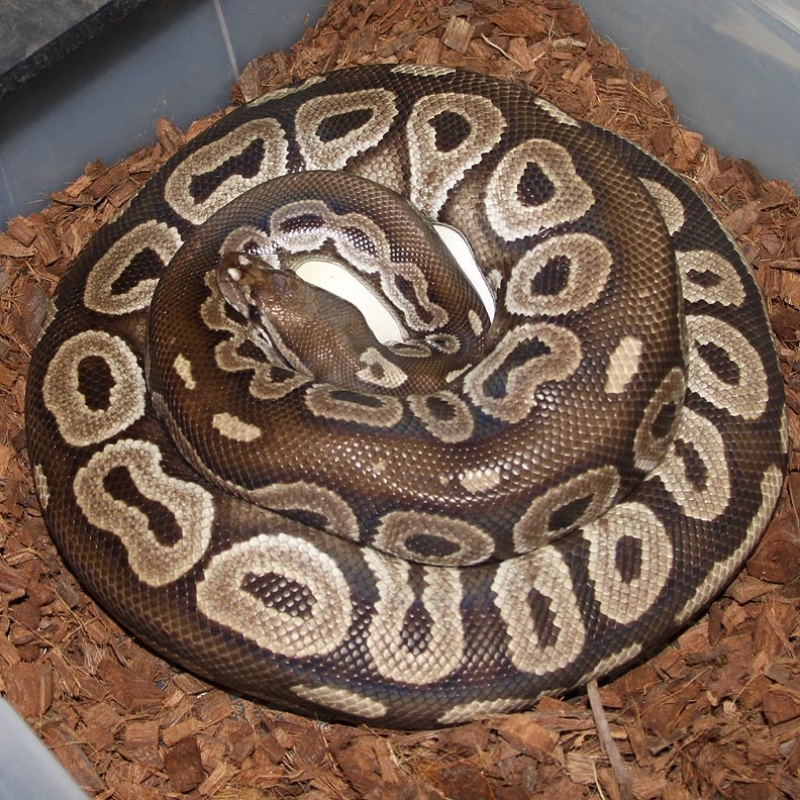 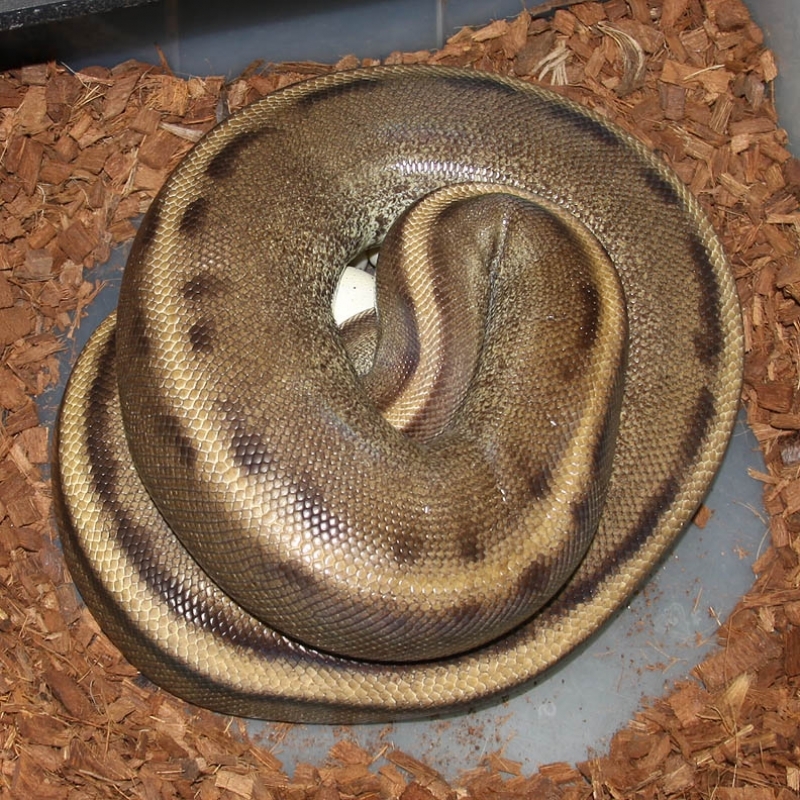 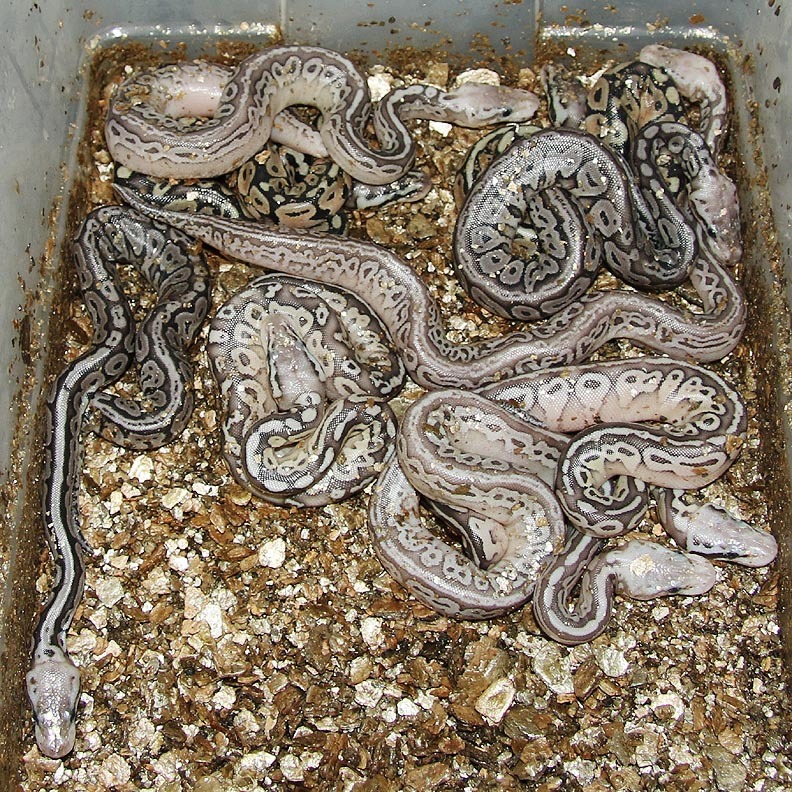 Description: Pastel Lesser Het RA Het Lavender PHGS 1/12 x Het RA Het Lavender 3/11. 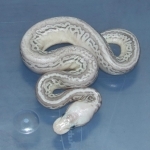 Description: Pastel Lesser DH Green Ghost/Genetic Stripe 1/11 x Pastel Lesser DH Green Ghost/Genetic Stripe 1/10. 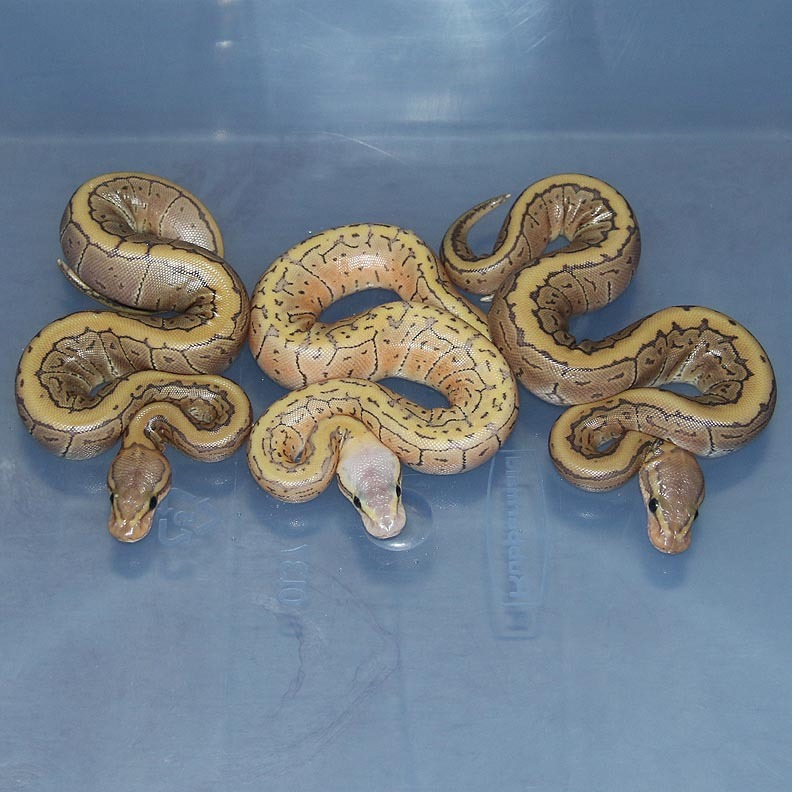 Description: Lavender Het Red Axanthic 3/13 x Pastel Red Axanthic Pinstripe Champagne 1/12. I'm not 100% exactly sure what these guys are. 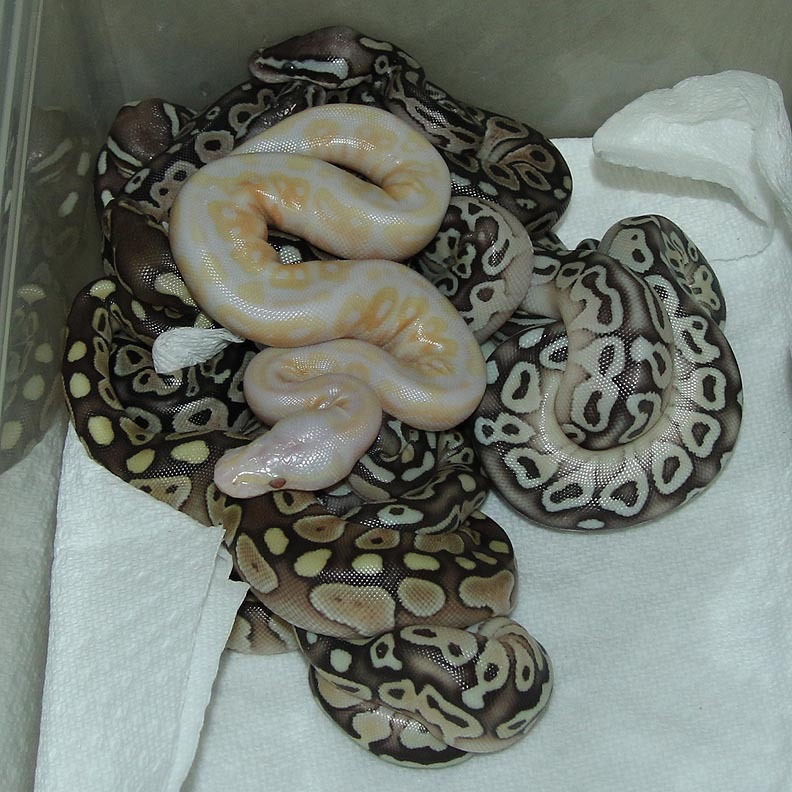 They are for sure Pastel Champagne HRA's Het Lavender (very minimum). 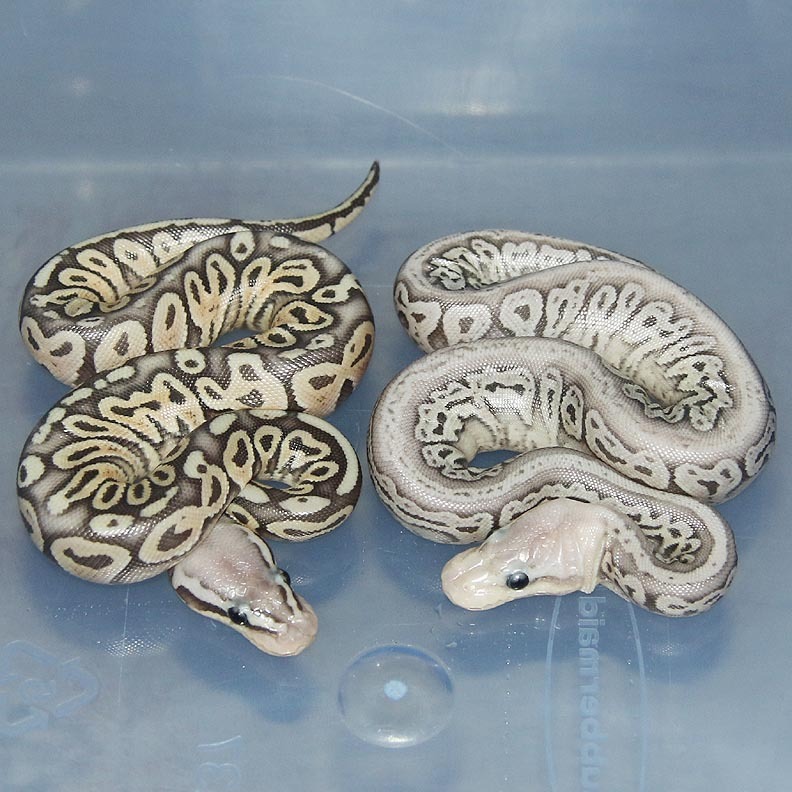 I'll have to wait about a month or so until I know more about them. 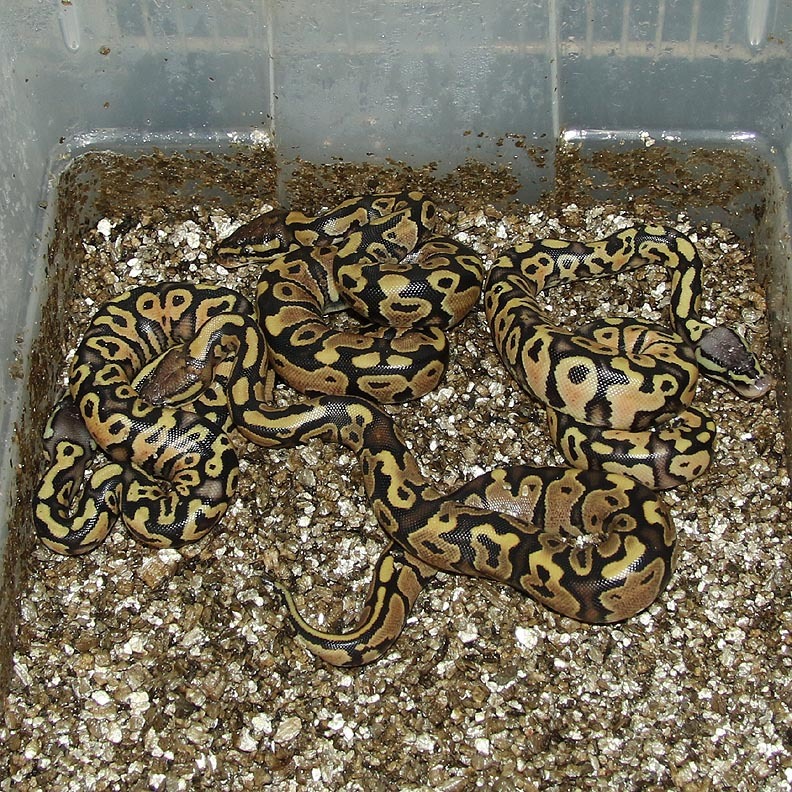 I'm keeping a pair and selling 2 males from this clutch. 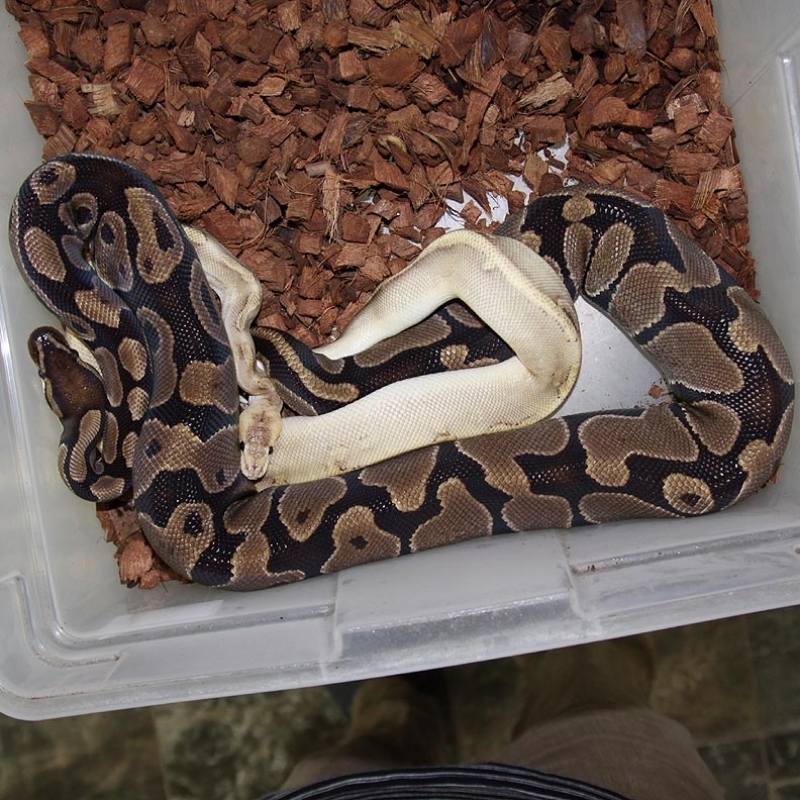 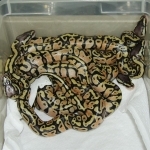 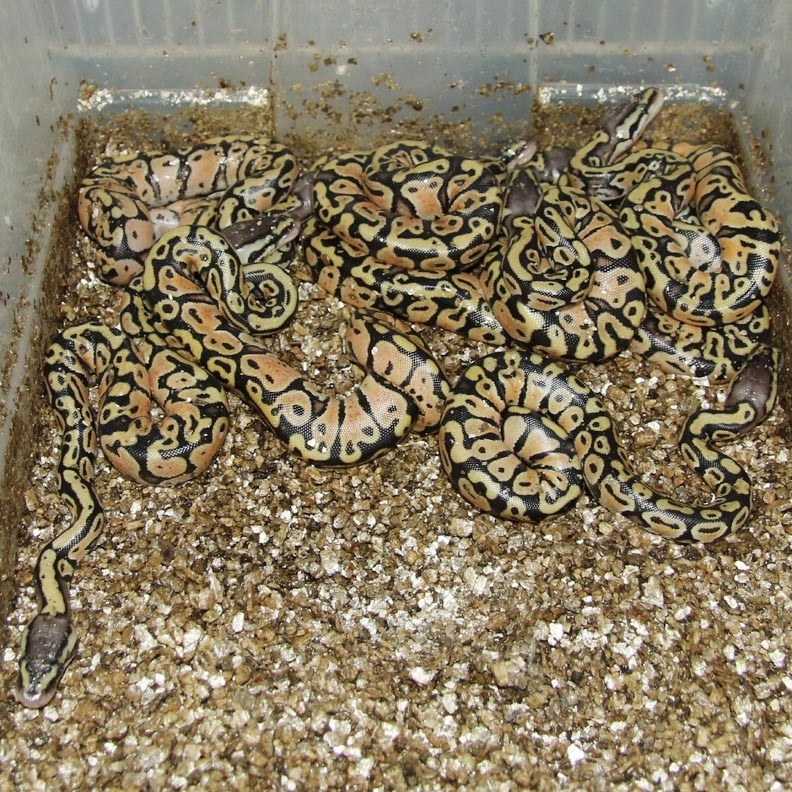 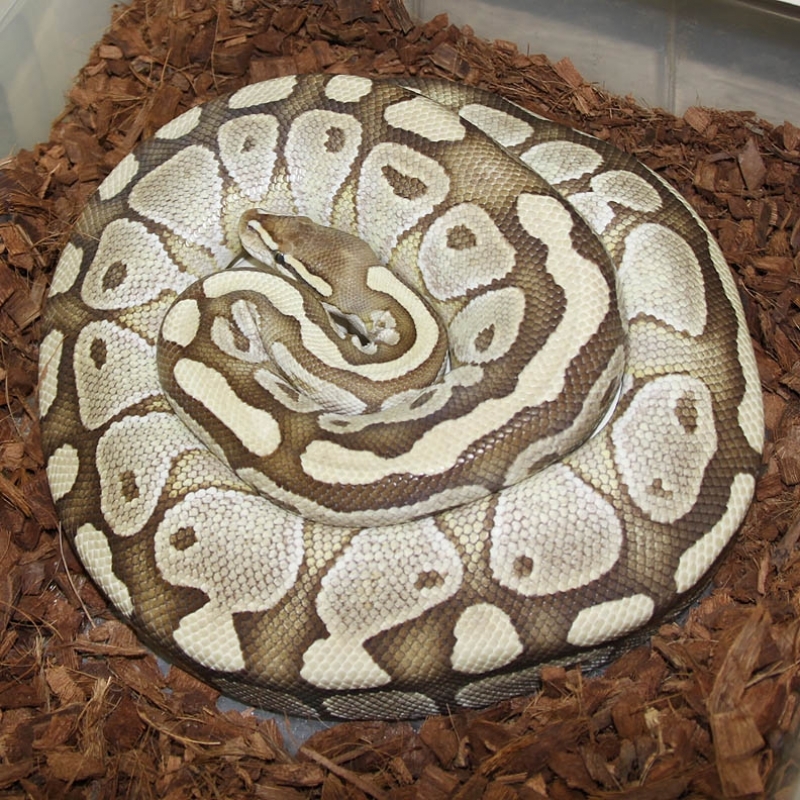 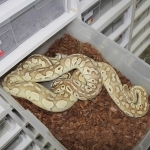 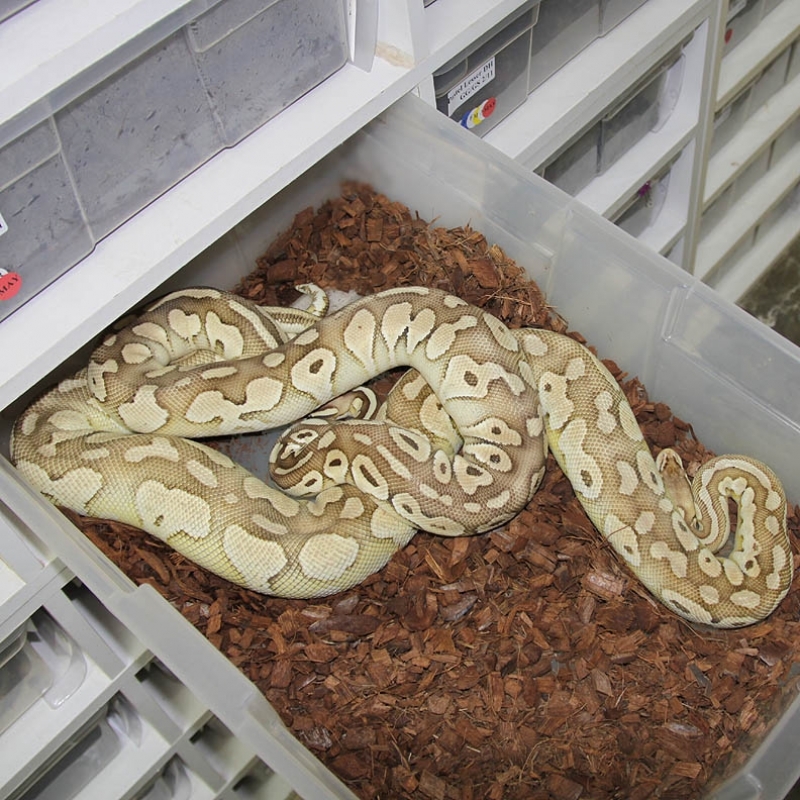 Description: Super Pastel Red Axanthic Dot Matrix 1/13 x Lesser Het RA 1/06. 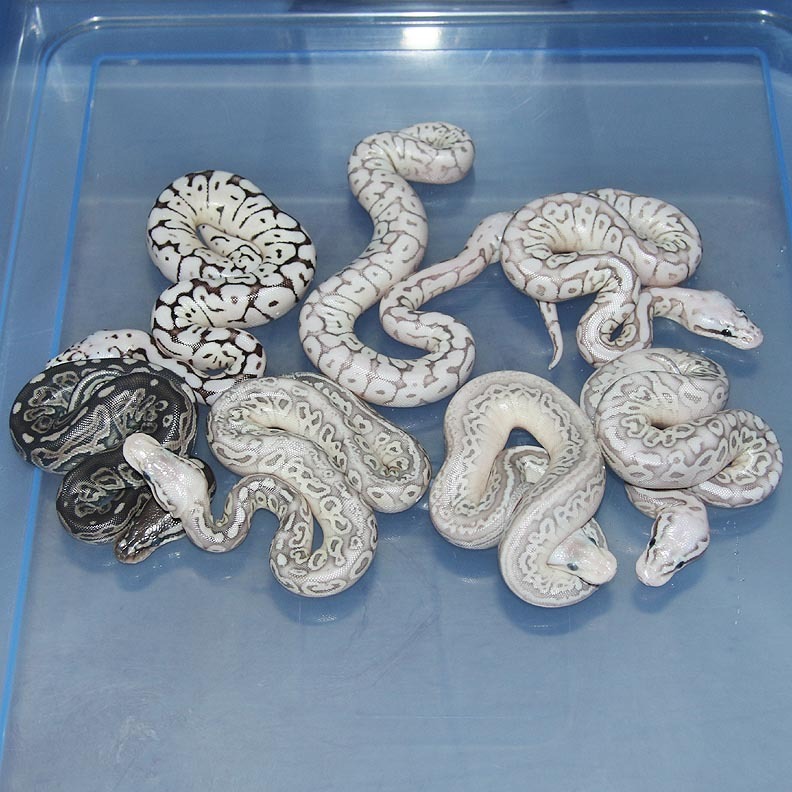 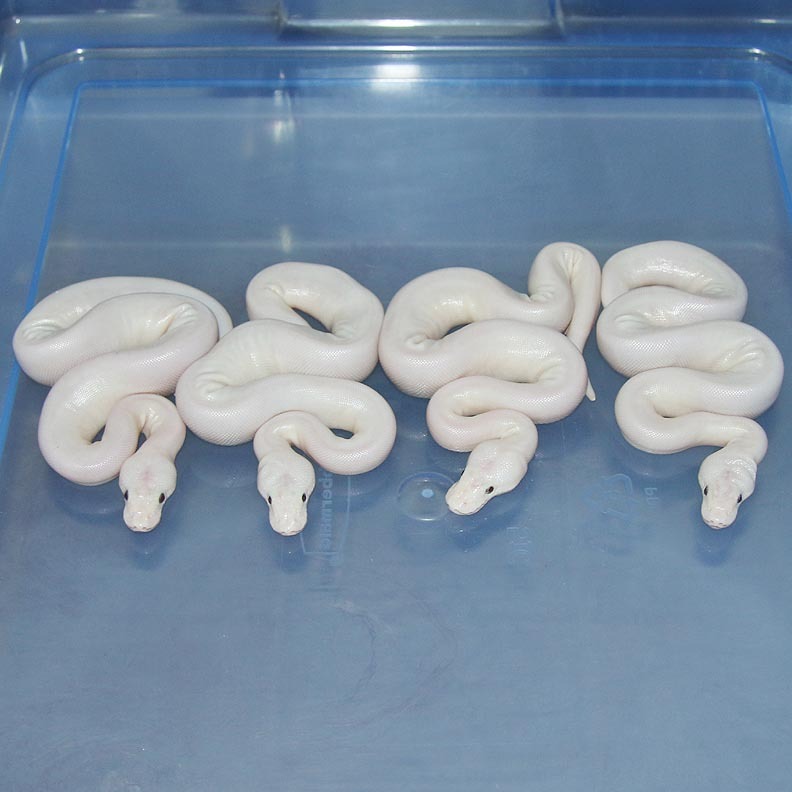 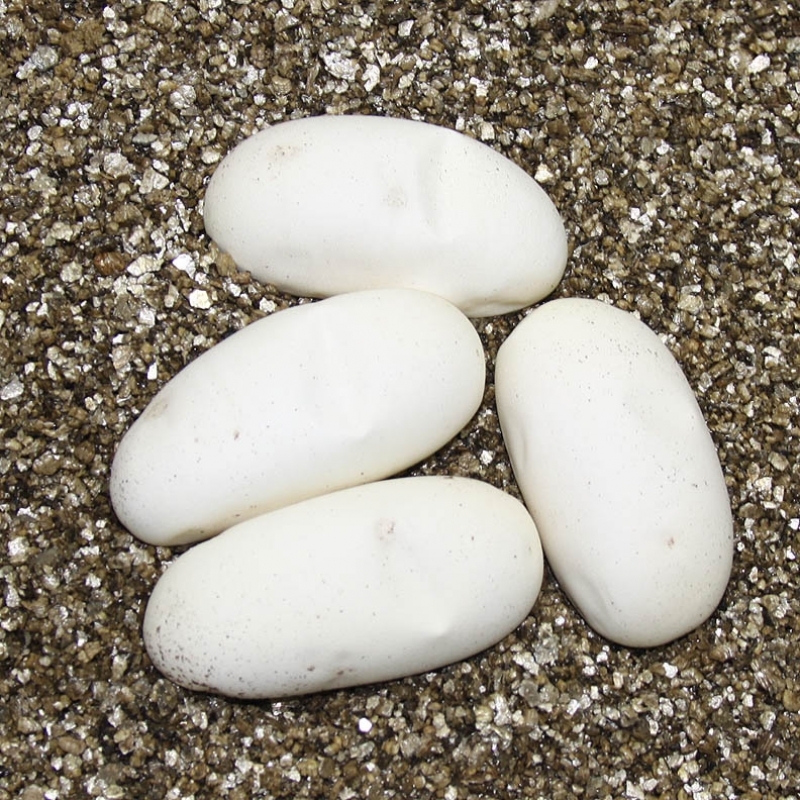 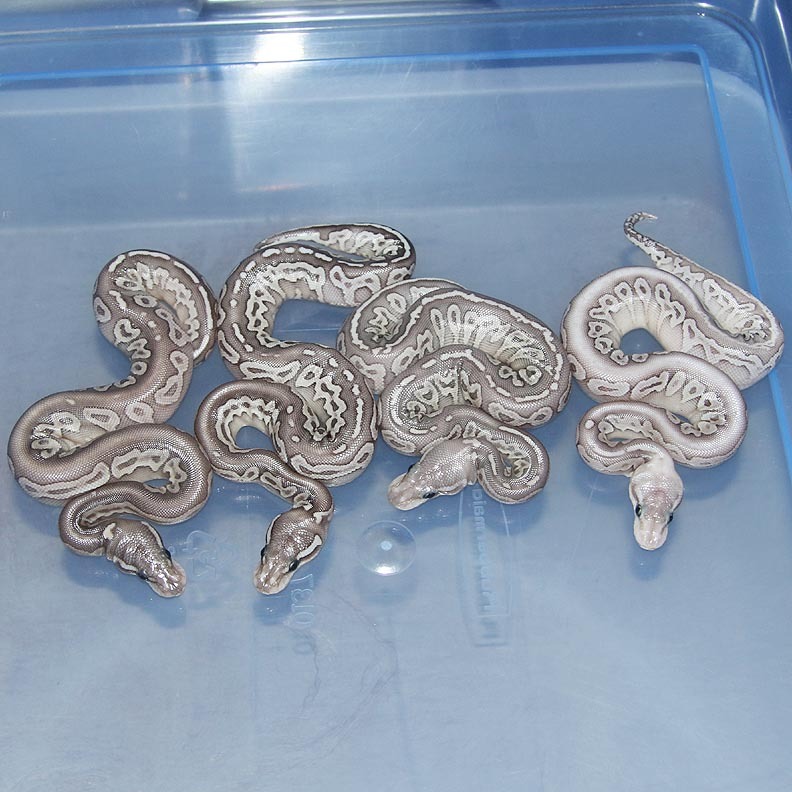 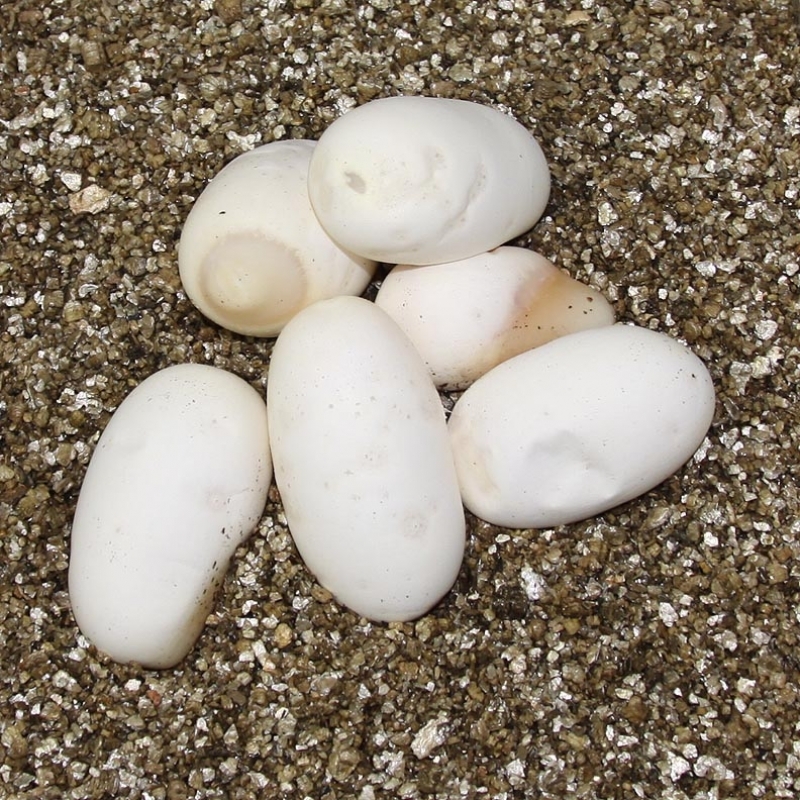 Some of the Pastel Lesser Red Axanthics are most likely Dot Matrix animals. Description: Pastel Genetic Stripe Het Lavender 2/13 x Het Lavender PHGS 1/12. 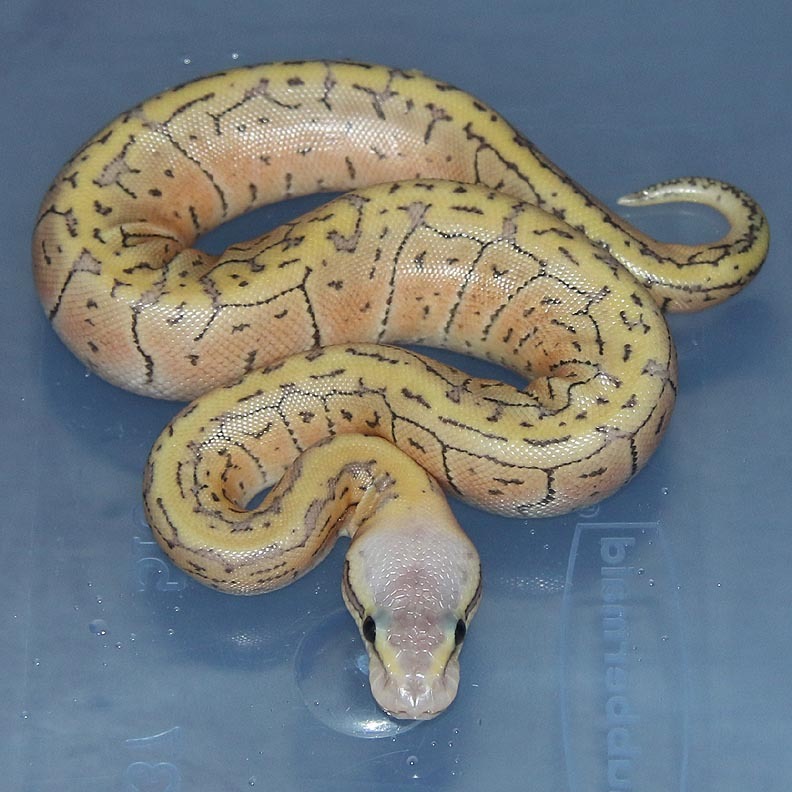 Description: Pastel Lavender Het Genetic Stripe 1/10 RDR x Pastel Genetic Stripe Het Lavender 1/13. 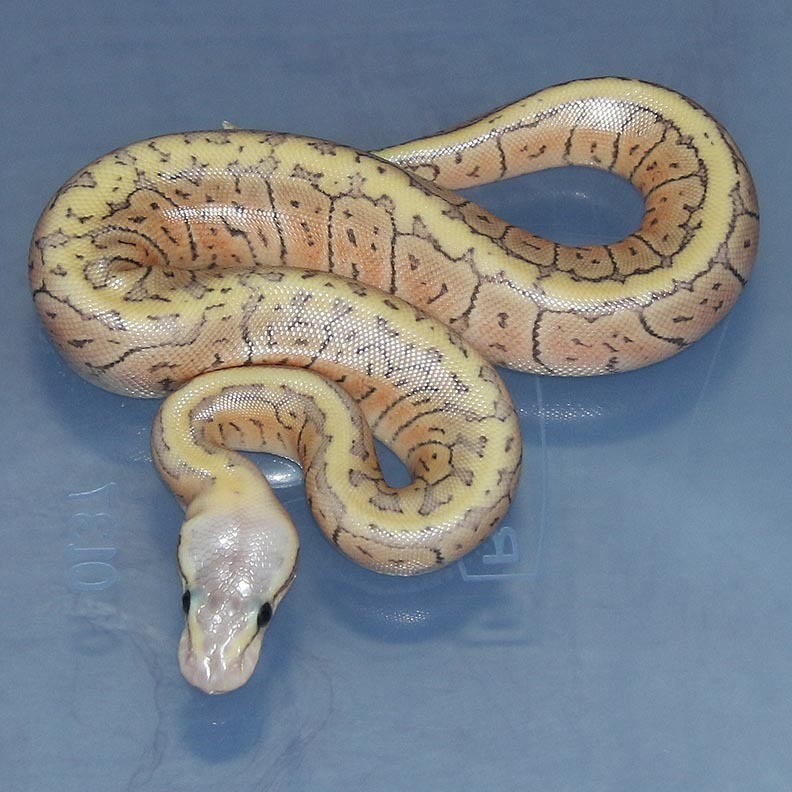 I love Lavender Genetic Stripes and now I finally have my Pastel! Description: Citrus Puma 2/11 x Genetic Stripe 1/10.